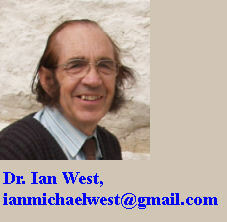 West, Ian M. 2019. Petroleum geology of the south of England. http://www.southampton.ac.uk/~imw/Oil-South-of-England.htm. Version: 8th April 2019. ..| Home and List of Webpages |The Petroleum Geology of the Portland - Isle of Wight Offshore Basin |Petroleum Geology of the Western Weald and South Downs (Shale Oil etc.) |Bibliography of Petroleum Geology of Southern England |Kimmeridge Bay | Kimmeridge - Oil Shale |Kimmeridge Bibliography. |Lyme Regis |West Bay, Bridport| Osmington - Oil Sand | Durlston Head Geology. |Stair Hole, Lulworth |Poxwell Quarry. 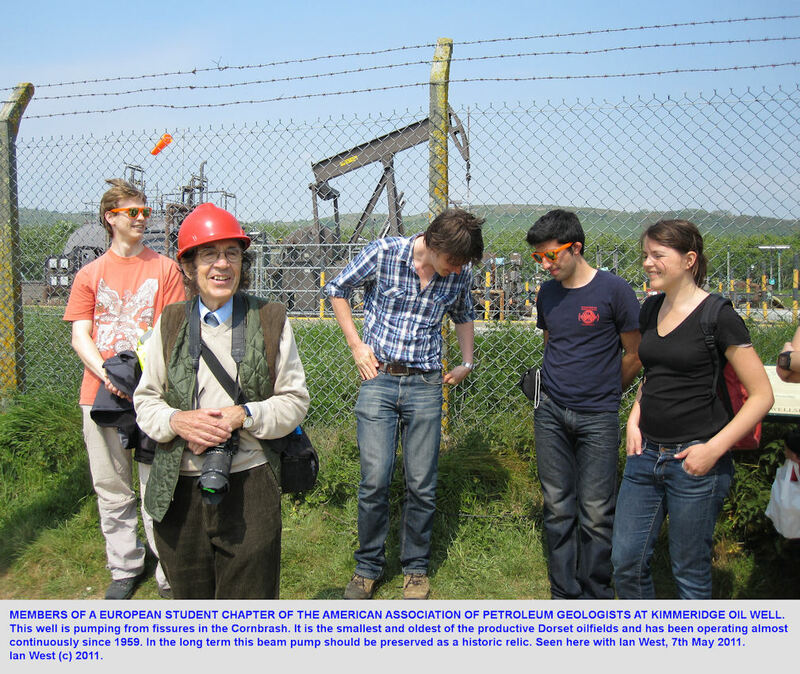 Bibliography of Petroleum Geology of the South of England. The Romsey Borehole, Hoe No. 1 - click here some details. The diagram above is intended to be introductory for the benefit of those not familiar with the local stratigraphy. It is very simplified and not accurately to scale. However, it shows the general positions of the important stratigraphical units. 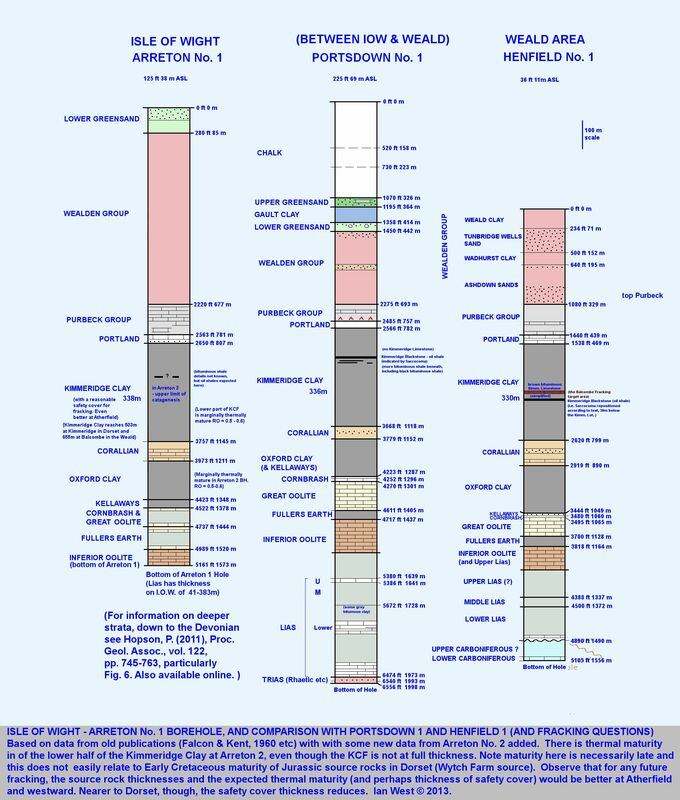 More detail is provided in other associated webpages with regard to details of parts of the stratigraphical column. Further information will also be given below, in due course. The above map, modified and redrawn after a large part of a map by (Westhead, McCarthy, Collier and Sanderson (2018) places the area in a broader and a tectonic perspective, and includes new data and interpretation. It clearly shows, on a small scale and in a necessarily simplified manner, the fault pattern of the area of interest and, in particular, with information on fault ages. There is a classification into Variscan, Cimmerian and Alpine-reactivated faults. [note that on old maps the age classification is not generally shown and, in case, in the past most, at places like Lulworth Cove, were just regarded as "Alpine".] This map above is inevitably simplified in places because of the small scale, but it it very good and it probably gives a more realistic perspective of the fault-pattern history of the area. It is good because it enables the reader to get an idea of the four-dimensional perspective. It is shown in two dimensions but can to some extent be interpreted into three dimensions, and. furthermore, it includes the fourth dimension time - Variscan, Cimmerian and Alpine-Reactivated. Burial Diagenesis and Heating at Depth in the Wessex and Weald Basins - a simplified diagram. 3. Fermentation Zone - no more sulphide, now the strata ferment like beer, producing gas. 4. Decarboxylation Zone - no more fermentation as the strata heat up. 5. Hydrocarbon Formation - hot strata - the waxy brown kerogen (organic matter) melts into black oil and gives off gas. The oil can be released from the oil-shales by fracking and can then flow to the oil well. It is very easy to understand the generation of oil and gas in southern England, mostly in terms of an increase in temperature downwards (but do not forget the fermentation gas!). The simplified and modified diagram provided above is based partly on the work of Irwin and Curtis in the 1970s and clearly shown by Leeder (but technical data on stable isotopes has been omitted). 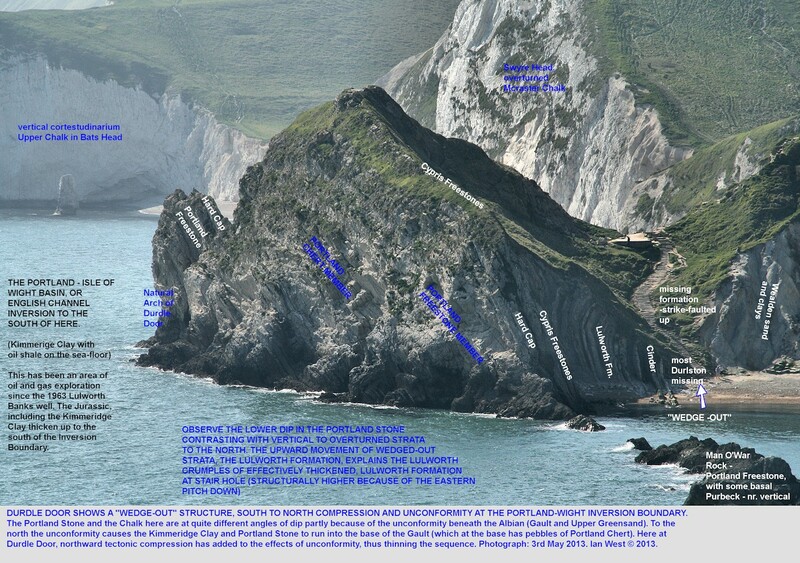 In the cliff sections of Dorset and the Isle of Wight the younger strata, Tertiary etc (e.g. Barton Clay Formation) are mostly in the late Fermentation Zone. In the field, as in the Lower Liassic strata with the Birchi Nodules at Lyme Regis, for example, you will see the results of the 3 Fermentation Zone diagenesis (i.e. the Birchi Nodule), but with a coating of Decarboxylation beef. This fibrous calcite has been formed the nodules and probably in the lower part of the Decarboxylation Zone. The exposed strata has not in the past descended below the base of Decarboxylation and not entered the Hydrocarbon Generation Zone - 5. However, at depth in the central part of the Western Weald and also just offshore, southwest of Atherfield, Isle of Wight, the Liassic Shales and also the Kimmeridge Clay are probably in the Hydrocarbon Generation Zone. Oil and gas may migrate to various traps, often at higher levels, but mature oil shale for "fracking" (hydraulic fracturing) normally has to be in the Hydrocarbon Generation Zone - 5. 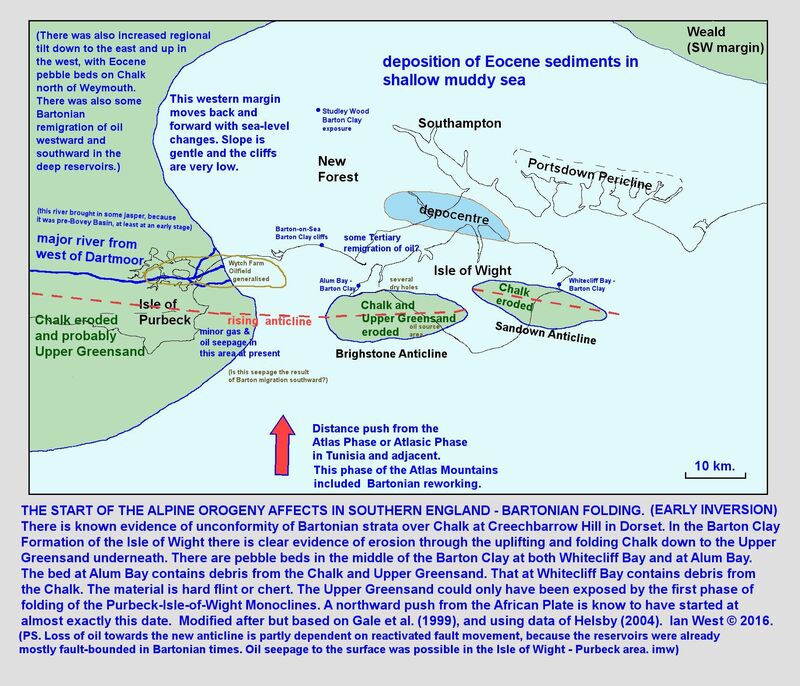 As a matter of interest, geologists are commonly examining Eocene Barton Clay etc at Barton-on-Sea, or Hengistbury Head or the Isle of Wight. They do not always appreciate that the septarian nodules within them have originated in the Fermentation Zone 3 and much methane of biogenic or fermentation origin has come from these beds in the past. The Wessex Basin, Inversion Structure. "Inversion Structure" is a popular oil industry term. The local Wessex Inversion Structure is a classic. There follows a brief summary; details will be given below, or in other associated webpages. 1. 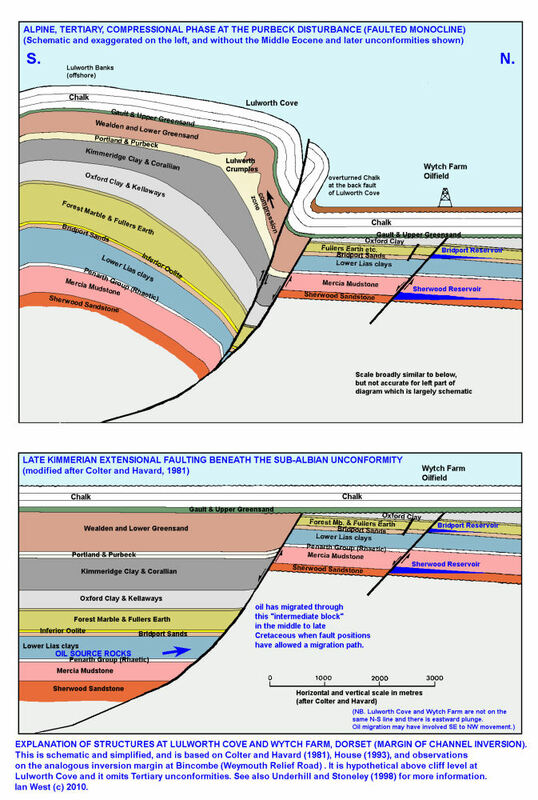 A deep basin is developed in the Jurassic and Cretaceous. Where the basin subsides deep enough, actually in this case to the SW of Atherfield Point, Isle of Wight, the organic rich source rocks (Kimmeridge and Lias) go beyond 2 to 3 km down (i.e. rather to boiling point of water). This produces oil and gas, but it does not happen out of the basin. No major oil or gas has been produced from oil shales at Lyme Regis or Kimmeridge because both are too shallow (although Kimmeridge is getting nearer). Result - oil and gas in the basin centre but not at first migrated. 2. Oil and gas migrate out of the basin to the high margins in the Cretaceous. i.e. northward to the Wytch Farm oil field area. This was happening in the Lower Cretaceous - Wealden to Aptian (Lower Greensand). There is the complication of much faulting - blocking some oil movement. 3. There is great erosion in the late Cretaceous (Upper Greensand, Albian) of the "high" rising area to the north so that the Gault and Upper Greensand are lying on an eroded surface of Late Jurassic and Early Cretaceous rocks (much faulted). 4. Much later due to pressure from the south (probably African Plate moving north) the basin then "Inverts", i.e. it rises and becomes a structural high. This is the real Inversion process and it happened in the local area in Tertiary times, and as we now know, much more specifically, in Bartonian times (but not only Barton - that was just the maximum). The new highs are Chalk anticlines or monoclines shedding debris off to the new basin in the north (explains the mid-Barton pebble bed at Alum Bay). 5. 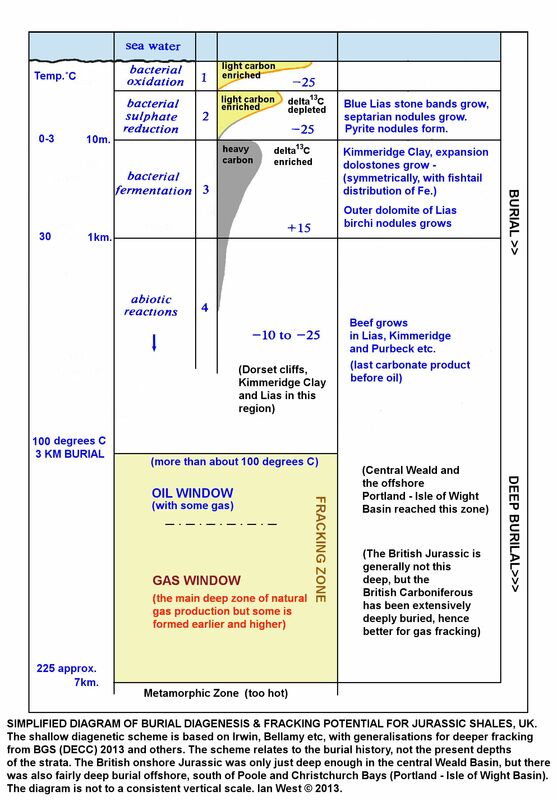 So in the final Inversion Structure, the oil is not in the axial area where it originated but is in the relatively high area to the north (Wytch Farm) . 6. Theoretically it could stop now. However, continuing compression from the south (African Plate moving north) means that the basin does not just level out but part actually rises substantially above sea level. 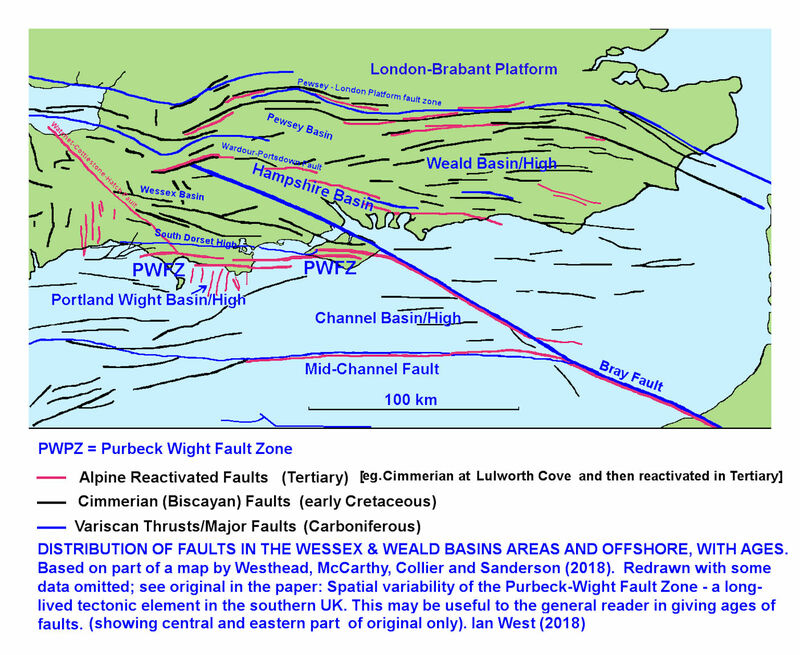 Tertiary Monoclines ("Purbeck, Isle of Wight Anticline) develop. Theoretically, oil could move back in to the central zone in Bartonian times, but it does not seem to have done so, probably, largely because of fault-blocking. Theoretically the central monoclinal areas could become major, late reservoirs, but in practice this does not seem to have happened. 7. So, the exploration areas are like Wytch Farm, north of the main source area. However, how far northe could they extend? Why has no substantial oil been found in the northern Isle of Wight? (There is an apparently "dead" area from northern Isle of Wight to Lymington to Lyndhurst region). 8. The Weald Basin is another Inversion Structure, with a similar history. 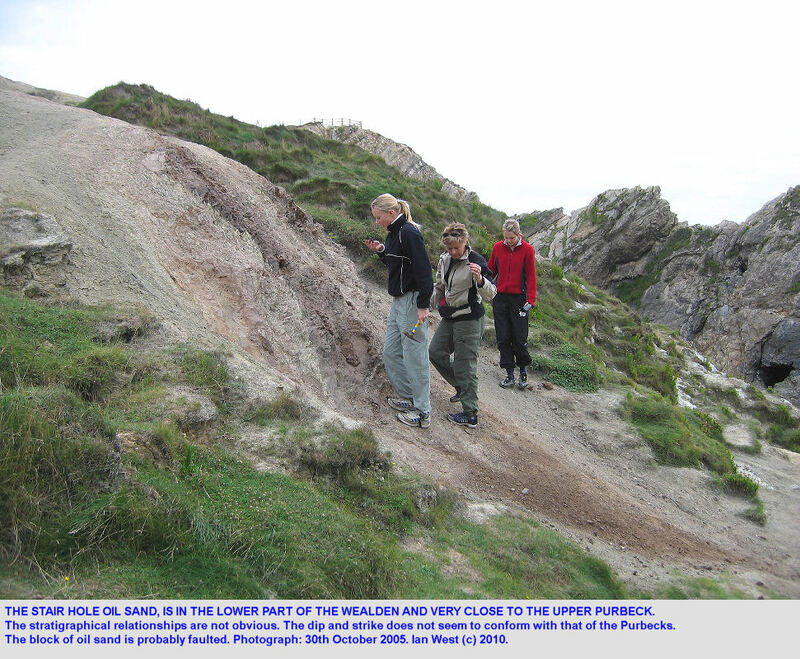 The Wealden sands and the Purbeck Formation are most notable for oil indications in the Lulworth Cove area. Good oil sands can found in a faulted block of Wealden near the base of the formation. It is easy to find and it is quite near small faults near the Purbeck-Wealden junction. 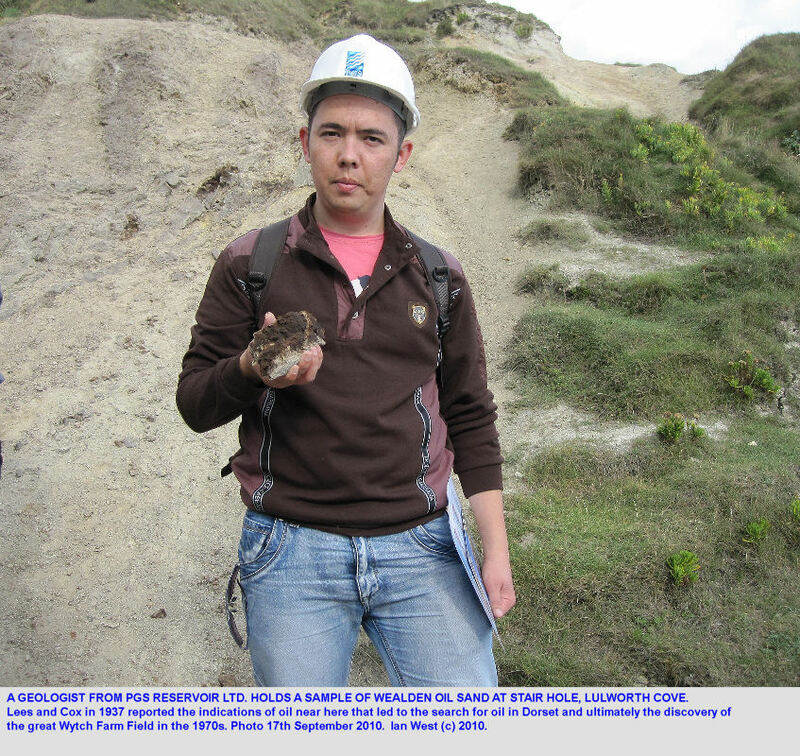 A photograph above shows an oil geologist from PGS Reservoir Ltd. holding a sample. Lees and Cox, mentioned below, found good oil indications at the cliff top just to the west of Stair Hole. However oil sand is very easily seen (and smelt) in Stair Hole. 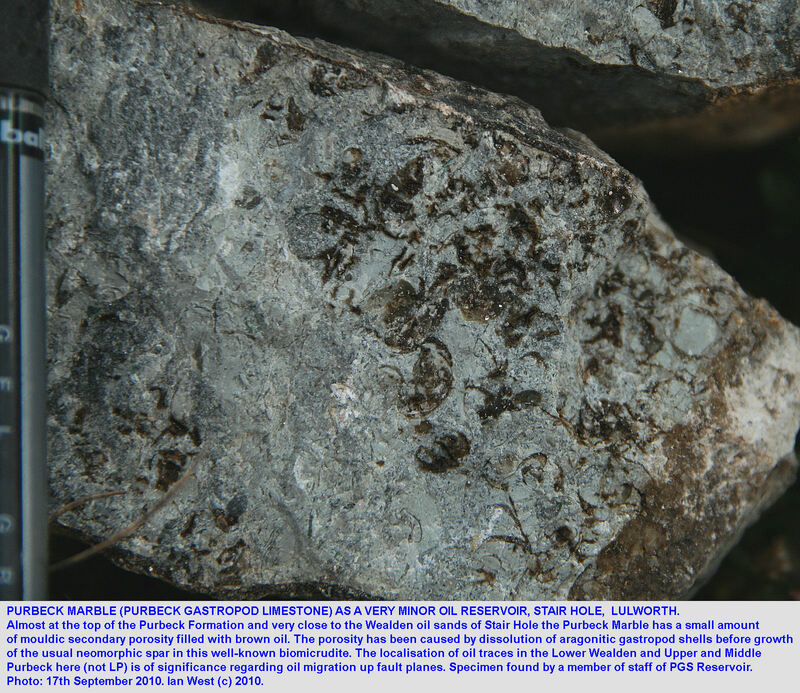 Traces of oil are also present in Purbeck Marble, a gastropod limestone at the top of the Purbeck Formation. They are generally not present in the Lower Purbeck, but are mostly in proximity to the Purbeck-Wealden Boundary, both here and at Mupe Bay. It was back in 1937 that geologists of the D'Arcy Exploration Company, later to become part of BP, investigated the Dorset coast in a search for oil (Lees and Cox, 1937). They said " The Purbeck Beds at their outcrops on the Dorset coast show a number of impressive oil indications; these include bituminous limestone, as at Peveril Point, and fractured limestones at Mupe Bay, Lulworth Cove, and Durdle Door which show oil residues on the faces of cracks and which ooze a little soft bitumen in warm weather. " Their plate 11 has an arrow pointing to this part of Stair Hole. Here in a crack or joint of a block of Purbeck limestone is one of these oil residues of the type which started the oil exploration in this region. It is generally accepted that the oil in Dorset was generated by Cretaceous times. There was sufficient depth of burial of the Liassic source rocks (about 3km) by this time in the offshore basin, and the oil has migrated into traps of Cretaceous age, rather than Tertiary structures. Reworking of older Jurassic clasts first occurs in the Upper Purbeck (just under the Purbeck Marble here with oil) because at this time the Inversion boundary fault had moved for the first time on any scale. The inversion uplifted round about 100 metres (because there is reworked Portland detritus and some Kimmeridge in the Purbeck Unio Beds). This initial fault movement had just started when the lower Wealden beds were deposited. It is not surprising that there seems to be an "oil river" in the lower Wealden at nearby Mupe Bay (even though geochemists have disputed this). A penecontemporaneous seep would be expected in this area and at this time. It may not have continued because Wealden clays sealed the fault. This does not necessarily imply that the oil sand of Stair Hole received the oil at the surface. This could have happened, but the Wealden sand may well have been under very shallow burial. The Mupe Bay "oil river" is at about the same horizon, but is more convincing evidence. 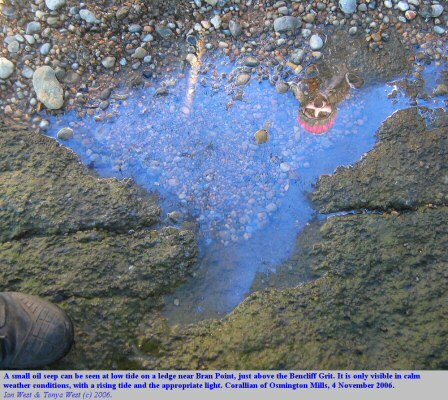 "The presence of a rich impregnation of oil in the Corallian Bencliff Grits outcropping near Osmington Mills in Dorset was recently discovered by Mr. A. H. Taitt. A specimen of the sand from the exposed cliff face has given 12.1 per cent of oil, and where these beds pass below high-tide level at Bran Point there is a small but active seepage of free oil. This seepage is, so far as we are aware, a new discovery, and its existence does not appear to be known even to the local inhabitants." The Bencliff Grit east of Osmington Mills contains oil-sand and sometimes some surface oil seepage. It is best seen near the western end of the main cliff section. The field leader may wish to pass round one or two dark brown specimens from this Bencliff Grit exposure, to avoid excessive hammering by the party. Notice that the oil sand smells strongly of oil. The oil sand is not at the top of a sandstone reservoir as is usual underground, but instead it is here above the water-table (i.e. in the vadose zone). It seeps downward and is usually concentrated above clay laminae. In some weather conditions there is some small seepage in the form of small trickles from the cliff, as shown on the right, but this surface appearance varies from time to time. Recognise the oil sand by a dark brown colour and any surface oil seepage. Try breaking of a piece and smelling it; it has a strong bituminous smell. Further east at the eastern end of the outcrop in the cliffs of the Bencliff Grit, just after it has disappeared under a ledge of the next limestone in the sea there is a small active oil seep, although it is often difficult to see. Bubbles of oil emerge in shallow water at intervals, probably rising from joints in the limestone, and the oil disperses as a film on the surface. To observe this it is best to look when there are quiet water conditions and a tide rising from low water. This small but interesting feature is a classic aspect of Dorset geology because the finding of this in the 1930s was one of the reasons for commencement of oil-exploration in Dorset. That led eventually to the discovery of the great Wytch Farm oil-field, containing almost 500 million barrels of recoverable oil. The bituminous and oil shales of the Kimmeridge Clay (Upper Jurassic, Kimmeridgian to Bolonian) are important oil source rocks in the North Sea. They are not thermally mature at Kimmeridge on the south coast. However, the excellent cliff exposures provide superb opportunities to examine oil source rocks in the field. The cliffs and associated boreholes have been studied in much detail. 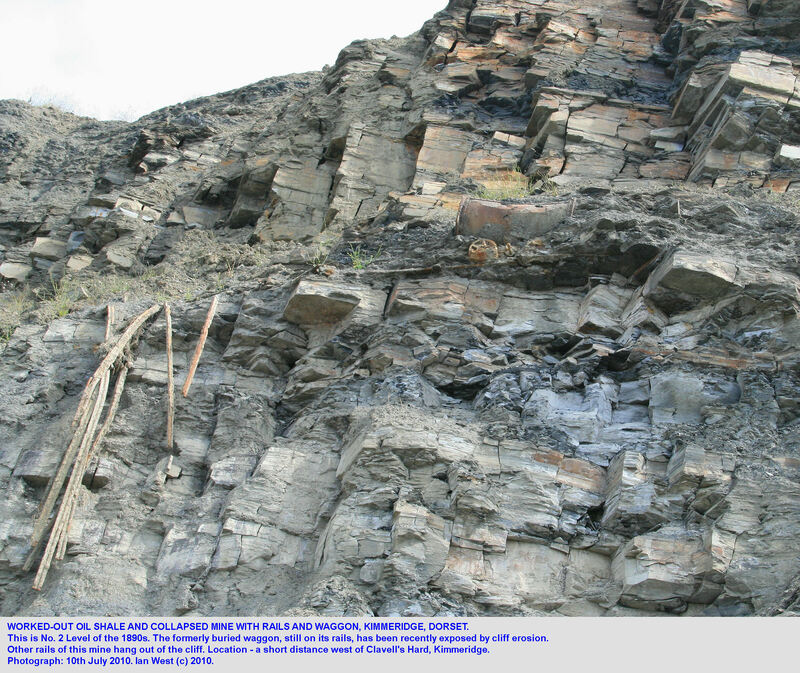 The oil shale has been used commencially in the past by an early oil company. Some details are given below. The Kimmeridge clay is famous as the major oil source rock in the North Sea. It is deeply buried there and thermally mature. In Dorset it is not mature and is not gnerally the source rock for the local oil (it was not buried deeply enough during Cretaceous times). 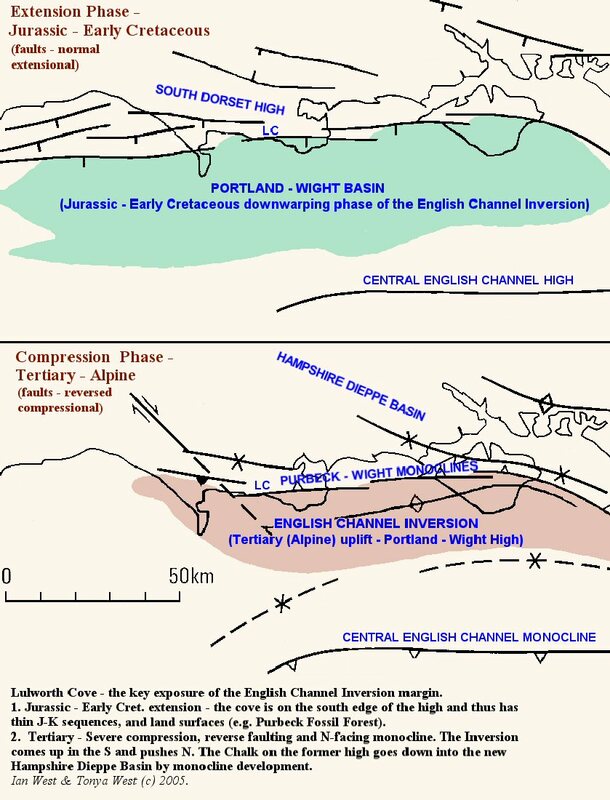 The deeper Liassic bituminous shales, in the English Channel Basin to the south, are usually regarded as the source rock for this region. Nevertheless the Kimmeridge Clay has been worked by an oil company back in the 1890s, for production of shale oil (particularly paraffin) by pyrolysis, and for gas and other products. 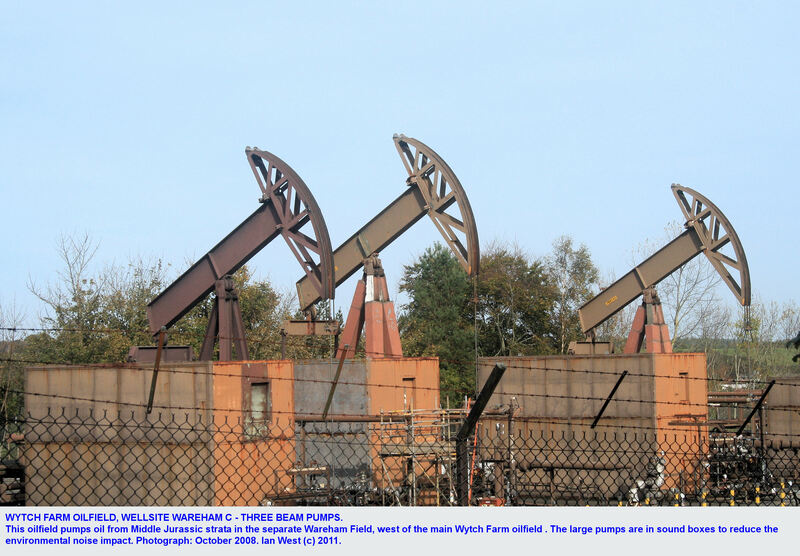 It is still a potential source of shale oil but has a very high sulphur content, actually containing pyrite nodules and when burnt produces particularly unpleasant sulphurous and oily fumes. It has been investigated by Gallois in terms of reserves. It occurs as a relatively thin bed, but over a very large area. It seems very unlikely that the Victorian mining and pyrolysis will recommence in the near future; however, it might be necessary to use it at some time in the distant future when oil resources are very limited. Production of shale oil from oil shale is sometimes regarded as a promising new process. In fact, it is a very old procedure, and the Kimmeridge Oil and Carbon Company was doing this in Dorset in late Victorian times. The factory was at Wareham, Dorset, near the railway station. About 1.6km east of Kimmeridge Bay is the small headland once known as Blackstone Point but usually referred to as Clavell's Hard (map ref. SY920777). The Kimmeridge oil-shale or Blackstone was worked here and further the east, near Rope Lake Head, it descends to the beach. The Kimmeridge Oil and Carbon Company reported that in 1890 there were five thousand feet of underground tunnels or levels at Kimmeridge (see Legg, 1884, p. 23 for a map of industrial Kimmeridge showing the various levels and shafts). Two of the levels, No. 3 and No. 4 were opened onto this ledge. The old photograph shows the state of the ledge in the 1890s (based on Strahan, 1898). Next to the hut is No. 3 Level, covered by debris now. The oil shale, which just above the floor of the ledge or platform, is almost a metre thick (0.86m according to Strahan, 1898). Slabs of this have been piled up ready for removal. You will notice the railway track and some wooden posts, probably part of a pier or jetty, no longer in existence. 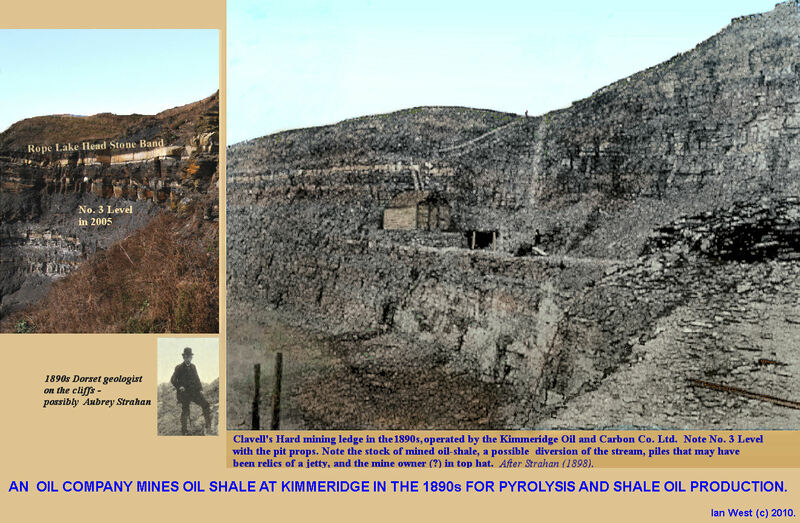 The five levels or adits in the cliff are from the 1890 workings of the Kimmeridge Oil and Carbon Co. Ltd. in the final phase of operation (Legg, 1984). Galleries branched off the main levels, and between No. 1 and No. 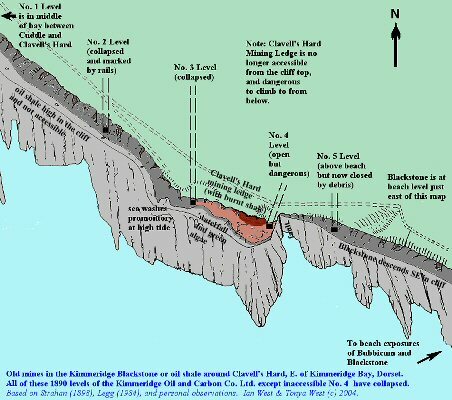 2 the Blackstone was worked out for the whole of the 150 feet closest to the cliff (Legg, 1984). Worked out shale can be easily seen close to Clavell's Hard. 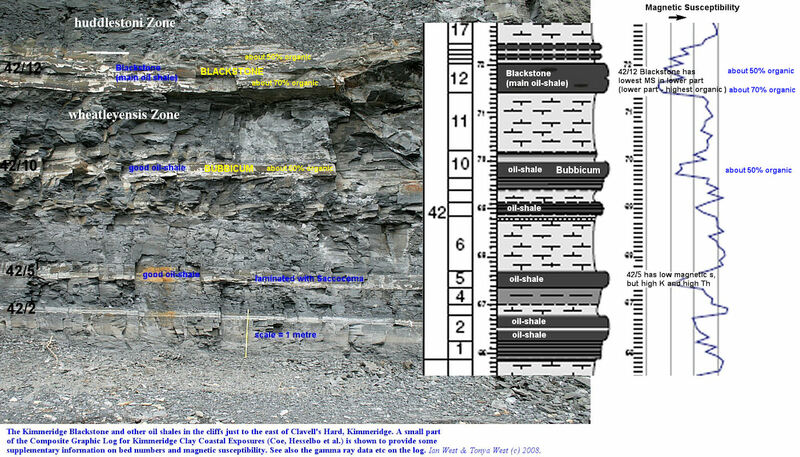 Composition and Geochemistry of the Blackstone, the Oil Shale. 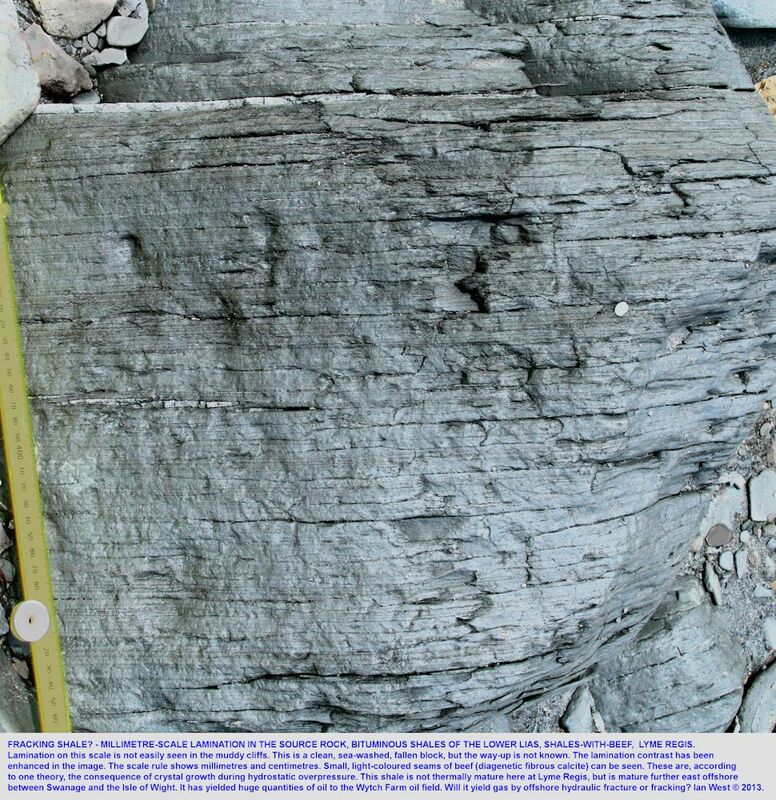 As a potential oil-source rock it is appropriate to consider the geochemistry of the main oil-shale, the Blackstone. Various analyses have recorded a total organic content of between 20% and 74% (e.g. Cosgrove (1973), Dunn (1973), and Legg (1984)). Strahan (1898) referred to an analysis which gave 61% volatile matter and 13.15 % carbon (coke). Thus the total organic content was 74.15 % with ash of 28.85 % Thus, in general, the purest high quality Blackstone can be considered as consisting of about 70% organic matter in the form of kerogen. A very organic-rich, sample of the "Best Blackstone" (at the base) which has been analysed for trace elements contains 61.6% organic matter and only 5.6% CO 2 . There are the following trace elements in ppm: V - 25; Cr - 20; P - 1580; Zr - 7; Ni - 35, Cu - 25, Mo - 20, Ga - 3, Mn -20, Li - 15, Rb - 50, Cs - n.d., Sc - 2. This data is from Dunn (1973), who has provided tables of analyses for this and adjacent strata. The trace element composition is not unusual for a Kimmeridge Clay rock with low clastics. 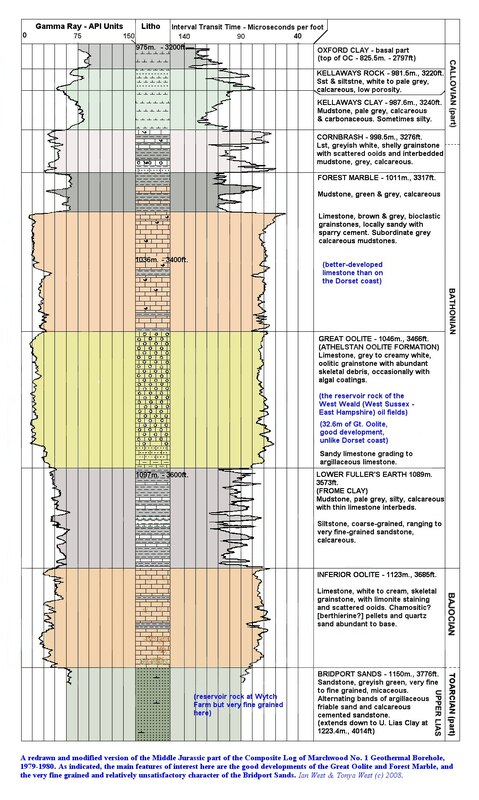 V and Cr are low compared to adjacent strata while P is high for the Kimmeridge Clay. Zr is as low as would be expected for a rock with low clastics, Ni and Cu are similar to values for the shales, and Mo and Ga are not unusual. Mn is decidedly low, probably because of deficiency of carbonate. Li is very low and Rb, as would be expected, is much lower than in the shales. Cs and Sc are not present in significant quantities. Generally then, elements contents are low compared with the adjacent bituminous shales probably because of dilution by organic matter trace. The high phosphorus is the notable feature. 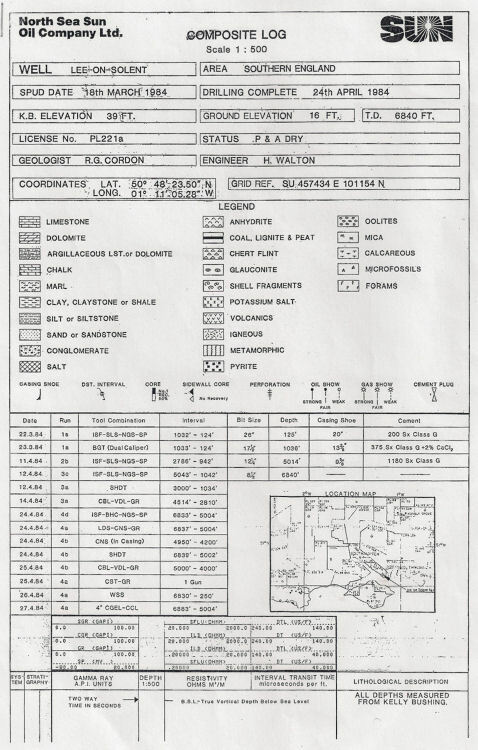 Additional trace element data has been provided by Cosgrove (1973). He analysed various Kimmeridge Clay samples including a museum specimen of Kimmeridge Coal or Blackstone. This particular specimen gave 71.4% 'organic C' (but this is presumably this total organic matter, not just carbon). CO 2 was 3.7%, and these figures are not very different from the values given by Dunn for the richest oil-shale. The trace element composition is broadly similar to that given by Dunn. There are some additional elements, including Zn - 65, Br - 16, Sr -154 and Y - 13 ppm. The most notable feature is the iodine content of 72 ppm which makes this one of the most iodine-rich combustible rocks known. 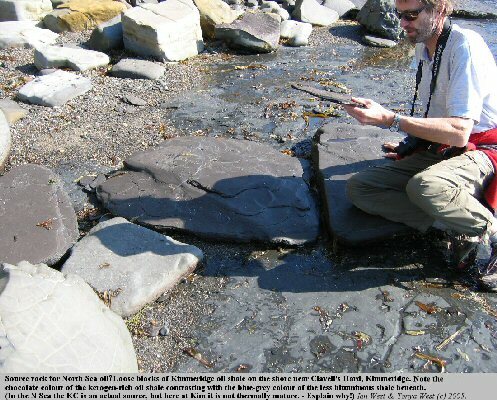 Other Kimmeridge rocks have lower iodine contents but they are still quite high for shales. The iodine was attributed (Cosgrove, 1973) to a marine plant origin. It was not detected in Carboniferous oil-shale from Broxburn, Scotland, which is of freshwater origin. More trace element data is available in Gallois, (1978). In addition to comparable results to those discussed above, Ba is unremarkable being near 250 or 300 and U is very low and not concentrated in the oil-shale. In terms of organic maturity the Kimmeridge Clay of the Kimmeridge area is still immature but has R o (estimated vitrinite reflectance) of about 0.45, higher than the value for the Kimmeridge Clay of Ringstead of 0.34 (Ebukanson and Kinghorn, 1986). See this work, too, for information on aliphatic hydrocarbons in the Kimmeridge Clay. Gas production from Kimmeridge Blackstone has been found to be 11,300 cubic feet per ton, after purification of the gas. This is said to be only 700 cubic feet less than the output from a ton of coal. This information is from Legg, (1984) quoting Dr Ted Ward, who, in turn, was referring to the work of the German chemist August Wilhem von Hoffman in the 19th Century. Strahan (1898) stated that one ton yielded 9,000 cubic feet of gas. At 60° C methane is the gas produced. At 100° C methane, ethylene, ethane ande propylene are produced. C 4 and C 6 hydrocarbons are also produced at high temperatures (Gallois, 1978). A potential hazard is that hydrogen sulphide is produced at 200° C.
Older studies (Strahan, 1898) showed that the Blackstone can yield 120 gallons of oil to the ton in laboratory tests, or on a large scale 66 gallons to the ton. Associated 'common shale' gives 33 gallons to the ton. A thorough, more recent study of oil yield has been made by (Gallois, 1978). Up to 20.9 US gallons per short ton are the potential oil yields from samples in various boreholes through the Kimmeridge Clay in southern England. The Blackstone at Kimmeridge has given oil yield of 15 wt/wt %. Hydrocarbons produced by the pyrolysis of Kimmeridge Clay oil shales are mostly viscous oils and tars with a high sulphur content (Gallois, 1978). Oil shale density is much less than associated sedimentary rocks can be as low as 2.2 (and probably lower in the case of the Blackstone). Clay minerals in Kimmeridge oil-shales are dominantly illite, but also with some kaolinite, some mixed-layer mineral and some chlorite (Gallois, 1978). Incidently, it is interesting to note that ammonia was a by-product of distillation, and salammoniac has been recorded as produced by an oil-shale cliff-fire (Cole, 1975) . I do not at present have information available on the nitrogen content of the Blackstone. Gallois (1978a) has considered the practicalities of large-scale oil shale distillation. The oil shale has to be retorted to about 500° C and the volume of spent shale after retorting has a similar volume to the raw shale. There is therefore much to dispose of and it has few uses and may include small quantities of carcinogens. Its disposal therefore presents formidable problems. There has been some important recent work on the organic geochemistry of various Kimmeridge lithologies, including the Blackstone, by Van Kaam-Peters et al. (1998) . They found that organic matter had been preserved by sulphurisation. The organic matter of all sediments was deposited under euxinic conditions as revealed by the occurrence of isorenieratene derivatives indicating (periodic) photic zone euxinia. They suggested that at times of reduced run-off from the hinterland, represented by so-called condensed sections, the flux of reactive iron was relatively small compared to the flux of reactive organic matter, which resulted in the formation of relatively small amounts of pyrite and an excess of hydrogen sulfide capable of reacting with fresh organic matter. Within the condensed sections, variations in the degree of sulfurisation of organic matter are probably due to both differences in primary production and differences in the supply of reactive iron. Their findings demonstrate that climatic changes, probably driven by Milankovitch cycles, can have a large impact on the molecular and carbon isotopic compositions of the sedimentary organic matter in an otherwise relatively stable stratified basin. They also show that large amounts of labile carbohydrate carbon may be preserved through sulfurisation. 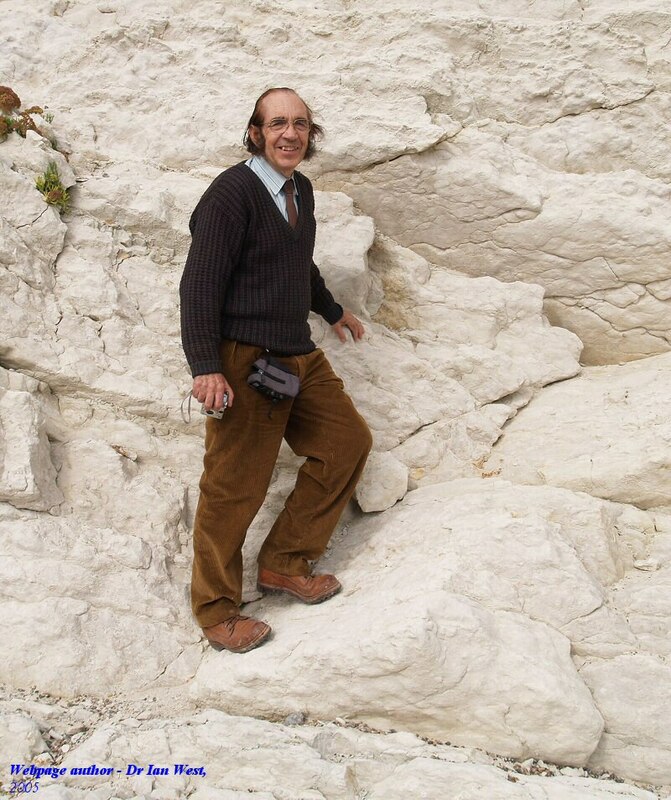 The following summary was given by Ramues Gallois, the well-known Kimmeridge Clay expert, (Gallois, 1978) when he was Principal Geologist in charge of the Oil Shale Project at the Institute of Geological Sciences, London, now the British Geological Survey. This was written some years ago but is very relevant now with renewed interest in oil shales. "In a densely populated and intensely utilised country such as the UK the environmental problems of opencast, underground mining or in situ retorting are substantially greater than in most other countries where an oil shale industry has been established or is contemplated. In the UK oil shales could probably make a major direct contribution to our energy requirement only if worked on a massive scale (a single opencast pit in the Kimmeridge Clay with a working face 200 m long and 30 m high could supply the whole of our oil needs, but the face would have to move forward at a rate of about 6 km per week). However, quite small workings might be used to provide valuable quantities of fuel for industrial processes such as brickmaking, or petrochemical feedstock. Indirectly, the Kimmeridge Clay oil shales already make a major contribution to our energy supply in the form of North Sea oil, a resource which is expected to 5000 million pounds between now  and 1980. One of the exciting long-term possibilities that has yet to be considered is that of artificially stimulating this natural oil generation by in situ retorting methods." See also: Gallois, R.W. 1978. 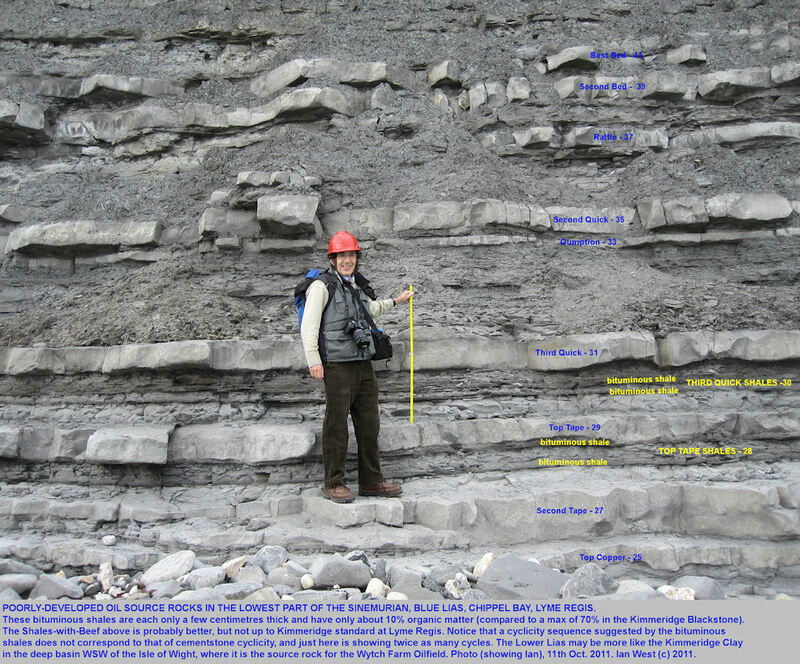 A pilot study of oil shale occurrences in the Kimmeridge Clay. Report of the Institute of Geological Sciences, 78/13. 26pp. There are significant resources of oil shale offshore to the south of Dorset. In fact there is probably much more Kimmeridge oil shale offshore than onshore. The Kimmeridge area is a small landward relic of a far larger outcrop under the sea. It is likely that even most of the old quarry sites of the Romans are under the sea now (up to half a kilometre offshore). The outcrops in the cliffs and ledges at Kimmeridge, Burning Cliff near Weymouth, and the Isle of Portland are, of course, well-known. The sea floor has been mapped acoustically many years ago by Donovan and Stride (1961). 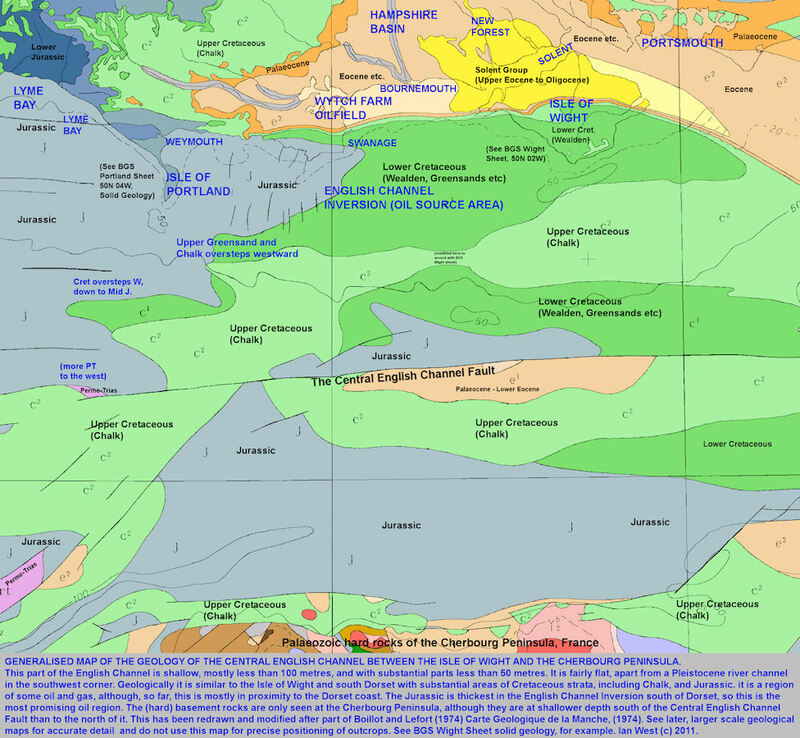 There has been more recent sea-floor mapping of the oil shale near to Portland by Gallois. 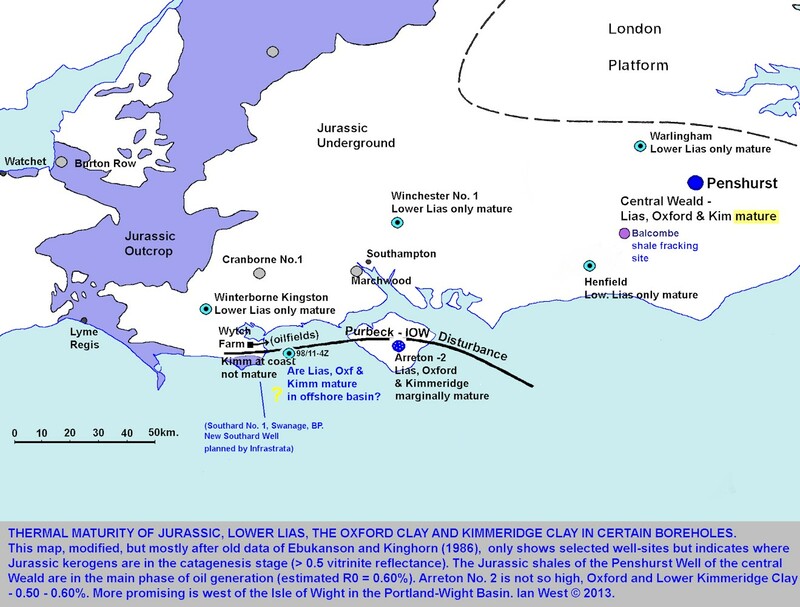 Thus, the general pattern of the outcrop is well-known and there should, of course, be much more Kimmeridge oil shale beneath younger strata (Portland Group etc) in the English Channel to the south. Lyme Bay is not shown on this map but there should be more Kimmeridge oil shale in the offshore Kimmeridge outcrop there (southwest of Chesil Beach - see BGS West Fleet and Weymouth Sheet 341 and part of 342, 2000 edition). It seems very unlikely that any attempt will be made to use this oil shale in the near future. The environmental problems of blasting and dredging the sea floor would probably be enormous, and it is not known whether it would be at all economically worth-while. Only in desperate times in the future might this be even be considered. Subsurface retorting or burning and distilling underground in this shallow offshore area might at some time be possible from shallow boreholes, but would probably be uneconomical. Even if the technology was developed to do this, there would be a major problem of sulphate ions forming from the oxidised sulphide (pyrite nodules and dispersed pyrite occurs abundantly in the oil shale). Very acid and potentially polluting fluids would be developed in large quantities and would need neutralising (this might be done using chalk or even limestone or dolomite within the Kimmeridge Clay Formation, to produce gypsum). The particular multibeam bathymetry images of the Channel Coastal Observatory, shown above, reveal only a little of the oil shale outcrop. However they indicates the level of detail that can be obtained with regard to the sea-floor. The Kimmeridge Clay has numerous, recognisable stone bands of dolomite and limestone and also harder oil shales. These project as ledges or ridges on sea floor and can be mapped by modern techniques. It will soon be a very simple matter to determine the detailed outcrop of the Kimmeridge oil shale or Blackstone on the sea floor to the south. It is quite likely that that potiential economic resource has already have been mapped in detail offshore. Of course, no plans are known for such sub-sea dredging of the Kimmeridge oil shale and they do not seem likely to happen in the near future. However, they might take place at some stage when there is a severe shortage of mineral sources for energy production. Northwest of Kimmeridge Bay is the oil well of British Petroleum Co. Ltd. This well site is small with a single beam pump or "nodding donkey". It has a high wire-mesh fence around it but it can be clearly viewed and there is an explanatory notice provided by BP on the front. This is probably the oldest continuously producing well site in the UK and was drilled in 1959. This was the original successful Dorset oil well before the much large Wytch Farm oil discovery was made. It has produced 350 barrels per day from fissured shelly limestone of the Middle Jurassic Cornbrash at about 320m depth. Production now is only 80 barrels per day (12,720 litres), according to the BP information notice. The oil is collected twice a week by tanker and transported to the main BP Gathering Station at Wytch Farm near Corfe Castle. It is then stabilized and exported by pipeline to a terminal at Hamble on Southampton Water. From there it travels by tanker to oil refineries for production of high quality fuels. The pump is a conventional beam pump or sucker-rod pump, although this one is very quiet because it is electrically driven rather than having the more common diesel engine for power. At depth in the anticline, at about the level of the Cornbrash, both oil and gas enter the casing which is perforated (this is usually done by firing shots out of the well).The oil is pumped up by a long string of narrow rods within the tubing (the inner piping) of the well on a system operated by valves. There is a significant weight of rods and oil to be lifted at each movement of the beam so there are two heavy, half-moon-shaped, counter-weights which rotate. You can see these in the photograph. The gas rises to the surface between the tubing and casing and is piped away separately at the surface. There is, according to the notice, intention to use the gas for fuel in the future to provide energy to drive the pump mechanism. 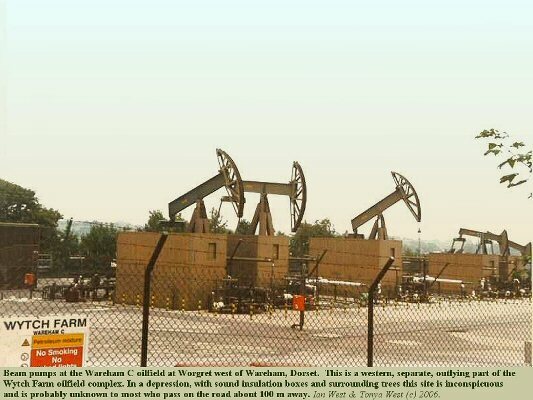 Some bushes or small trees are being grown in front of the oil well and this single pump causes very little disturbance to the environment and, indeed, is something of a tourist attraction. Had a large quantity of oil been found here then more screening of the pumps by trees, as at Wytch Farm, might have been necessary. Of course it is obvious that the oil is not coming from the Kimmeridge Clay which is at surface in the cliffs at Kimmeridge. However, such an origin is sometimes a misconception amongst the non-geological public, probably because the Kimmeridge Clay is the major source rock for the oil in the North Sea. There is no liquid oil in the exposed Kimmeridge cliffs, only oil-shale and bituminous shale containing kerogen, a brown waxy substance. The Kimmeridge Clay at Kimmeridge is not thermally mature (it has not been suffficiently heated by sufficiently deep burial at this particular locality). The real source of this oil is probably the deeper-buried, Lower Jurassic (Lias) bituminous shales in the offshore English Channel Basin. The search for oil in Dorset started in 1935. The first prospecting licences under the 1934 Petroleum Production Act were granted to the D'Arcy Exploration Company, who worked with BP. 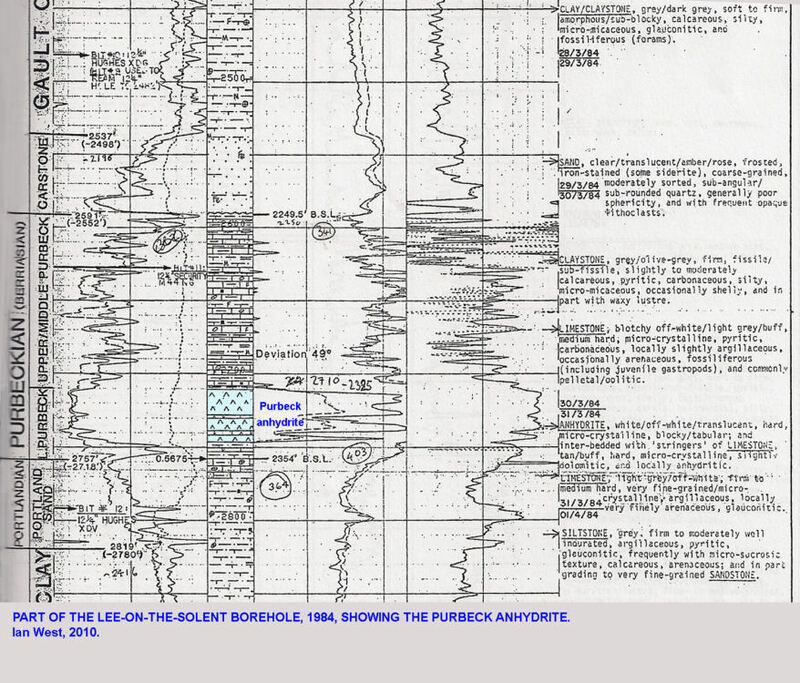 Exploration wells on whaleback anticlines at Poxwell and Portsdown in 1936 were unsucessful. Generally oil was not discovered in quantity in the Tertiary anticlines, which were compared to those in Iran, from whence Britain obtained its oil. It is now known that the oil of the large oilfields like Wytch Farm are in concealed fault traps of Cretaceous age (Late Kimmerian), not generally in the Tertiary anticlines. These can only be detected by seismic methods. The Kimmeridge field was discovered in 1959, long after the initial search for oil in Dorset. It began producing in 1961 ( (Gluyas et al. 2003). For a short time the production was up to 350 barrels a day, but later declined to about 100 BOPD and is now about 60 BOPD. The Kimmeridge Field was developed under a Mining Licence (ML5) granted in 1964. The field still produces under that licence and it is due to expire in 2014 (Gluyas et al.). 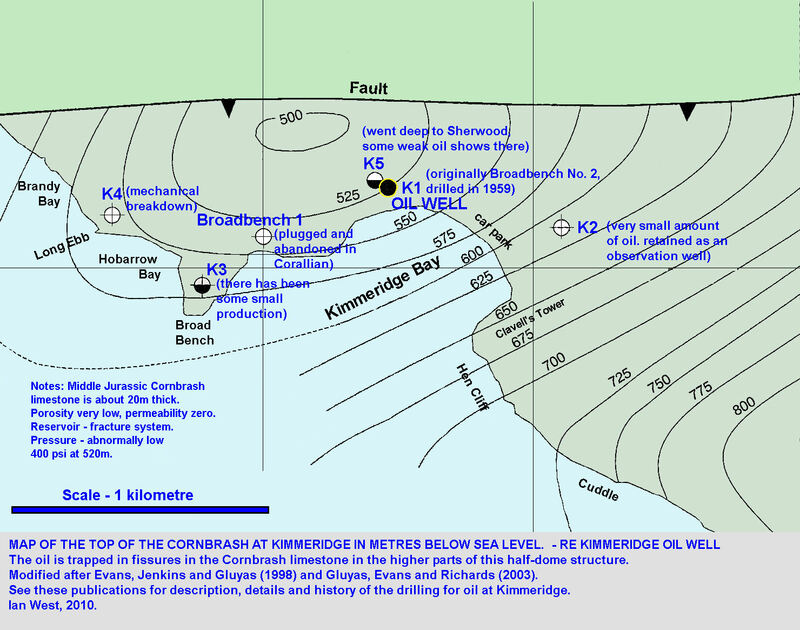 Between 1959 and 2000 six wells were drilled in Kimmeridge Bay (these are shown on a map above and listed below). The reservoir is a fissure system in the Middle Jurassic Cornbrash Limestone. This belongs to the top Bathonian to basal Callovian, and includes the zones of Cydoniceras discus and Macrocephalites macrocephalus. It is about 27 metres thick here. The nearest surface exposures are at the shores of the Fleet Lagoon (Shipmoor Point near Abbotsbury, access difficult; Butterstreet Cove, near East Fleet, access easy). It is interesting to note that by 1986 the well had produced 2.7 x 10 6 bbl House (1993) . This was thought to be greater than the original volumetric capacity of the reservoir according to ( Stoneley and Selley (1986). They considered that the reservoir was being replenished by migration of oil from lower horizons. 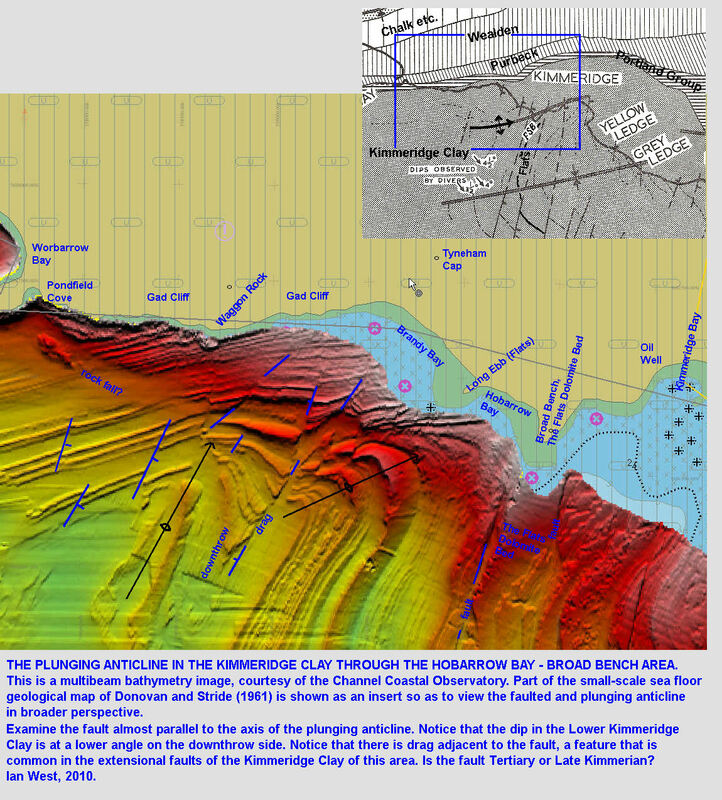 However, Evans, Jenkins and Gluyas (1998) in a paper entitled - The Kimmeridge Bay oilfield: an Enigma Demystified - have provided new information. New calculations have made on the reservoir. Further details are given below, in the Structural Closure section. The oil column was known to be 14.3 metres (47 feet) to 17.4 metres (57 feet) thick in about 20 metres of Cornbrash under a seal of Oxford Clay. The porosity of the Cornbrash limestone here is very low (around 1 percent) and permeability is negligible. However fracture porosity is present, and this not well understood. Different estimates were made for the average porosity including that provided by the fractures. It is very difficult to average out the variable volumes of fracture porosity in relation to the volume of almost non-porous limestone. The details of the fractures are not known, and the extent of fracture porosity is one of the uncertain variables. The main structure is a tight, structurally complex, monoclinal faulted fold, known as the Purbeck Disturbance Gluyas et al. (1998). The Kimmeridge trap is south of this. The northern limit of the trap, as shown above, is an east-west fault. The other limits are dips, east, west and south off the dome-like structure. A problem lies with the closure, in effect, the size of the trap or structure from which oil cannot escape. This has been difficult to calculate because of uncertainties regarding fracture porosity. Different closures have been calculated, usually larger, and sometimes much larger, than the originally mapped closure of 120 to 160 acres. Problems of estimating closure is why the hypothesis of resupply or of much extended fractures systems originated. Evans, Jenkins and Gluyas (1998) having studied the decline behaviour believe that the reservoir contains a finite ultimate recoverable reserve of 3.5 million barrels. They have stated that: "Despite being the most popular myth surrounding the field, the reservoir is neither fed from a deeper accumulation nor is migration into the field still occurring. Neither is oil being produced from a single isolated fractured zone which was only penetrated by the first well." They point out that if migration was continuing then the production history would not show the conventional decline which it does. The well results are consistent with a fractured reservoir contained within an anticlinal trap. Nevertheless the extent of the reservoir system and effective porosity are still not fully understood. All other similar traps in the Wessex Basin seem to have either been breached or never been charged. Their final remarks are: "Perhaps, like the Wytch Farm field to the north, it is the sole survivor of a much more significant play which was wiped out during inversion" [inversion was the uplift of the basin to the south]. A special aspect of the well, and one which has generated some discussion, are the abnormally low reservoir pressures, actually below hydrostatic. The initial pressure in Kimmeridge - 1 well was 400 PSI at 520m SS. This pressure would be expected in a reservoir several hundred metres shallower. Brunstrom (1963) suggested that oil may have been sealed in the fracture prior to Miocene folding and that the fissures were physically enlarged during folding leading to reduced pressures. Evans, Jenkins and Gluyas (1998) comment that some such explanation is necessary because there is no history of recent burial which might otherwise explain the pressures. 1936-1937. Intended to reach Bencliff Grit, Corallian, because of the oil in that at Osmington Mills. Found a joint in Sandsfoot Grit wet with light oil, but did not get to the Bencliff. Oil oozed from partially-leached calcite veins in the Cornbrash at 512m. subsea. (Why were the calcite veins partially leached?). Production tests yielded 30bbl/day. Two acid treatments caused the well to flow briefly at the very high rate of 4300 barrels a day. Completed as a producing well. This is now the producing Kimmeridge No.1, with the nodding donkey and shown in photographs above. Drilled 1960, east of Kimmeridge No.1. Top Cornbrash at 583m. Some oil in sands within the Oxford Clay. Very small quantity of oil from Cornbrash. Pressures showed Oxford Clay and Cornbrash in communication. Drilled 1959-60, prior to Kim 2. Location 762m. to SW of Kim 1. Small test production from Cornbrash. In 1980, post Wytch Farm Sherwood discovery. 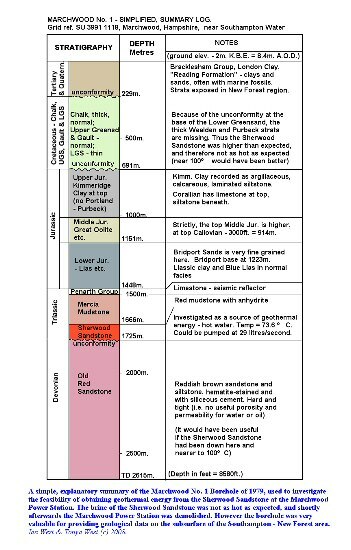 Weak gas shows throughout Jurassic. Important for going into the Triassic Sherwood Sandstone at 2272. Sherwood has only weak oil shows and reservoir quality was poorer than at Wytch Farm. (Useful information on Sherwood). 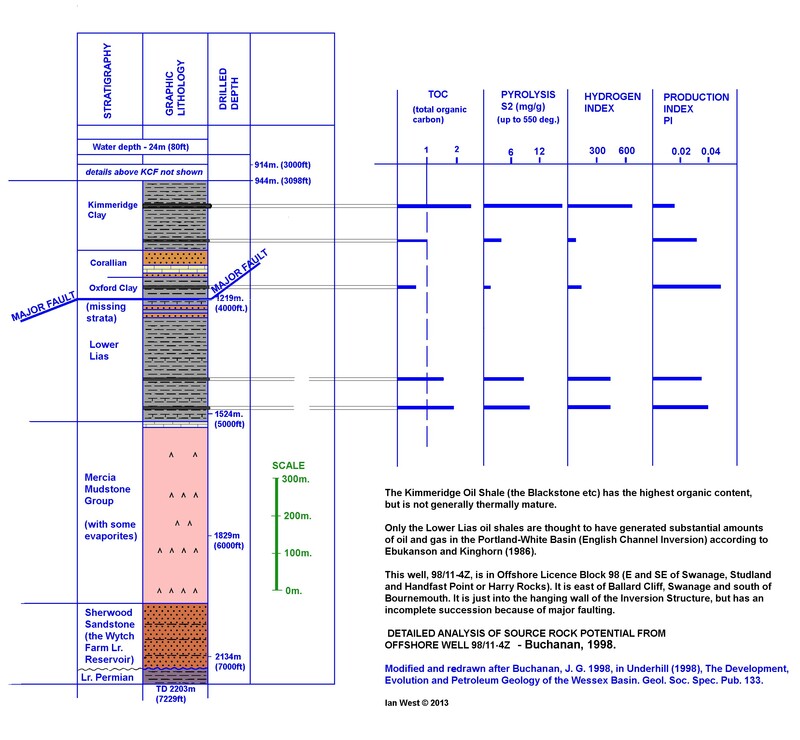 The RGGE (Rapid Global Geological Events) Boreholes. Three continuously cored boreholes for research were drilled through the Kimmeridge Clay by 2000. Two boreholes were in Swanworth Quarry, near Worth Matravers, and the third, Metherhills No.1 was at Metherhills, adjacent to the road down to Kimmeridge Bay. Metherhills No.1 went into the Sandsfoot Clay of the Corallian. These boreholes were not intended for petroleum exploration. See Gallois (2000) for details. This is the largest known onshore oilfield in northwest Europe. It was once owned by Gas Council; for many years it was owned by BP; recently (2010) it was sold to Perenco UK Ltd. This is not a technical description. Only a general and elementary account for the student or non-petroleum geologist is given here. The oilfield has been in operation for about forty years and any data given here is likely to be out-of-date, and is suitable for educational purposes only. All photographs are at least a few years old and no precise data on the present situation is given. The broad scheme and location of well sites has not changed much though. This was the original reservoir, but it is now the minor one. Marine Lower Jurassic, Toarcian to Aalenian, carbonate-cemented sandstone, compartmentalized. Depth at about 900m depth. Thickness is 45m to 73m (compared to coast exposure at Bridport of 43m). Porosity. 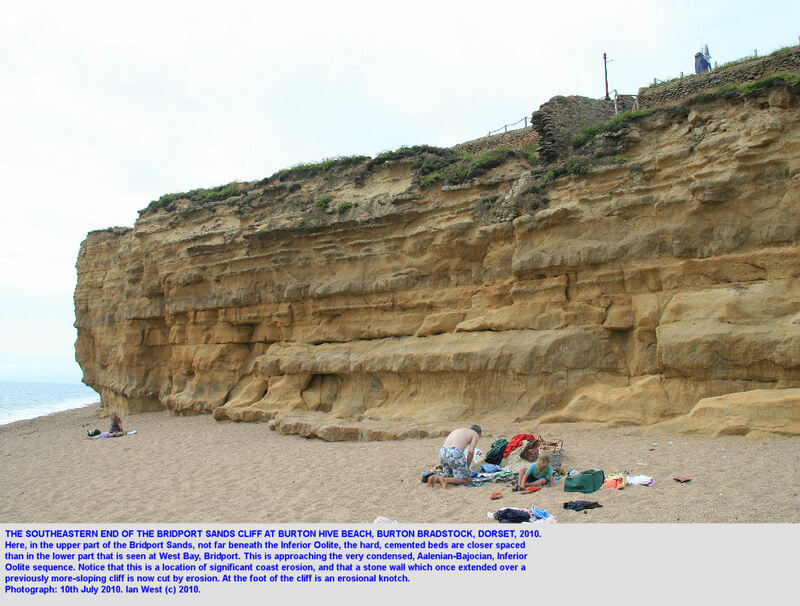 At the coast section the porosity is 15% to 37% in the friable sands. The mean friable sand porosity is 26%. Porosity. The original porosity was 43% as shown by the cemented beds, but the porosity of these hard beds is negligible now. The hard carbonate-cemented beds may be baffles (like islands in a stream), that is they allow some flow around them, but in some cases they may be barries (like dams in a stream) which are more restrictive to flow. This is the larger and lower reservoir. Fluvial Triassic Red Beds, at about 1600m. This is the major reservoir. The general features and history of the Wytch Farm Oilfield is discussed briefly below. This is based on brochures from BP, website data, and some technical publications. This is very general, non-technical. It is neither thorough nor up-to-date. It is only intended to be introductory and for the general geological public. See for example BP Exploration - Oil at Wytch Farm. This general publication is by BP because they were the operators and they owned the oilfield until 2011, when Perenco UK purchased the licence block and the field. Some of the following historical notes are partly based on BP brochures, but with additional information from Legg (1984) and other sources. When it is present, probably the most obvious and conspicuous feature of the Wytch Farm Oilfield is the very large drilling rig that is used from time to time for Extended Reach Drilling. This can be situated at Wellsite M on Goathorn Peninsula. It has drilled up to 11.3 kilometres to the east and into the great Sherwood Sandstone reservoir about 3 kilometres south of Bournemouth Pier. This rig has Top Drive and Downhole Powered Steerable Drive. Top Drive is a moveable mechanism for rotating the great length of drilling rods and the bit. On older, traditional systems this rotation was conveyed to the drill string via a Rotary Table (a circular rotating central part of drilling floor) and a Kelly, a square-section sliding rod turned in the centre of the rotary table. The Top Drive descends (lowered by the travelling block) from the top of the rig each time a drilling rod descends (which is then uncoupled). A (yellow) Torque Track prevents the Top Drive mechanism box from rotating back against the torque. The drilling engineer can choose to rotate the drill string by the Top Drive, especially when drilling in a straight direction. However when changing the direction of the borehole and producing a curve the top drive can stop rotating and the Powered Steerable Bit is brouht into use. The drill string now does not rotate but the bit rotates separately, powered from above. In addition the bit is steered from the wellsite by hydraulic control and turns the direction of the well. In this manner a well can swerve round under Sandbanks, for example, and descend beneath the Sherwood Reservoir. It can then come up into at about 11 kilometres away, south of Bournemouth into the reservoir at a depth of about one and half kilometres below the surface. The well will be cemented, perforated at the bottom, and fitted, from the Goathorn wellsite, with a Downhole Submersible Electrical Pump. This is fixed in place at the bottom of the well south of Bournemouth, with cables for the heavy electrical power. There are now many of these pumps in Poole Bay. The large drilling rig is not always there. As shown in a photograph above, there was no large drilling rig present in June 2014. Only a crane is visible in the forest, when seen from Redhorn Quay, Studland, a viewpoint on the east side of Brand's Bay, Poole Harbour. Will the big rig return at some later date for new work? Wytch Farm is Europe's largest onshore oilfield. It has reserves of 467 million bbl - 74 million cubic metres. There are three reservoirs: the Frome Formation (Middle Jurassic), a relatively minor reservoir, at about 800m; the Bridport Sands (Upper Lias, Lower Jurassic) at about 900m; and the Sherwood Sandstone (Triassic) the most important reservoir at about 1600m. It is on the south side of Poole Harbour, Dorset, extending eastward into Poole Bay, off Bournemouth. Offline and not available to the public for copyright reasons. 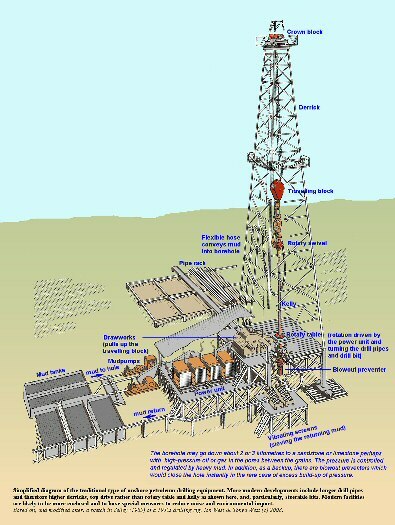 The Gathering Station of the Wytch Farm Oilfield is the nerve centre of the oilfield with a computerised control room governing its entire operation (old BP brochure). It is near the Hartland Moor National Nature Reserve, as can be seen on a map above. It is thus in an environmentally sensitive area. One of the conditions attached to the Planning Permission was nothing on the site may be above the tree line. One consequence of this is that the fractionation towers where the gases separated had to be redesigned in pairs, rather than have conventional taller units. In fact the Gathering Station is so well hidden by coniferous forests that the there no obvious environmental impact until you are very close by to the installation. The facilities are painted a brown colour and are not high. They are not visible above the tree line. 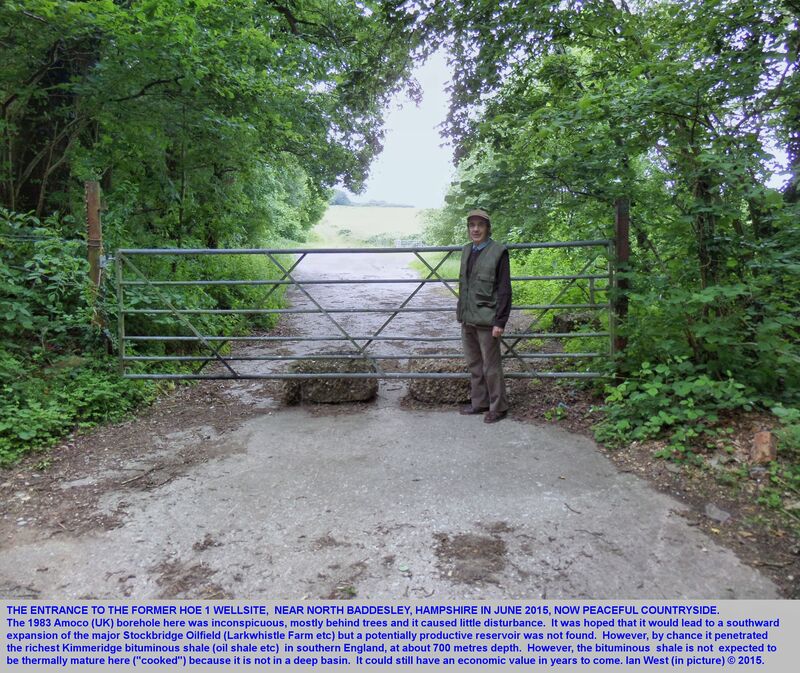 Its location is well-known and has been a subject of discussion in the local Dorset region for many years. However, if you did not know about it in advance you would not even notice its presence. In this respect it is, and always has been, environmentally successful. The mixture of hydrocarbons and much water coming from the wells is passed through a series of vessels where heating and lowering of the pressure separates the oil, gas and water. Production separators of an oilfield are usually horizontal chambers, which usually work in stages, perhaps three stages, with an inlet temperature of about 100 degrees C and an initial pressure of something like 30 to 50 times atmospheric pressure (Oil and Gas Production Handbook). In separators water settles at the bottom, oil floats and taken out in the middle, th gas bubbles up and is taken out at the top. Crude oil is produced at the end of the process and finally passes through desalters to reduce the salt content. It is then cooled and the crude oil passes through a 40.5 cm. export pipeline to Hamble on Southampton Water. 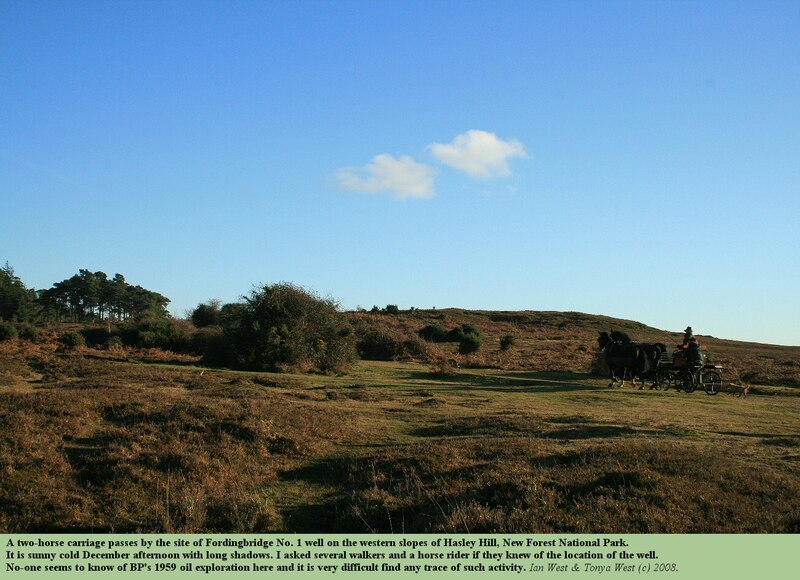 It passes through part of the New Forest, but the route is almost invisible. The gases are first cooled and dehydrated before being passed through a series of fractionation towers (mentioned above). These have a de-ethaniser which separates off the methane [CH4 - natural gas] from ethane [C2H6]. There is also a depropaniser to remove propane [C3H8] and a debutaniser to remove butane [C4H10]. The methane and the ethane are conditioned to the correct specification for sale, although some is used as fuel gas on site. The sales gas, methane, is odorised [given a smell for safety reasons], metered and pumped along a 20.3cm pipe to Sopley where it connects to the National Gas Grid (information from an old BP brochure for the public). The general visitor would not know which pipes are which, and those containing water would look similar. As mentioned below, there are very large quantities of water in use her, often more water than oil or gas. The water in the Gathering Station pipes is of two types. One of these is the seawater from Cleavel Point in Poole Harbour and this is pumped down into the reservoirs. The other water is produced water coming up the wells. Water is discussed further in a section below. Coastal exposures at Kimmeridge of oil shale have been used in Britain since Iron Age times. Oil seeps have also been used in the country in historic times. Oil shale was used as a fuel at Kimmeridge since the 17th century. However it was not until the late late 18th century and throughout the 19th century, that shale was heated for the distillation of oil and gas on a commercial scale in various parts of Britain including Dorset. Mining for shale in Britain reached its peak during the First World War, but then went into rapid decline, unable to compete with growing imports of cheap oil from more prolific sources abroad. 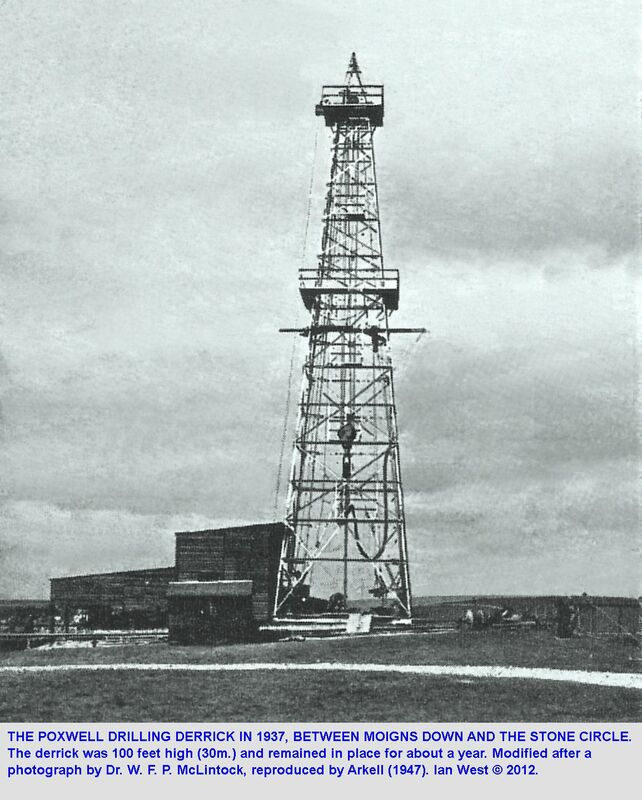 The Government encouraged an exploration programme for oil and the first British oil well was drilled at Hardstoft, Derbyshire, in 1918. The Mexican Eagle Company made the initial discovery. The Hardstoft Well was later deepened by BP, and had produced over 30,000 barrels of oil by the end of its useful life in 1945. Renewed interest in the search for British oil in the 1930s led to the Petroleum (Production) Act 1934. This declared all oil and gas reserves to be the property of the Crown, with exploration and production licences issued by the government to suitable operators. It was about this time that D'Arcy Exploration, later to be become BP Exploration, started looking for oil in the UK. It took until 1939 for the first commercial discovery onshore to be made - at Eakring in Nottinghamshire. Smallr finds followed nearby. Eakring alone supplied two million barrels of oil during the Second World War. D'Arcy Exploration started its search for Dorset oil with a shallow well drilled at Broadbench, in Kimmeridge Bay in 1936. Other wells were drilled at Poxwell, Ringstead, and Lulworth, and between Worbarrow and Mupe, all without success. 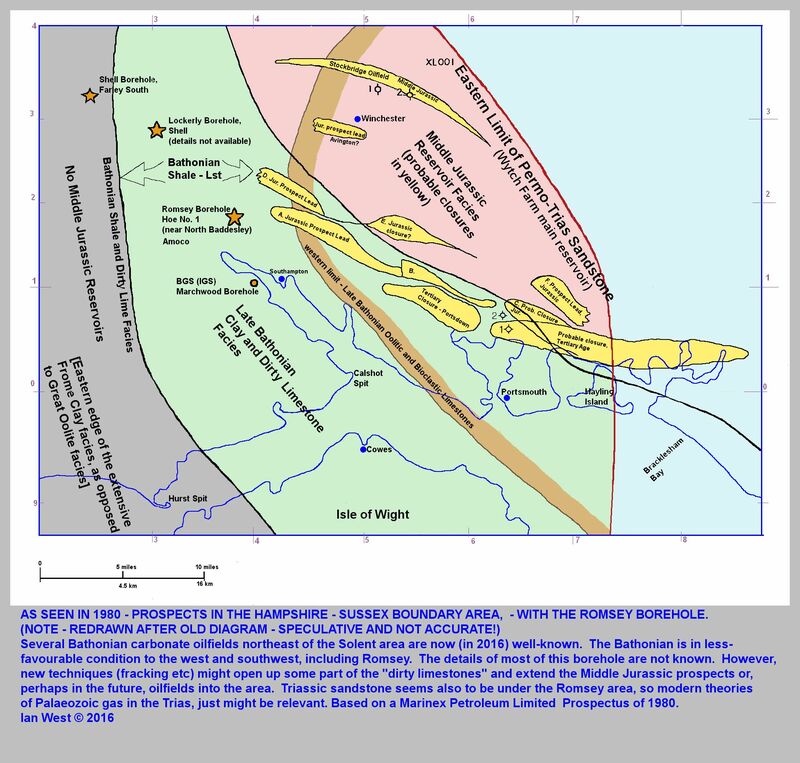 Surveys in the 1950s shifted attention to a structure known as the Weymouth Anticline, and so BP drilled at Radipole in 1958. 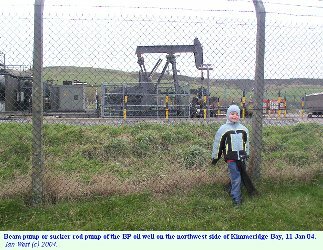 Analysis suggested that a deeper well should be drilled at Kimmeridge, and so oil was discovered there in March 1959. 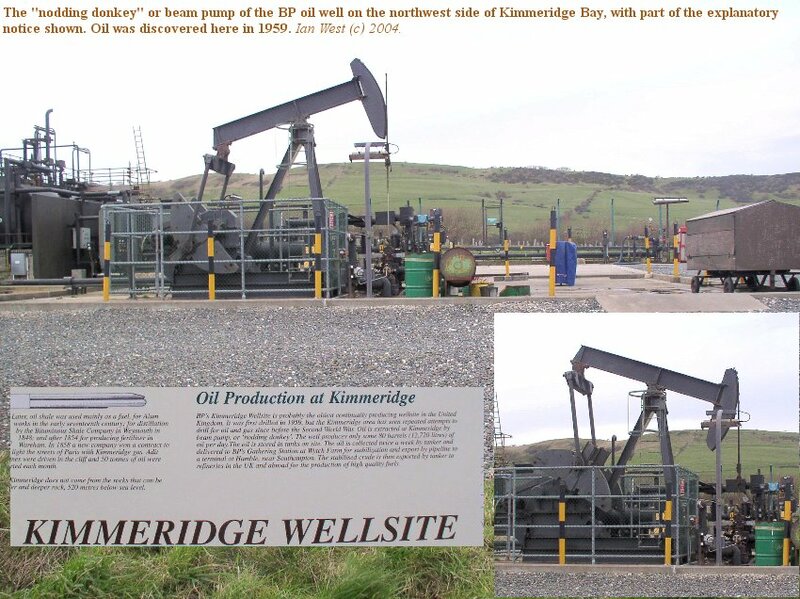 Production started in September 1960 and the Kimmeridge well continued to produce about 100 barrels of oil per day in the early 1990s (but perhaps less now). (The barrel it equivalent to a standard unit of 42 US gallone or 35 imperial gallons or 159 litres). 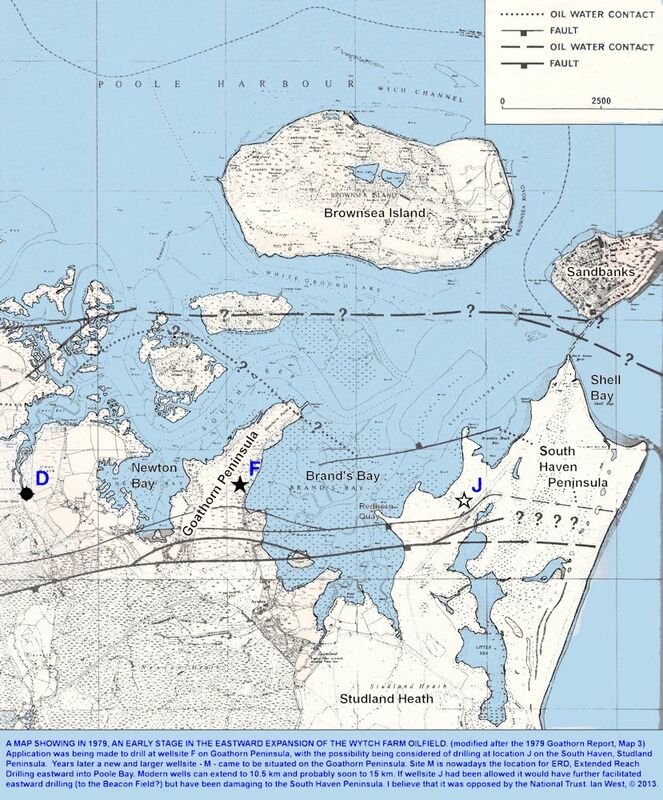 The Gas Council (Exploration) Ltd., a subsidiary of the British Gas Corporation, carried out seismic survey work on the Purbeck heathland beside Poole Harbour in the winter of 1970. The Gas Council (Exploration) Ltd. was in partnership with BP. The discovery of oil prospects here was regarded by the Gas Council as "an extension of an existing oil producing area". 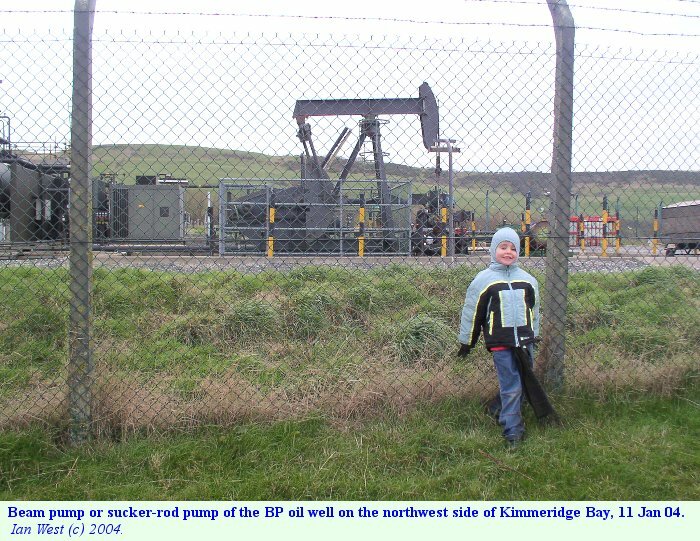 It said that the presence of oil wells at Kimmeridge and Wareham meant that natural gas "is not expected in the area in question" (Legg, 1984). . In fact now, in 2013, there is a gas pipeline supplying gas to the public gas mains at Sopley, near Christchurch (near Bournemouth) and this procedure has long been in progress. So, surprisingly, Gas Council effectively discovered a gas field and an oil field but claimed it was only an oil field. 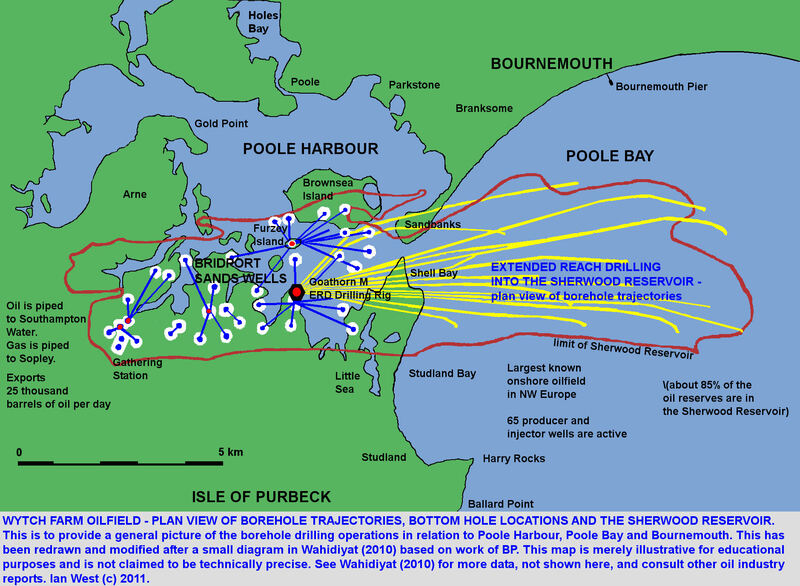 Following the seismic survey of the area between Wareham and the Purbeck Hills, in 1973, British Gas, in partnership with BP, began exploratory drilling into the Bridport Sands formation under Wytch Farm, near the south wide of Poole Harbour. Oil was discovered early in 1974, at 920m. (3000 feet) below the surface in what became known as the Bridport Reservoir of Toarcian (Lower Jurassic) age. 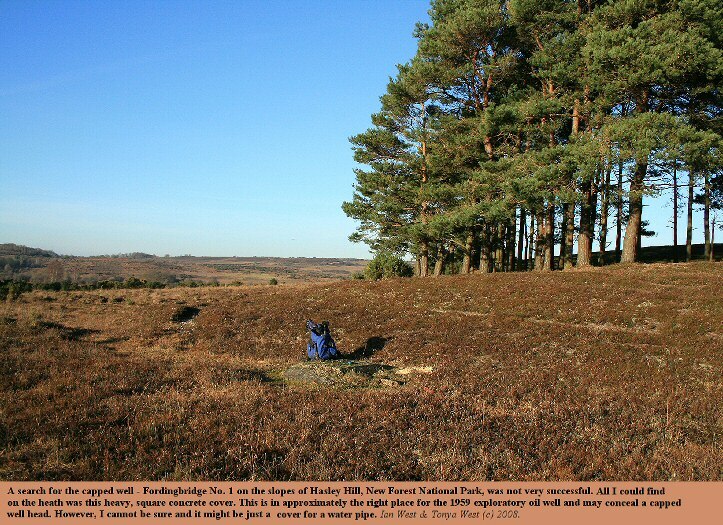 Wytch Heath, an area of Purbeck heathland on the south side of Poole Harbour was subject to seismic survey by The Gas Council (Exploration) Ltd., an equal partner with BP in 1970. It was regarded as an extension of an existing oil-producing area, because of the presence of oil wells at Kimmeridge and at Wareham. This was an area planted with trees by the Forestry Commission and held on lease from Major Ryder of Rempstone Hall who owns 5123 acres of the Isle of Purbeck. The estate has the mineral rights. Drilling took place in 1973 at wellsite X, a short distance ENE of the Gathering Station. Production began in 1979 and by the mid-1980s had produced some 5500 barrels per day. There was a proliferation of fast-flowing wells; a gathering station that needed forest to hide it; underground pipelines; a special rail terminal; and BP buying an island (Furzey Island). The oilfield was privatised by the Thatcher (Conservative) Government. In June 1981 Margaret Thatcher's government directed the state-owned British Gas Corporation to sell its half share in the Purbeck oilfield. British Gas considered that the half share licence it held was worth 450 million pounds. In 1984 British Petroleum and the "Dorset Bidding Group" secured production licence PL 089. The British Gas part was split between Tricentral, Premier, Carless, Clyde and Goal. British Petroleum was the operator and has remained so since then Legg (1987). The oilfield, now a private venture, was obviously very successful now and in one year more oil was found than in the whole of Texas ( Legg (1987). An application was made for the drilling of an exploration well for oil at Goathorn Peninsula, well-site F, by BG(E) [British Gas, Exploration] in 1979. There is much details are given in the document regarding the scheme, and although something of the distant past now, it still provides interesting reading. Dorset County Council. 1979. Wytch Farm Oilfield. 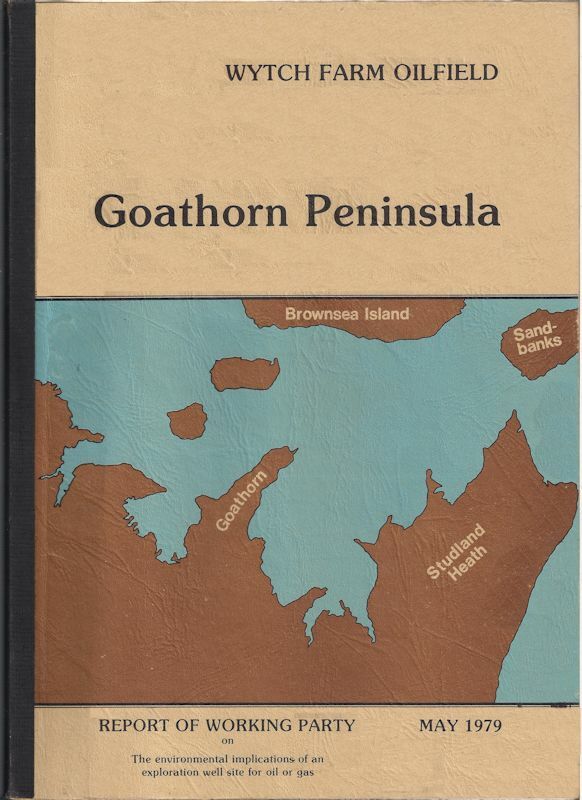 Goathorn Peninsula. Report of Working Party on the environmental implications of an exploration well site for oil or gas. May 1979, 75pp with various maps and plans. Go to the Oil South of England - Bibliography. Use the link above or alternatively scan down to "Dorset County Council" for more details. Here are some small extracts. 1.1. 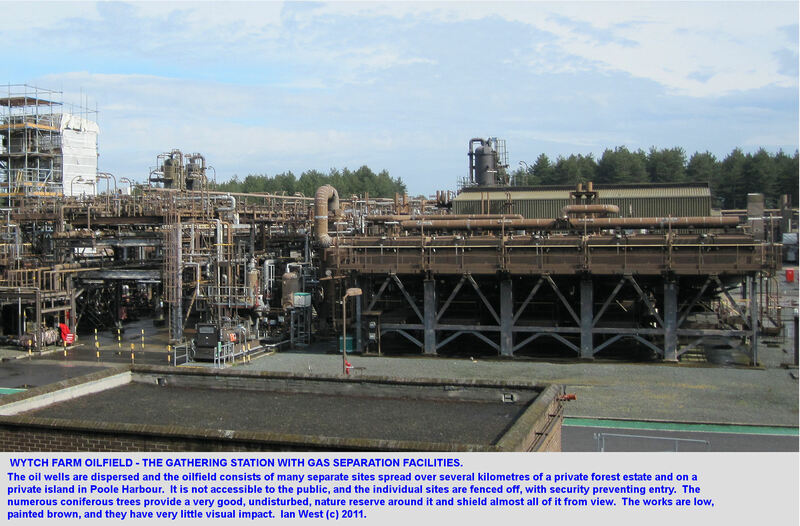 Following the discovery in 1973 of a commercially viable oil field at Wtych Farm, Gas Council (Exploration) Limited - GC(E) - are now developing facilities at the various well sites, gathering station and railhead at Furzebrook. (Map 1). 1.2. During exploration of the Wytch Farm field [i.e. Bridport Reservoir], a second deposit [i.e. Sherwood Reservoir] of oil was found in 1977 which lies beneath and probably displaced to the east of the original field. 1.3. To further investigate both deposits of oil GC(E) submitted a planning application to drill two evaluation wells on Goathorn peninsula. Following advertisement of the applications, objections wer received by Dorset County Council, many of which relate to environmental factors. ..
1. The maximum formation pressure likely to be encountered will be accurately estimated. 2. The well will be circulated with a suitable quantity of properly conditioned and weighted mud to compensate for this pressure. 4. Estimates by GC(E) engineering staff indicates by comparison with Wytch Farm that, in the unlikely event of a "blow-out", then a flow in the region of 3,000 barrels of oil per day could result. The holding capacity of the well site within the bund wall is 17,500 barrels. This would allow a period of about 5 and a half days to to bring in any additional measures needed to control the pollution. [reference is made on p. 40 to the safety record of BP for having drilled 10,000 wells on land for some ten years without the occurrence of a "blow out". The failure of a "blow-out" preventer is estimated at 1 in a million. The "blow-out" risk at Wytch Farm is estimated at 1 in a million. In fact from 1973 to 2013, forty years, there has never been a "blow-out" at Wytch Farm. 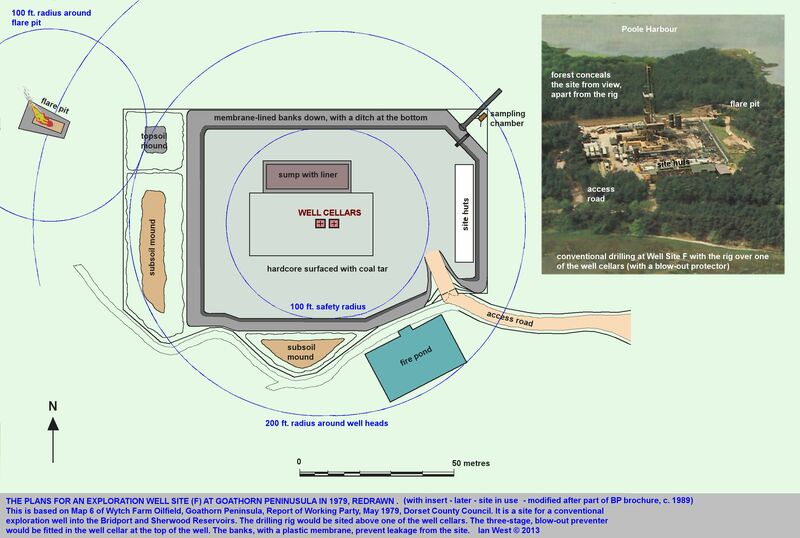 The diagram above shows the layout of a conventional well-site of 1979. This is based on, but redrawn from a plan in the Goathorn document, mentioned above. The well-site plan shown probably indicates the general pattern for traditional-type exploration wells in southern England. The site for the much larger, Extended Reach Boreholes, is site M on Goathorn Peninsula and not the one shown. The ERD site M is, as would be expected, on a larger scale. The flaring facility is necessary when drilling a new borehole because there would have been initially no gas pipeline, and therefore any gas encountered during drilling is normally flared off to dispose of it. Later when oil production takes place then any gas is piped off and processed before being made available for domestic use. 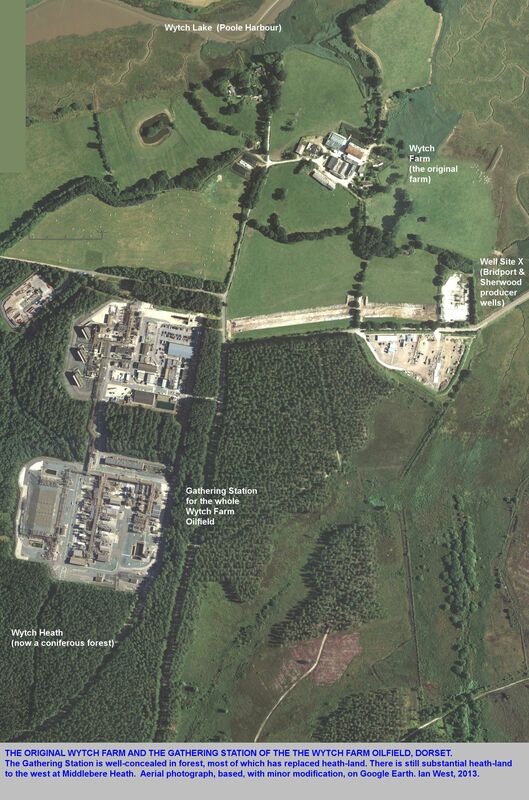 Wytch Farm now supplies gas to the domestic system by pipeline to Sopley, near Christchurch. As noted above the oilfield was initially producing only from the Bridport Reservoir, the higher stratum. 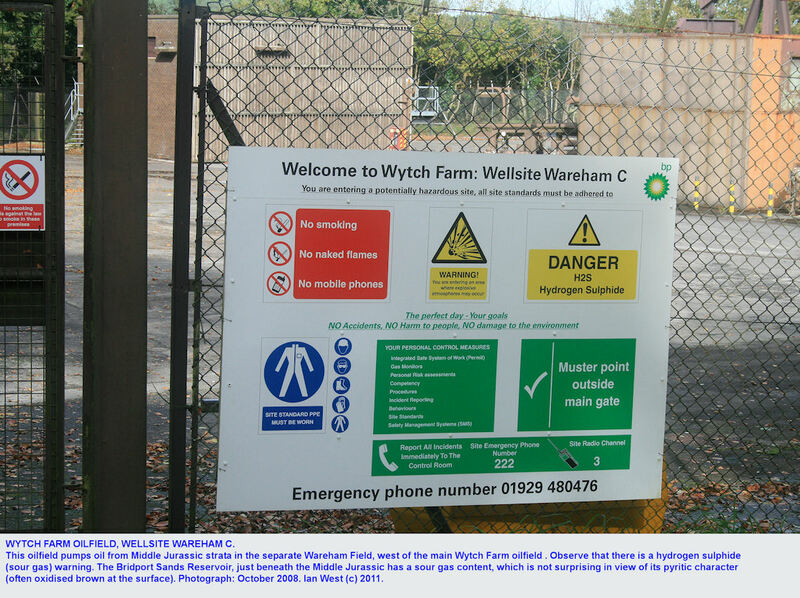 In 1978 additional deeper wells had been drilled from Wytch Farm's existing wellsites. Afterthe change of ownership BP drilled into the Sherwood Sandstone. It has already been suggested in the days of British Gas that this was a probable reservoir, but it has been said that BP were initially doubtful about this. In any case it proved to be very sucessful. Much larger reserves were discovered in the Triassic Sherwood Sands Formation at 1585 metres (5200 feet). 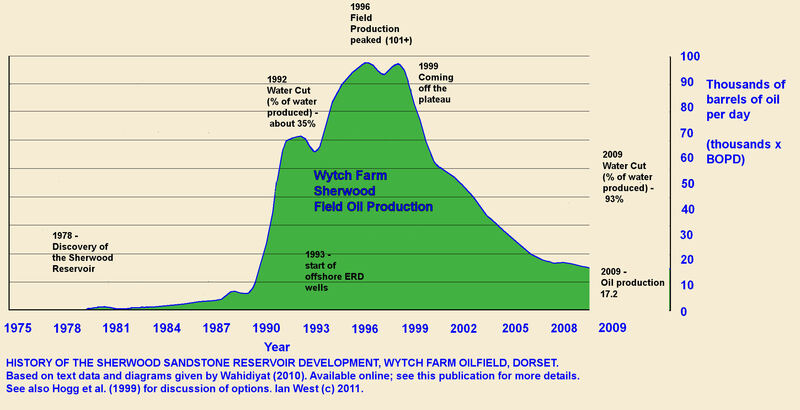 From the beginning of 1988 to the end of 1990, Stage II in the development of the Wytch Farm Oilfield took place. The expanded facilities produced an annual average of 65,000 barrels per day in about 1992. Production peaked at 101,000 barrels per day in 1996. It has been in decline since then, but new reserves are in sight. It now produces round about 17,000 barrels per day, mostly from the Sherwood reservoir. 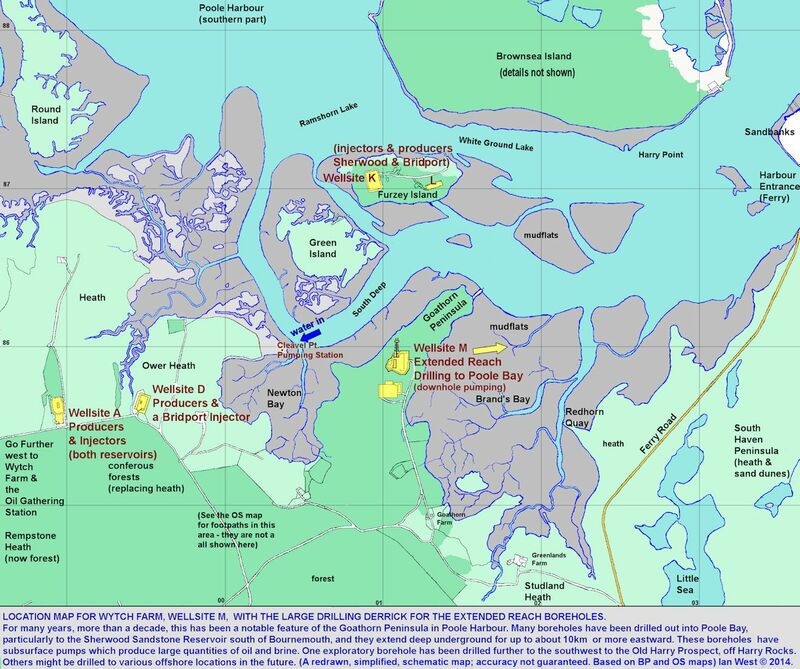 In 1984 British Petroleum announced plans to drill on Furzey Island which it purchased from Algy Cluff (one time owner of the Spectator and who had earlier founded his own private oil company) (Legg, 1987). From Furzey Island there was to be directional drilling into both the Bridport Sands and the Sherwood Sandstone. Drilling at up to 60 degrees meant that it was possible to go further laterally into the deeper Sherwood Reservoir. There is now a substantial area of well heads and oil pumps on Furzey Island, visible on aerial photographs, but almost entirely shielded from Brownsea Island and other parts of Poole Harbour by coniferous trees. Furzey Island was used and is in use, and according to planning applications may be in use until at least 2037. Another aspect of the applications was to site a major well on the Studland Peninsula at Shell Bay. However, there was sustained opposition because of fears of oil spillage, interferance with the natural drainage pattern and the unacceptable nature of the roads and traffic that it would require. A further problem was that Shell Bay had become National Trust land in 1982 ( (Legg, 1987). If the objections had not been made then the very large Extended Reach Borehole might have been sited at Shell Bay. This would have increased the chances of reaching distant locations such as the Beacon Field. Environmentally the problems would have been great, though. In the 1990s, steering of borehole bits became possible and then long, Extended Reach Boreholes, could be made. There had always been a problem of how to extract oil from the eastern part of the Sherwood Reservoir. This extends into Poole Bay, almost reaching a position south of Bournemouth Pier. At one stage the Wytch Farm oilfield held the record for ERD with a borehole extending eastward for 10.1 km. A later borehole reached 10.5 km. Although sometimes wrongly regarded as a new procedure that takes place elsewhere in the country, water injection has long been an essential part of the Wytch Farm production. It was discussed in the BP Consultative Document of 1984 and has long had planning approval. There is a range of techniques available for the management of production levels and in this case both reservoirs [NB. Both reservoirs, the Bridport and the Sherwood Reservoirs] will be served by pumped production wells with pressure support by peripheral water injection through dedicated wells drilled for this purpose. Due to more favourable geological conditions the predicted recovery from the Sherwood Reservoir presently stands at 38%. Since the date of that document many injection wells have been drilled. The "injectors" have always been shown on maps of the oilfield produced by BP, and there is no secrecy about this. In about 2002 there were 8 Bridport Injectors and 13 Sherwood Injectors. These carry high pressure water from Poole Harbour to the periphery of each oilfield. For supply of Poole Harbour water (seawater) there is a pipeline from Furzey Island to wellsite M on Goathorn Peninsula. The original plan in 1984 for the Sherwood Reservoir was to have 30 pumped production wells and 12 water injection wells. 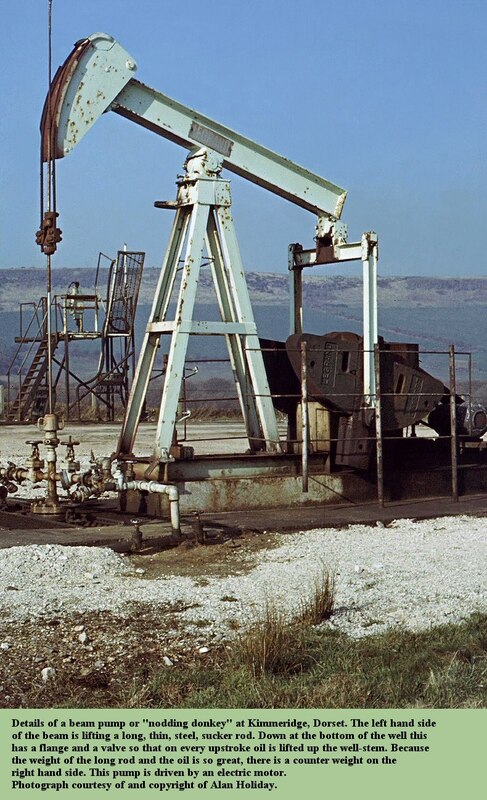 It was suggested that a condensate injection well might be required [condensate is condensed gas, and if there are unneeded low levels of gas from some wells this can be reinjected into the oilfield, partly for disposal and partly to increase the pressure in the reservoir.]. 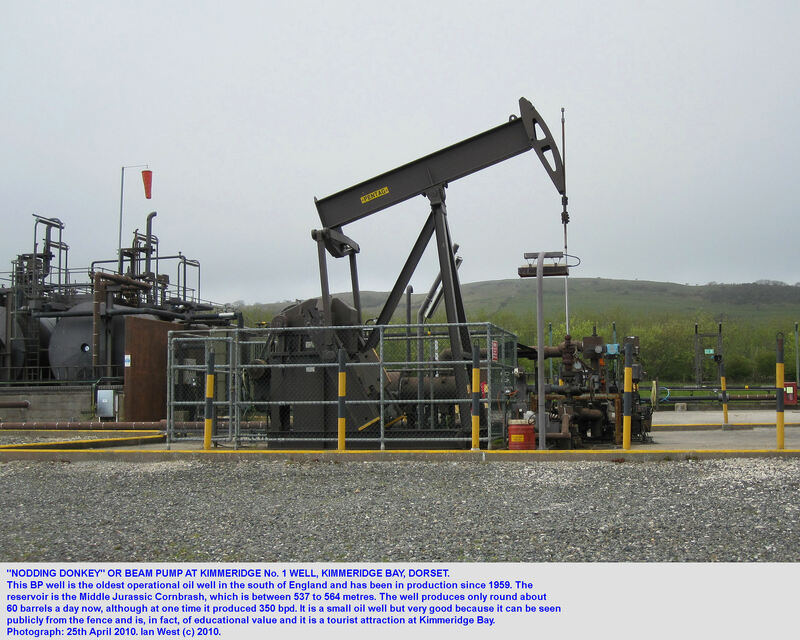 It is not known whether a condensate injection well was put into the oilfield. The produced water (in large proportion in the Sherwood Oilfield) contains some oil and some fine sand. These contaminants and dissolved gases are removed. The water is primarily used for reinjection into the reservoirs to maintain high hydrostatic pressures (to drive out oil and/or open up the rocks). On occasions the injection plant may be unavailable, and then subject to discharge consent the spare water may be disposed into Poole Harbour. These details are from p. 16 of the 1984 Consultative Document. Seawater extraction rates from Poole Harbour of 80,000 barrels per day (i.e. about 3 million gallons per day) would be required to supplement the production water reinjection quantities. The seawater from Poole Harbour requires treatment to remove sand, marine organisms and dissolved gases. Note that if this level of injection to locations around the periphery of the oil field is taking place and has been taking place for decades, then the questions arises at to whether the area is being "pumped-up", like a car tyre on a large scale. However, because of the large area of the oil fields this may not necessarily be noticeable, and it has be considered with the understanding that oil and gas is being pumped out and piped away. [No claims is made here to understand the details or the final balance of this, but something might be happening but it would have to be on a very small scale. There is no obvious evidence yet of land-level changes. In any case, water injection can be beneficial. There are suggestions of raising Venice 25 or 30 centimetres by water injection into an underground reservoir - see the internet on this topic. 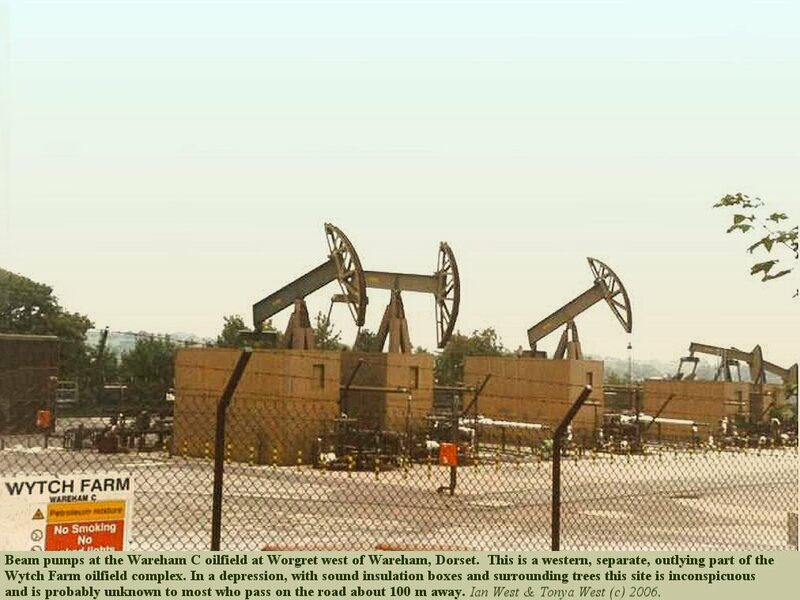 Subsidence in an oil field is generally considered to be more of a problem than than land raising. Twenty-eight oil fields world wide have been affected by subsidence after extraction of hyrocarbons. 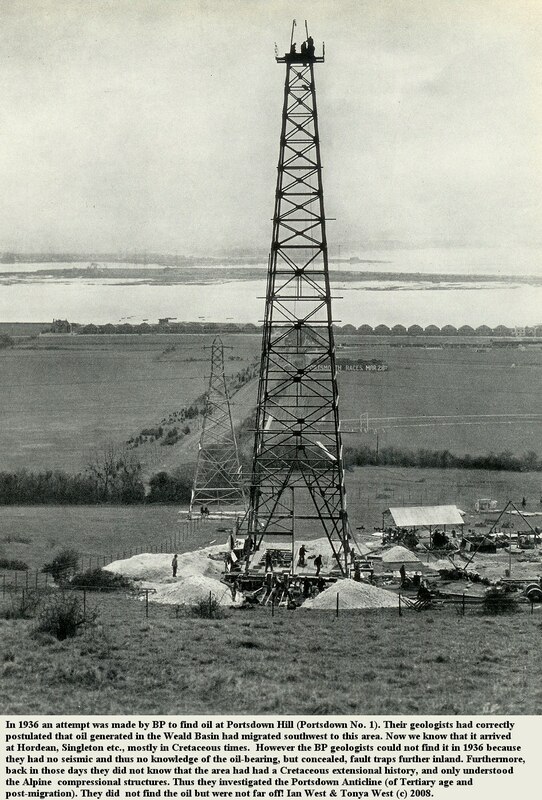 After 9 metres of surface subsidence took place above the Wilmington Oil Field in California, water injection was used to ameliorate the problem. See: Mayuga (undated about 1970?). An interesting question is what if anything will happen when the water injection stops. This might not be until at least 2037 because Perenco have planning permission to operate the oil field until then, and, of course, in some way it might continue. The end of the Sandbanks Peninsula does not show obvious signs of sinking or rising. Shold there be significant changes of land level, it is likely that the margins of Poole Harbour might reveal this. The subsidence of the Groningen Reservoir of the Netherlands might have some relevance to the Sherwood Reservoir of Dorset, because both are of sandstones in the Permo-Trias. See: Geertsma, J. 1973. 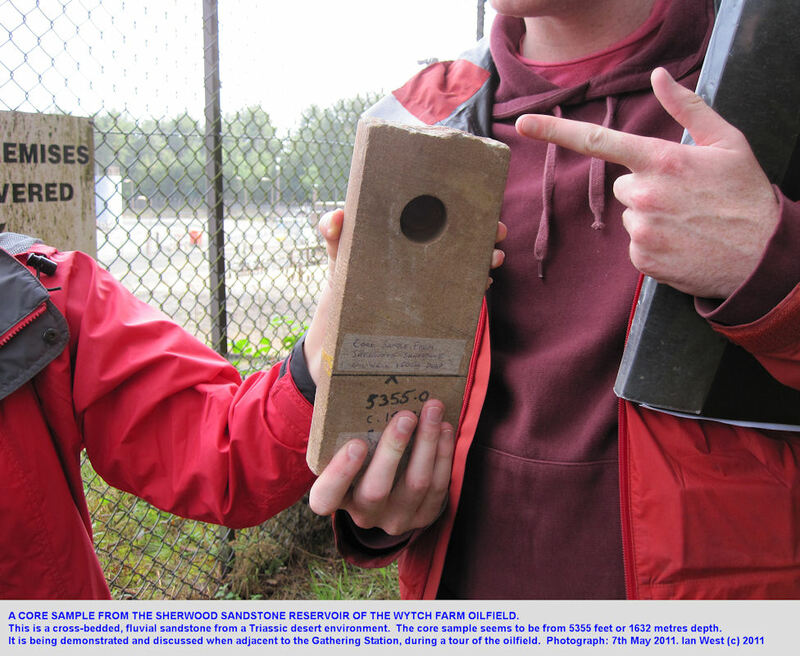 "Subsidence Due to Hydrocarbon Production in the Netherlands" - available online. (Depth of the Groningen Reservoir is at 2750 to 2900m compared to 1600 for the Sherwood Reservoir of Dorset. Its thickness is 100 to 200m and in this respect it is similar to the Wytch Farm Sherwood Reservoir of about 150m thick.) The matter of possible land raising or sinking will be left here for the present. It is not necessarily implied that major movement up or down affecting property etc has occurred or will occur in relation to Wytch Farm Reservoirs. Nothing drastic has happened since the oilfield operations commenced in 1973! In 2011, there was an oil leak from a pipeline Mason (2011). The oilfield was shut down for about three months. Much work was done so that it was apparently in safe condition when shortly afterwards sold to Perenco. Uncertainties of the Future - Gas - Frackng? 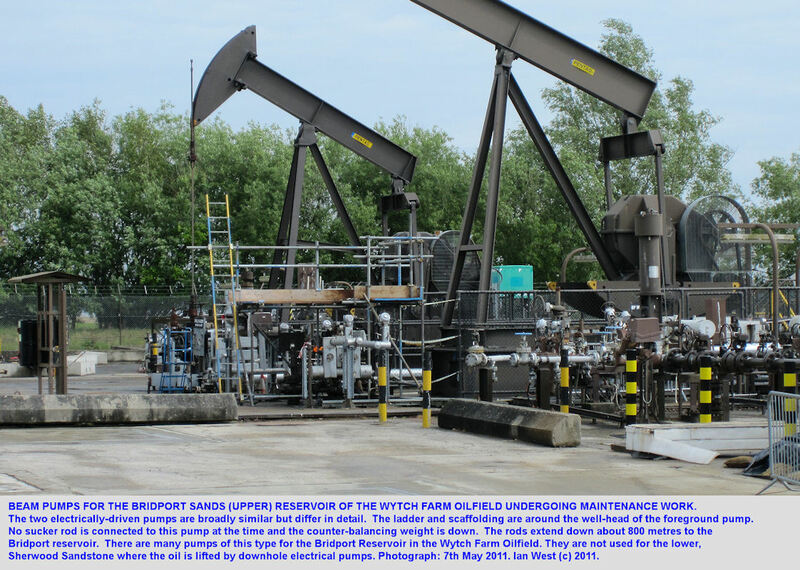 Perenco UK took on the whole of the Wytch Farm oilfield, employing many of the original BP staff. However, the sale required as part of the contract the exploration of the Beacon Field. 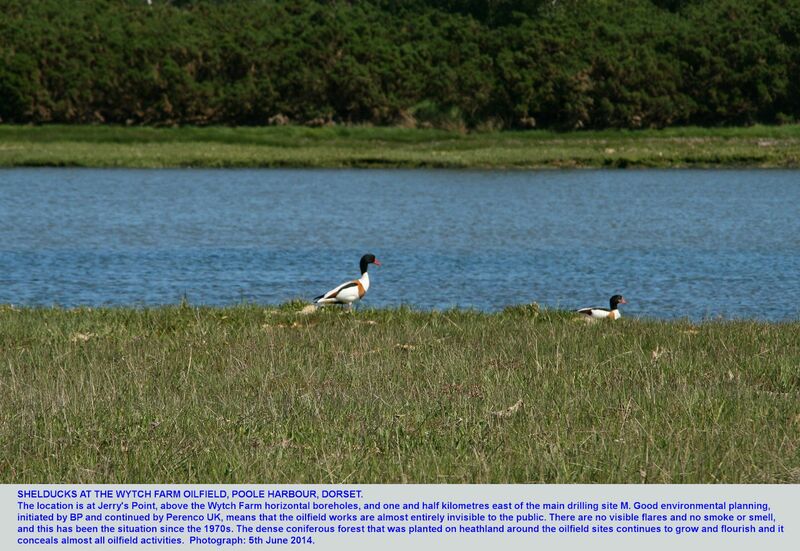 This, shown on some maps in this website is about 5 km south of Hengistbury Head. It is a Sherwood Sandstone Reservoir and probably at about the same depth as the main Sherwood Reservoir. It is roughly on the same east-west line, but further east. The problem is whether it can be reached by a new phase of even-longer extended reach drilling, probably about 15km. If this is not technically possible, then a borehole of ERD type needs to started from the area of Hengistbury Head, Mudeford, Bournemouth or adjacent area. It is believed, although not confirmed, that some initial suggestion has not been followed through. The problem of finding a suitable site for a very large drilling rig and the necessary associated facilities has apparently not yet been solved. It is not know, either, whether the oil, water and gas would be pumped to Wytch Farm with its separation plant, or whether new separation facilities would be needed in the Bournemouth region. The matter is a mystery unexplained and perhaps unresolved. Examine the maps of the Beacon Field. There are other, rather speculative, possibilities of connection to the Wytch Farm Oilfield but they may or may not take place. The Durlston Head Gas Field of Swanage is shortly to be drilled into by Infrastrata from California Quarry. This may be just exploration. 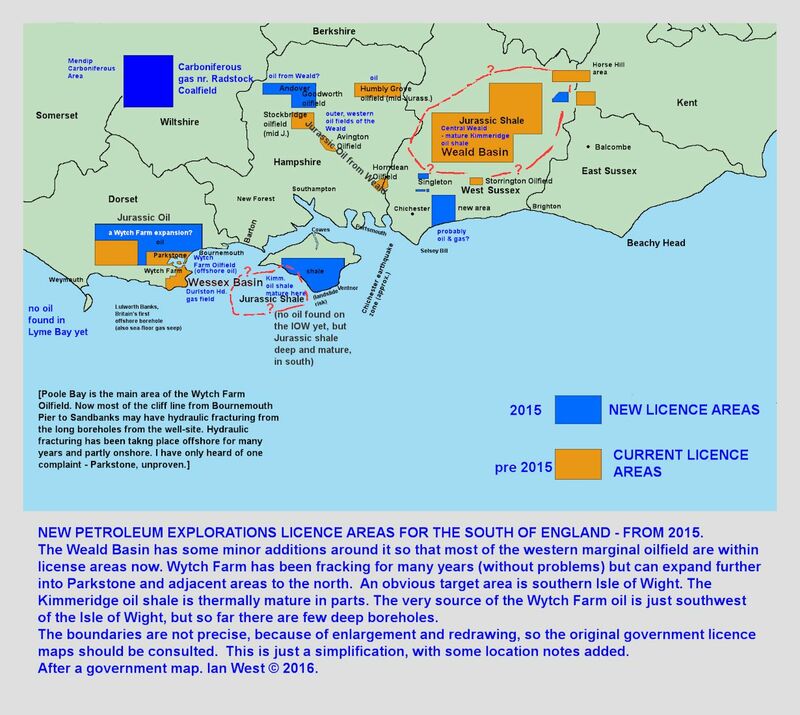 If however, much commercial gas is available then it might be possible to link the Durlston Head gas field to the gas terminal at Wytch Farm (via Corfe Castle) and from there on to the Sopley gas connection to the main supply. However, this is entirely speculation, as no plans are known. 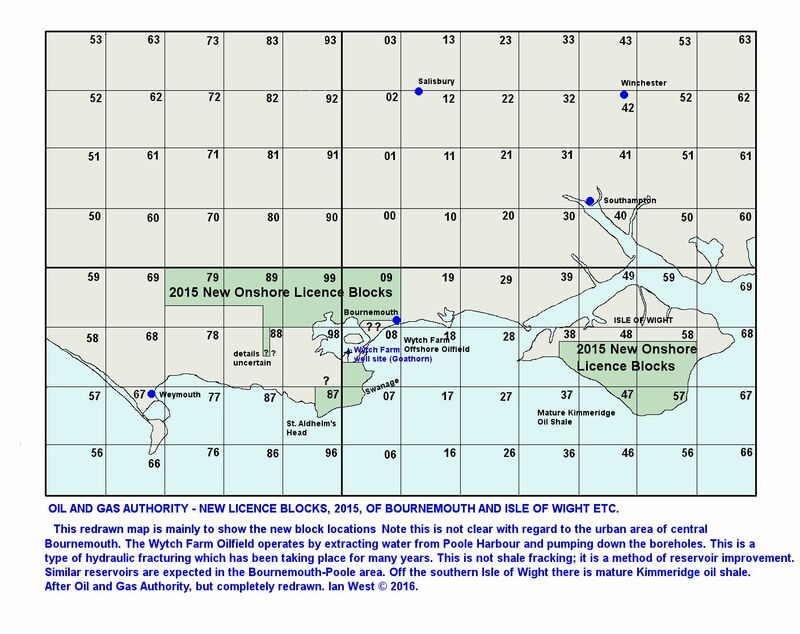 Longer term questions might come to mind regarding the fact that there is a shale-gas (unconventional energy) to the southeast of Durlston Head (at some distance). It is very unlikely that there are any immediate plans regarding this, because success in the central Weald (Balcombe, Fernhurst etc) is needed before anything happens offshore from Dorset (note onshore Dorset generally does not have thermally mature shale; the real prospects are only in the Jurassic basin offshore). Of course, none of this might involve Wytch Farm Oilfield in any way and Perenco UK does not have the licence for the deep Jurassic basin, which is some way to the south of its offshore territory. "In April 1968, a number of Production Licences were granted in the Wessex Basin to BP/Gas Council partnership, which was operated by BP. 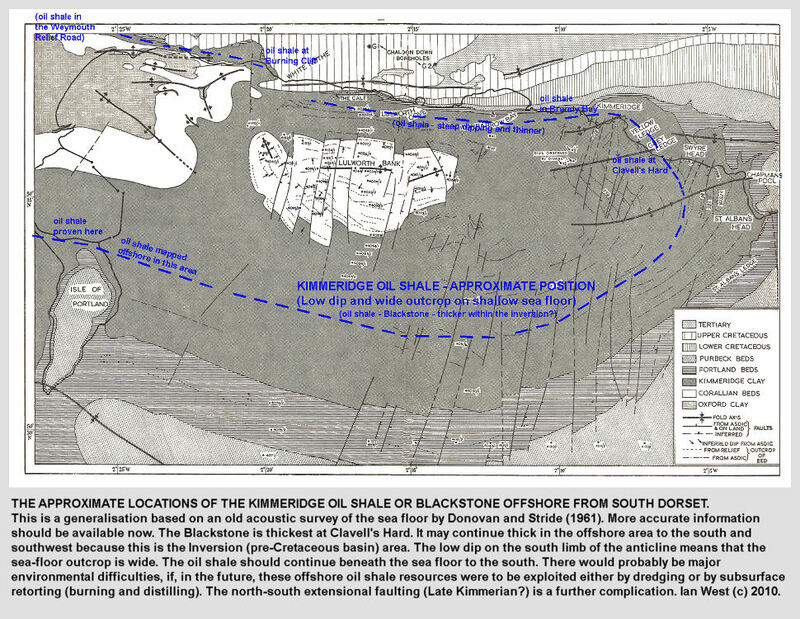 Oil had already been discovered by BP at Kimmeridge in the 100 percent BP ML5 and production was established from fractured rocks in the Cornbrash. Subsequently in 1964, BP drilled the Wareham No.1 Well, which found oil in thin fractured Inferior Oolite, but which was not production tested until 1970. A study of the Wessex Basin carried out by Gas Council (Exploration) (GC(E)) Ltd. in 1972 concluded that the Bridport Sands offered better and more predictable reservoir properties than the fractured rocks believed to be producing in Kimmeridge No.1 and Wareham No.1. On the assumption by GC(E) of the operatorship of the BP/GC(E) group, the Wytch Farm No.1 Well was proposed to test a structure found on seismic data obtained by a BP seismic party. 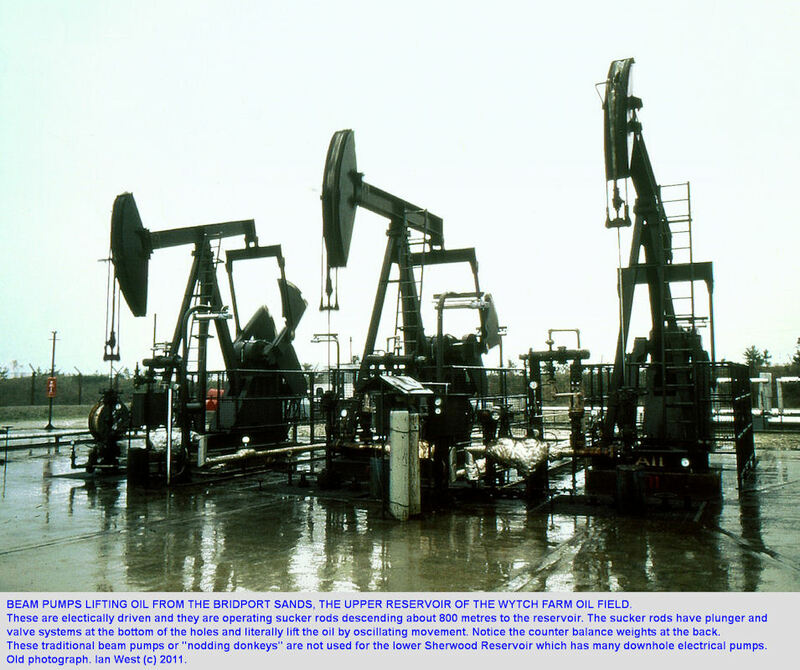 The well was spudded in December 1973, and found light oil in the Bridport Sand, trapped in an east-west - trending anticline, downfaulted to the south. Subsequent studies on the structural history of the area, together with geochemical data, suggested that the oil originated south of the Purbeck - Isle of Wight Disturbance from Jurassic sources, and could also have migrated into the Triassic Sherwood ("Bunter") Sandstone of the Wytch Farm structure. To test this view, the Wytch Farm D5 Well was spudded in December 1977, and found light oil in the Triassic reservoir. To date , in addition to the wells mentioned, three delineation wells, six production wells and three water injection wells at Bridport Sands level have been completed, and a well has been drilled to the pre-Permian basement at location X14. Further delineation of the Triassic Sandstone accumulation is in progress [in 1981]." 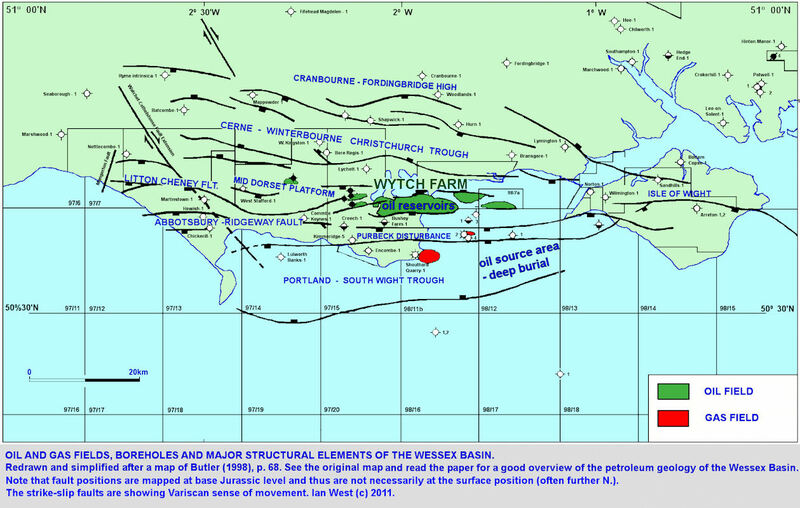 By Barremian (Cretacous, top Wealden) times the Blue Lias and Shales-with-Beef, the source rocks for the Wytch Farm oilfield had been buried, WSW of the Isle of Wight, to more than 2250 metres, as shown by the map above. This seems marginal for oil generation, although an additional minor factor was that this was at about the time of the Cretaceous thermal maximum. Thus the average surface temperature was higher than normal. The Lias source rocks are believed to thermally mature in the dark blue area of the map, but not so to any signficant distance beyond this. The Kimmeridge Clay was probably not, in general, thermally mature. Wytch Farm is Europe's largest onshore oilfield. It has reserves of 467 million bbl - 74 million cubic metres. There are three reservoirs: the Frome Formation (Middle Jurassic), a relatively minor reservoir, at about 800m; the Bridport Sands (Upper Lias, Lower Jurassic) at about 900m; and the Sherwood Sandstone (Triassic) the most important reservoir at about 1600m. 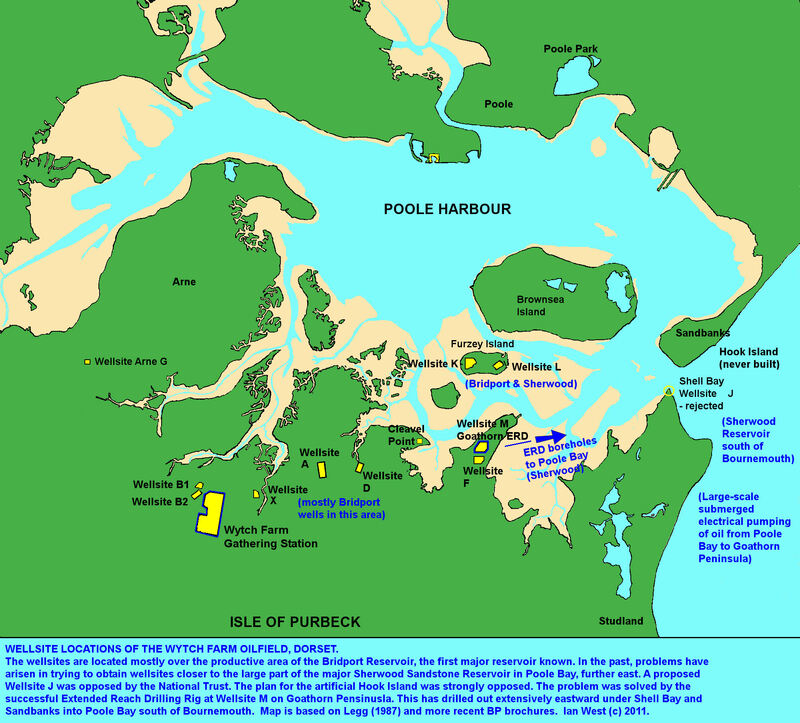 The oil field is situated on the south side of Poole Harbour, in the northern part of the Isle of Purbeck, with extension seaward, to the east, into Poole Bay. The original and main site is on a branch road from Norden (near Corfe Castle). The oil field is well-concealed in the Purbeck Forest and most of it is in private land inaccessible to the public. Very little of it can be seen without special arrangements. 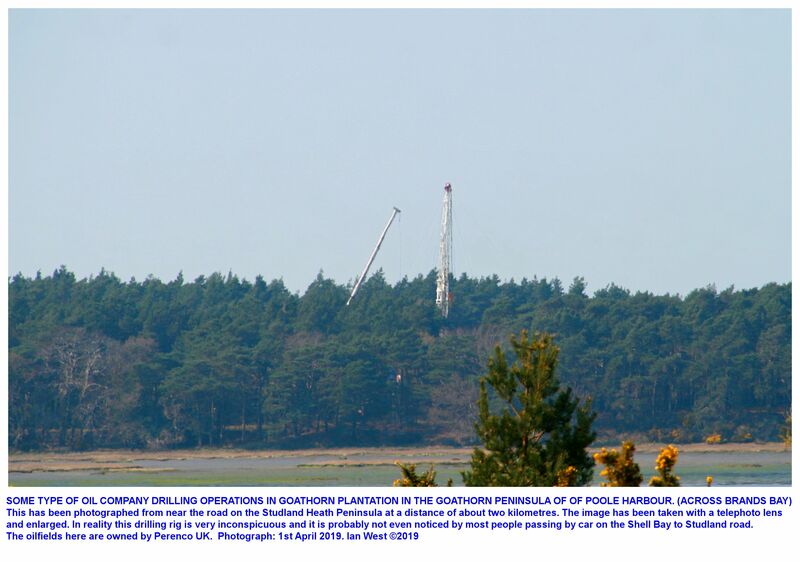 The huge Goathorn drilling rig projects well above the trees and can be seen from the South Haven Peninsula, and from Brownsea Island and Sandbanks. The public cannot get close to this. Some pumps, successfully concealed from environmental impact, are on Furzey Island in Poole Harbour. There is also a gathering station, a rail terminal and a pipeline to Southampton Water. All this is very well-known, but it is hardly seen at all by the public because of a prize-winning environmental policy by the operators - BP. The Bridport Sands reservoir was in production since 1979. The Sherwood Sandstone reservoir is extensive and continues eastward under Poole Bay to near Bournemouth Pier. An early plan to obtain oil from the relatively shallow water of Poole Bay was to construct an offshore island, Hook Island. This scheme was rejected and difficult to implement in a such an environmentally sensitive and valuable residential and holiday region. 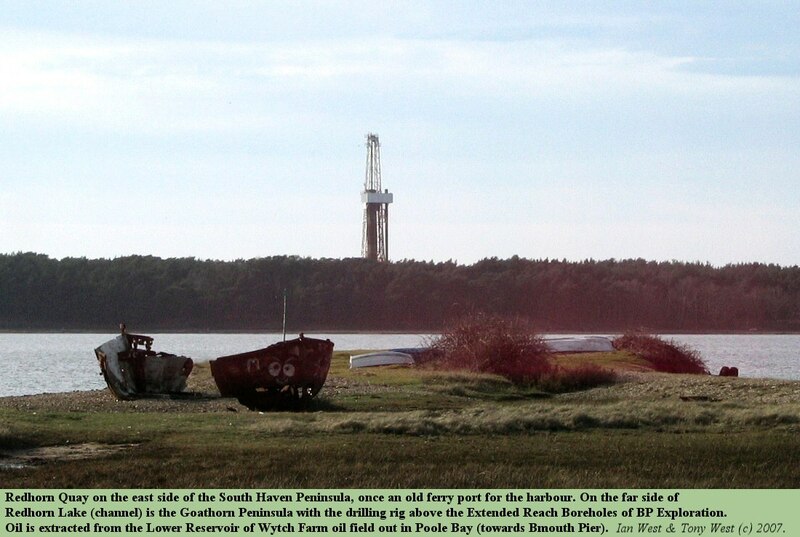 Later there was much success with Extended Reach drilling from the Goathorn Peninsula, northwest of Studland village. This type of drilling accelerated production by three years and continues very successfully. The southern half of Brownsea Island, in Poole Harbour, lies above part of the Sherwood Sandstone reservoir (the lower reservoir) of the Wytch Farm Oilfield. The Bridport Sands reservoir approaches the south shore of the island. Across the channel to the south of Brownsea Island is the Goathorn Peninsula. 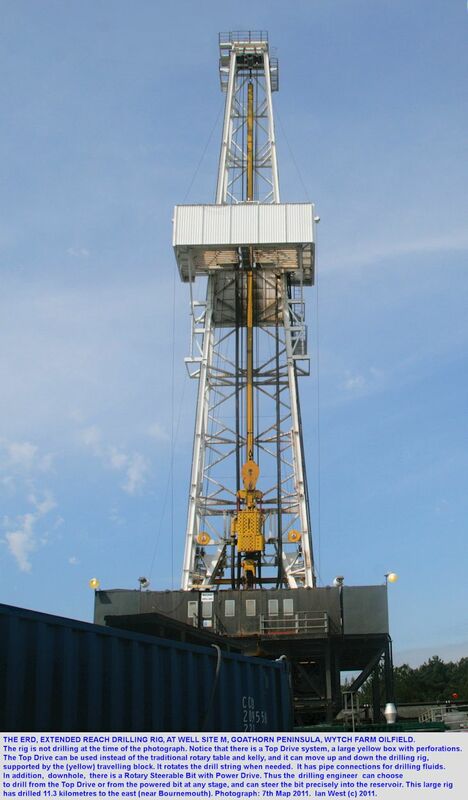 Here the Extended Reach Drilling Borehole of BP has broken records for lateral drilling. Boreholes penetrate the Sherwood Sandstone reservoir from beneath and extend more than 10 km. eastward into Poole Bay. The terminate south of Bournemouth, not far from Bournemouth Pier. The Goathorn drilling rig can be seen from Brownsea Island with the naked eye but it is at a moderate distance and is not conspicuous or obtrusive. The photograph above was taken with a low-power telephoto lens. 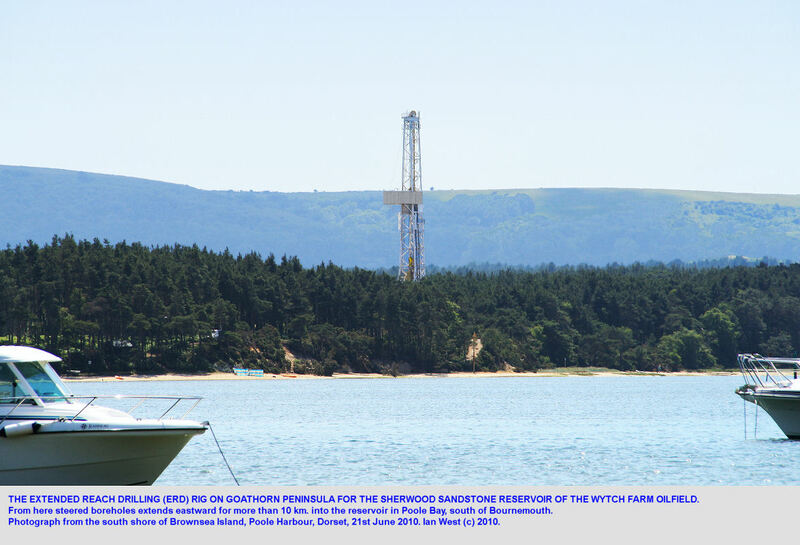 It is looking southward to the BP drilling rig from the B-P (Baden Powell) Scout Camp area of Brownsea Island. Beyond are the Purbeck Hills of Chalk. 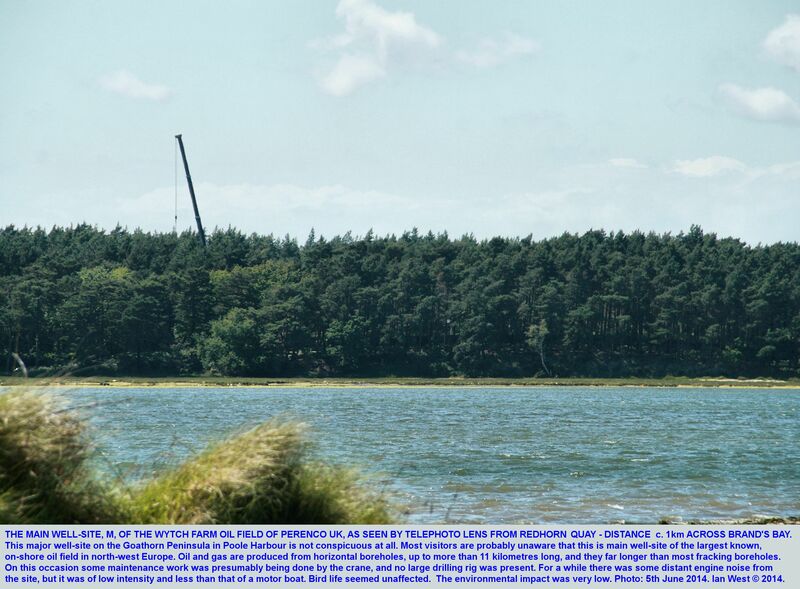 From Brownsea Island the rig is just a subject of interest projecting above the forest. 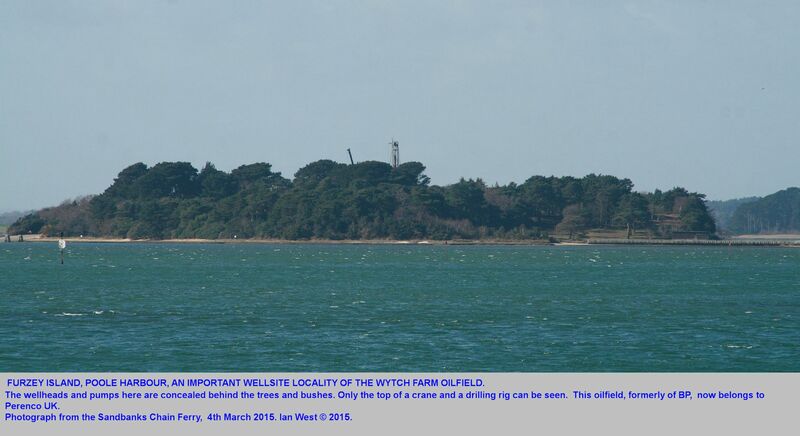 Little else of the Wytch Farm oilfield is visible from here, even though Furzey Island, just to the southwest of Brownsea Island has many boreholes and is a major terminal for oil wells. Almost everything is concealed by coniferous trees. 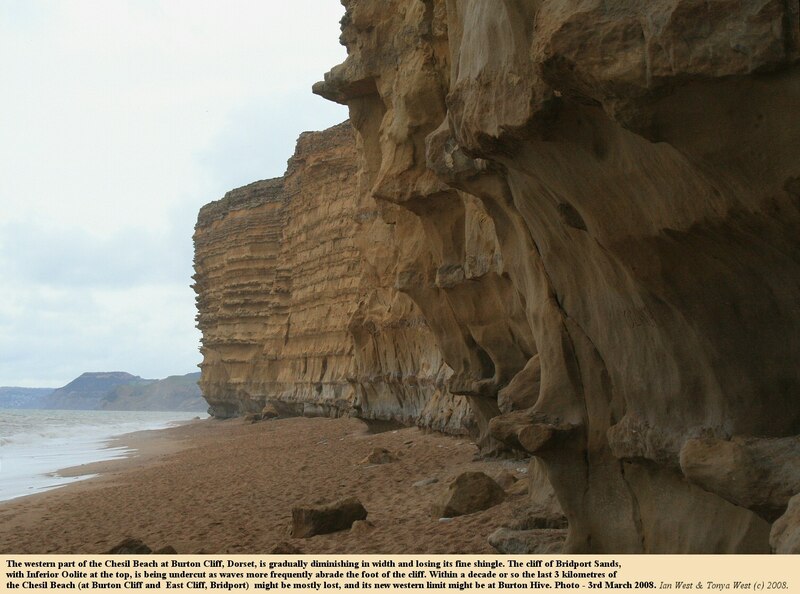 The Bridport Sands are well known as the Upper Reservoir of the Wytch Farm Oilfield, Dorset. As a marine Jurassic sandstone, with good porosity and permeability, they form a good, conveniently accessible example of a Jurassic reservoir, and are not greatly different from North Sea sandstones, such as the Brent Sandstone. Burton Bradstock - Bridport Sands. The Bridport Sands, mostly Toarcian (Upper Lias) in Dorset are well-known as being part of a very diachonous unit - the Midford Sand and Bridport Sands. These sands generally young southward from the Cotswold area. At the coast section at West Bay, Bridport and at Burton Bradstock the formation mostly belongs to one zone, that of Dumortieria levesquei. This is the uppermost zone of the Toarcian. The uppermost 2 metres there belongs to the Leioceras opalinum Zone, which is the basal part of the Aalenian. Similarly in the Winterborne Kingston No.1 Borehole the bulk of the formation is probably Toarcian. However, Colter and Havard (1981) commented that indirect palaeontological evidence at Wytch Farm suggested that "there is a good chance that it is all of Aalenian age". This would not be impossible because of its diachronous behaviour. However, House (1993) seemed rather sceptical about this and stated that this is probably the result of lack of good age markers in the early part of the Bridport Sands there. The Sherwood Sandstone Group of the Trias is well-known because because it is easily seen in the red sandstone cliffs of the Budleigh Salterton to Sidmouth area of Devon. It changes thickness and details of facies in a general east-west direction. It is very much thicker in Devon, but is still reasonably thick at the Wytch Farm Oil Field. It thus generally thickens towards the west. This is quite different from the thinkening and thinning directions of Jurassic rocks above. A major factor is that is thick enough to be an important reservoir rock at Wytch Farm Oil Field, south of Bournemouth, but it does not extend over any wide area of the Weald Basin. This western regional dip is not matched in the Jurassic strata above; the Kimmeridge Oil Shale for example is present in both basins. Thus in terms of the Jurassic strata there is good comparison between the Portland - Isle of Wight Basin (the Wytch Farm oilfield etc) and the Weald area, but not in the case of the Triassic strata. This simple observation is not always recognised. (It should be noted that some boreholes in the southern Weald area may have been intending to enter some Sherwood Sandstone, but details are clear). Note that only certain parts of the Sherwood Sandstone Group are good reservoir rocks. The principal reservoir of the Wytch Farm Oilfield is the Sherwood Sandstone of Triassic age. It is exposed on the East Devon Coast in the area from east of Sidmouth (see photos above) to west of Budleigh Salterton. It contains about 416 million barrels of oil reserves. The western part of the reservoir lies beneath Poole Harbour and adjacent area, while the large eastern part is under Poole Bay. More than half of the Sherwood reserves lie in the offshore area (Poole Bay). This caused the drilling of ERD, Extended Reach Drilling wells, beginning in 1993. The large drilling derrick is situated at Wellsite M on the Goathorn Peninsula. 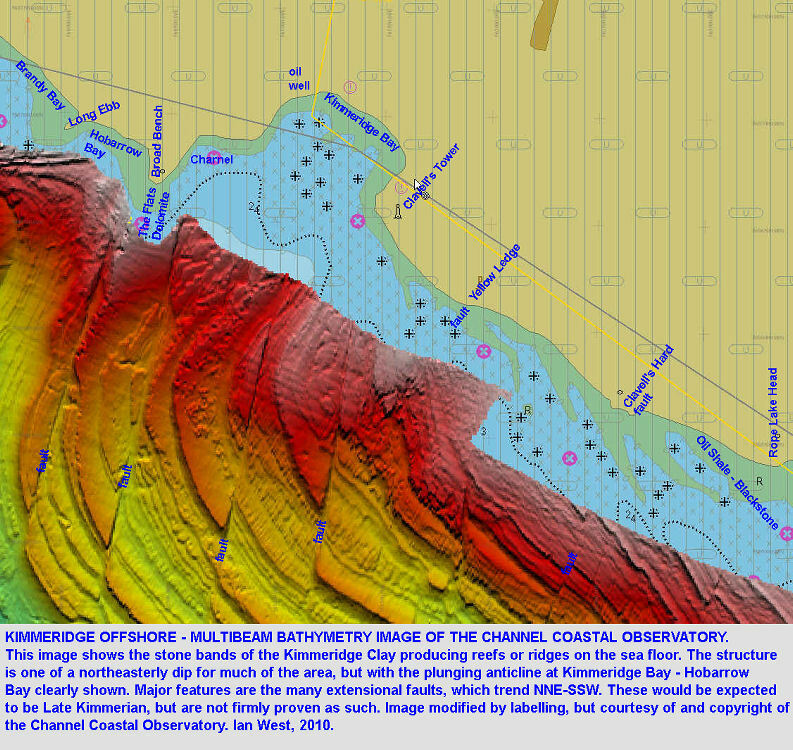 The Sherwood Sandstone Reservoir is at about 1585 metres depth (true vertical depth subsea - TVDSS) (Hogg et al., 1999). There is a maximum 110 metre column of oil-bearing sand above the oil-water contact in the Sherwood Sandstone Reservoir. The Sherwood Sandstone was deposited in E-W Early Triassic rift system, which developed as a result of extension along a pre-existing Variscan or Hercynian Thrust front. This Triassic rift system was broad scale and should not be confused with the local extensional faulting of the Cretaceous (Late Cimmerian or Sub-Albian), important for development of fault-traps. This later faulting resulted in three extensional faults running east-west under Poole Harbour and Poole Bay (south of Bournemouth). They are from north to south, the Northern Fault, the Arne Fault and the Wytch Farm Fault. These are shown in a map on p. 1158 of Hogg et al. (1999). 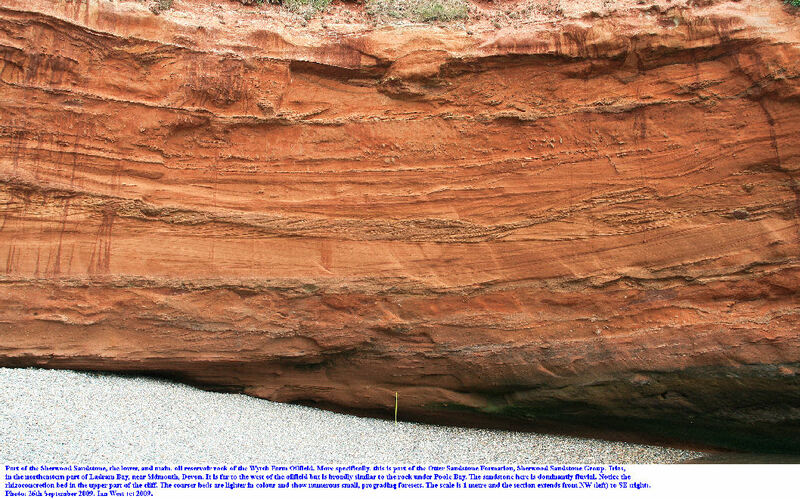 The Sherwood Sandstone rests on playa mudrocks of the Permian Aylesbeare Group (seen at Littleham Cove in Devon) and is conformably overlain by playa mudrocks of the Triassic Mercia Mudstone Group (seen near Sidmouth, Devon). This acts a caprock or seal. The Sherwood reservoir is formed from a complex and heterogeneous arkosic alluvial succession deposited in a semi-arid, red-bed palaeoclimatic setting (Bowman et al. 1999). It was deposited near the confluence of two major braided alluvial tracts draining northward from France and westward from the Brabant Massif (Belgium). It is interesting to note that these Triassic sediments are immature (i.e. arkosic with much feldspar), whereas the later sandstones such as the Bridport Sands are more mature (higher percentage of quartz). Because of the climatic conditions there has been development of calcrete and calcrete conglomerate. These palaeosol carbonate and, in addition, some beds of mudstone form baffles which affect the vertical flow of fluids (Bowman et al. 1999). Reservoir Simulator Models take into account the complications of vertical and horizontal fluid flow and enable reservoir management decisions about water injection strategy and artificial lift (Bowman et al. 1999). 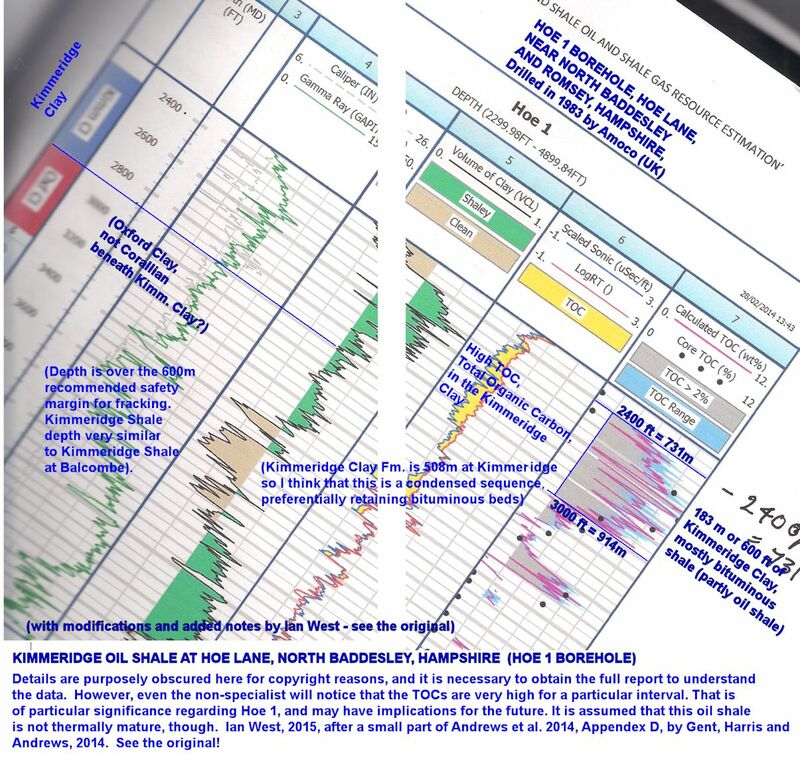 Detailed information regarding the Sherwood Sandstone Reservoir, particularly in terms of oil production, was given by Hogg et al. (1999) and Bowman et al. 1999). Some more recent updated, summary information has been provided by Wahidiyat (2010). This later publication shows how the reservoir has reached a later and more mature stage in terms of oil production. Production from the Sherwood Reservoir accounts for 85% of the total Wytch Farm production. As the diagram above shows, it has passed the phase of peak oil production. It is still producing a large quantity of oil and gas but the Water Cut (percentage of water produced during pumping) has risen to a relatively high level. Measures have been taken and more can be taken to extend the life of this productive reservoir. The Sherwood Sandstone Group reservoir at Wytch Farm has been described by McKie, Aggett and Hogg (1998) - Reservoir Architecture of the upper Sherwood Sandstone, Wytch Farm field, southern England. This paper is in the Geological Society Special Publication, No. 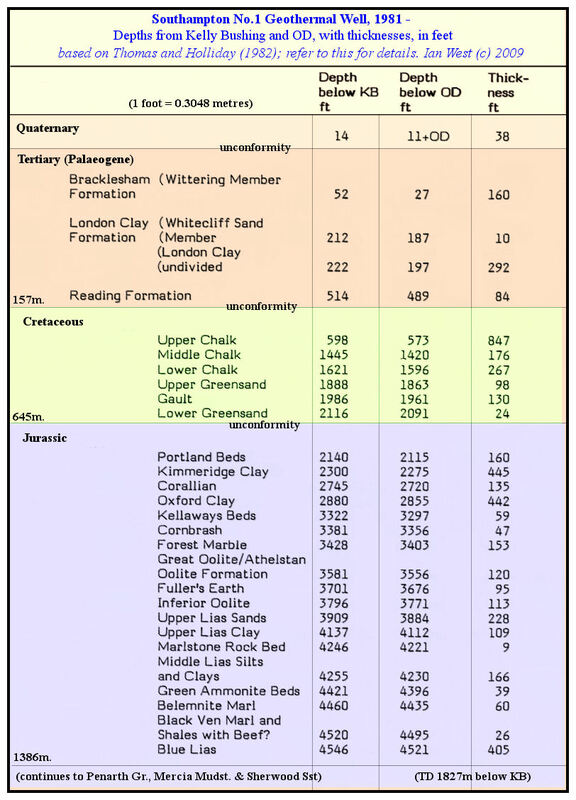 133, Development Evolution and Petroleum geology of the Wessex Basin. It consists of about 150 metres of arkosic [i.e. feldpar rich] sandstone that originated in a continental environment, part of the supercontinent - Pangaea. It is not marine and thus quite unlike the Bridport Sands reservoir. The sandstones have been deposited in a variety of fluvial, lacustrine and aeolian depositional environments. The general setting was in the arid zone north of the equator (which has moved southward over time), and rather like the Sahara desert. The date was round about 245 million years ago. It should be noted that although the casual visitor to the North African deserts will be impressed by the general aridity, the sandy ground and the blown dust, a large proportion of the sediments are reworked by water during flash floods. Thus the impression from the geology is not necessarily representative of just what the surface would have looked like most of the time. 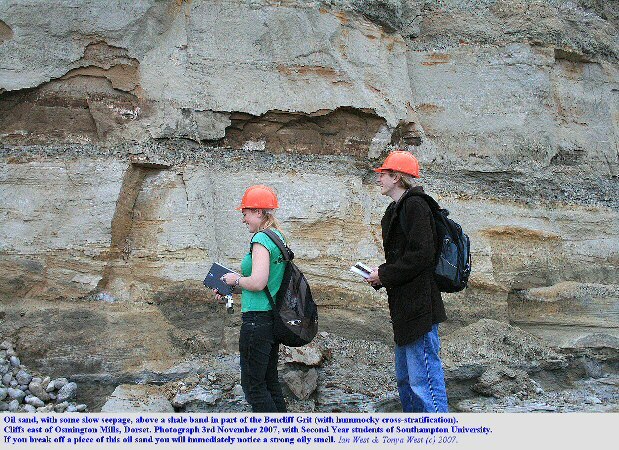 Of course, in British Triassic strata aeolian environments are recorded, and so too are lacustrine deposits. Lakes can be permanent but are often empheral in desert environments, and in such a situation are likely to precipitate evaporites. 3. Ephemeral lacustrine conditions [temporary desert lakes - sometimes salt lakes]. This trend through the red Sherwood Sandstone culminated in the deposition of the red, finer-grained, Mercia Mudstone [the "Keuper Marl" of the old literature]. McKie et al. considered that this represented a long term waning of sand supply and increased "flashiness" of the fluvial system [i.e. more flash floods]. The trend, discussed above, is further divided into second order cycles defined by five areally widespread floodplain and lacustrine deposits containing minimal development of fluvial sandstones. The petrography of the Sherwood Sandstone in the Wessex Basin has been the subject of a study by Strong and Miladowski (1987). Early diagenesis was characterised by carbonate (calcrete cementation) with non-ferroan dolomite and some evaporites towards the basin centre. Later diagenesis involved some grain dissolution of feldspar and anhydrite cementation (later subject to some dissolution). There are some quartz cements in places. Later weathering processes have also been discussed by these authors. The brines of the Wytch Farm Shewood Sandstone Reservoir have been studied by Worden et al. (2006). This Triassic reservoir contains very salty water. They found that the brines are of sodium chloride type, as you would expect in the Permo-Trias underground. They are not, however, as might have been expected, saturated for halite, but reach up to 230,000 mg/litre (saturation for salt is near 350,000). There is some decrease in salinity from the flanks to the crest, but the water there is still very saline water. These authors recognised two phases of influx of meteoric water (i.e. freshwater ultimately of rainfall origin), one probably of the Lower Cretaceous age and before the oil influx into the present site of the reservoir. The later was of Eocene age and was after or during Eocene oil influx (i.e. this is assuming that although oil could have been migrating earlier, probably during the Cretaceous, it moved into the present site in the Sherwood Reservoir in the Eocene). There is no evidence for fluid movement during the last 40 million years. The water used for water injection is partly produced water coming up from the wells and this is much greater in quantity than the oil produced. The major supply for water injection is seawater from the intake at Cleavel Point in Poole Harbour (where there is a very inconspicuous building looking like a hut). This seawater is injected through quite a large number of injection wells into both the Bridport and Sherwood Reservoirs. Most goes into the lower Sherwood Reservoir and may be at high or very high pressure. This hydraulic process effectively pushes out the oil and may to some extent fracture the reservoir sandstone in the process. 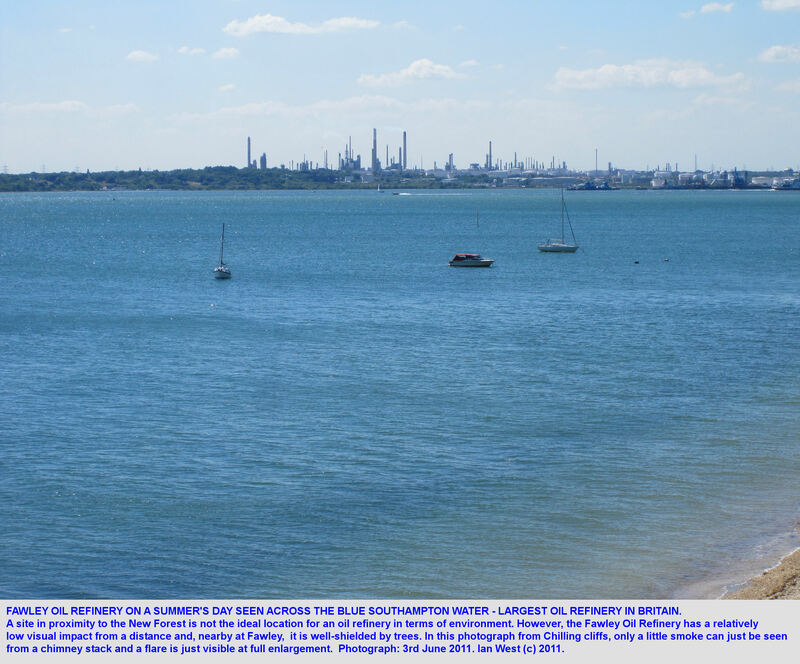 The Poole Harbour water is filtered, chlorinated and deoxygenated before being pumped to injection wells or used in the desalters (BP brochure). "Produced Water" does not necessarily have the composition of seawater. The reservoir formations contain natural brines more concentrated than seawater and may have a variety of components in solution (e.g. the Bridport Reservoir is a "sour gas reservoir" and contains hydrogen sulphide; the Sherwood Reservoir is not, but is more saline and contains various trace elements). Produced water is which is separated from the oil has chemicals added to prevent bacterial growth and the formation of scale. It is normally pumped back into injection wells or used in desalters. In terms of scale, years ago, probably in about 2000, the water cut (percentage of water produced) was somewhere near 50% (it is higher now). Oil production at about that date, according to a BP brochure, was designed to be about 65,000 barrels per day and the water injection was almost the same at 60,000 barrels per day. Thus about as much water should have been injected as oil was produced. The amount of water input was very large, about a million barrels in 17 days. Although the oilfield has been operating for forty years, and perhaps water-injecting for 20 or 30 years, there seems to have been no major problem. With water injection, as with other procedures, there seems to have been inconspicuous success without any serious deleterious environmental impact. One major consideration in injection water treatment is to prevent the reservoir from being "inoculated" with sulfate-reducing bacteria that can cause a reservoir to develop an in-situ H2S concentration during the waterflood. This particularly is a problem when using ocean water [as used at Wytch Farm], which contains both the sulfate-reducing bacteria and the sulfate ions that are their food supply. Once the sulfate-reducing bacteria have been introduced into a reservoir, they are essentially impossible to kill; however, they can be controlled with the injection of bactericides such as formaldehyde. Pressuring water to the desired injection pressure is the final step before it is piped to the injection wells. The wellhead injection pressure is calculated by subtracting the weight of the injection-water column from the desired bottomhole pressure, and then adding friction-flow pressure losses down the wellbore." 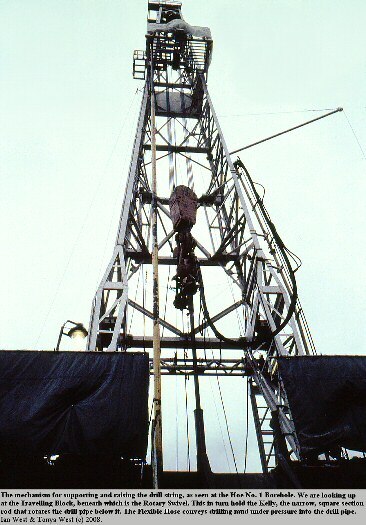 The water injection (or waterflood), already introduced above, has been used at the Wytch Farm oil field not just for a few years but for two or three decades. The methods might have changed. It was originally used to facilitate production of oil from the Bridport Reservoir and there are several water injection wells into this (old data - 1 at B1, 2 at B2, 2 at A, 1 at D, 2 at L, according to "Oil at Wytch Farm", BP, 2002?). Water is pumped out of Poole Harbour at Cleavel Point (up to 90,000 barrels a day in 2002). 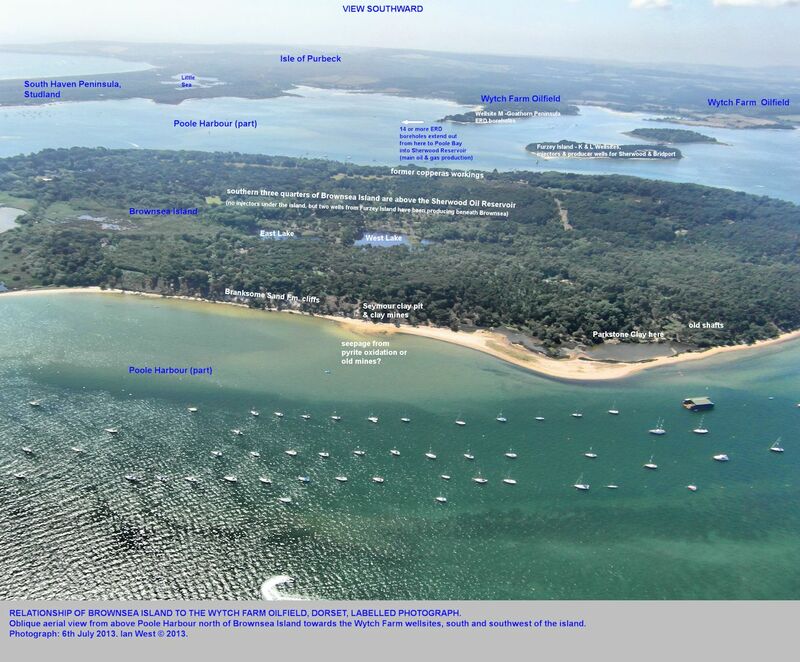 Poole Harbour, unlike the much smaller Christchurch Harbour, has water that is effectively seawater in composition. The harbour is very large and has major tidal inflow an outflow. Probably the effect on the harbour is very small. Water injection wells into the Sherwood Sandstone are on a larger scale and many are longer, extended reach wells. The original concept (BP 1992) was to inject water around the edge of the Sherwood Reservoir (and similarly with the Bridport Reservoir) and thus to drive oil inwards towards the producing wells. For example Wellsite G, although just west of the original limit of the Sherwood Reservoir, had a single Sherwood water-injection well. "water can be injected directly below the oil bearing reservoir to give efficient recovery"
The details of this type of water-injection are not known. It may, however, be unexpected that at Wytch Farm water could be driven into a rock beneath the Sherwood Reservoir. The reservoir may not extend to the base of the Sherwood Sandstone. Beneath the Sherwood though it is the impermeable Aylesbeare Mudstone Group. Was the water-injection into the lower part of the Sherwood Sandstone or into the generally impermeable Aylesbeare Mudstone? Was the permeability sufficient to do this without difficuly in a stratum beneath the porous and permeable reservoir or was hydraulically fracturing needed? (The Aylesbeare Mudstone can be seen at the surface at Budleigh Salterton, where it well-known for containing radioactive nodules). The notes above are only based on old and outdated information brochures and it is not known as to what is the standard procedure at present and it might be quite different. In any case the oilfield is now under Perenco UK and no longer under BP Exploration. It is therefore not necessarily implied that this is happening now. 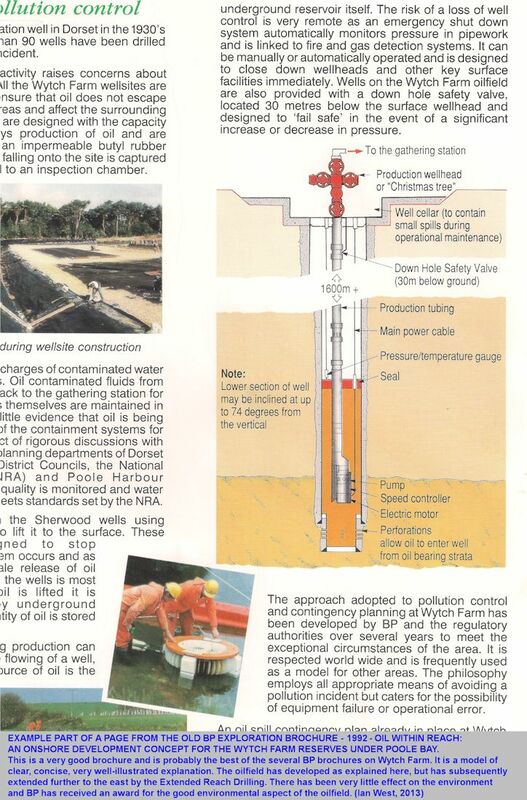 BP have explained how the oil is pumped from the Wytch Farm field in their excellent brochure of 1992b. There are submerged electrical pumps. 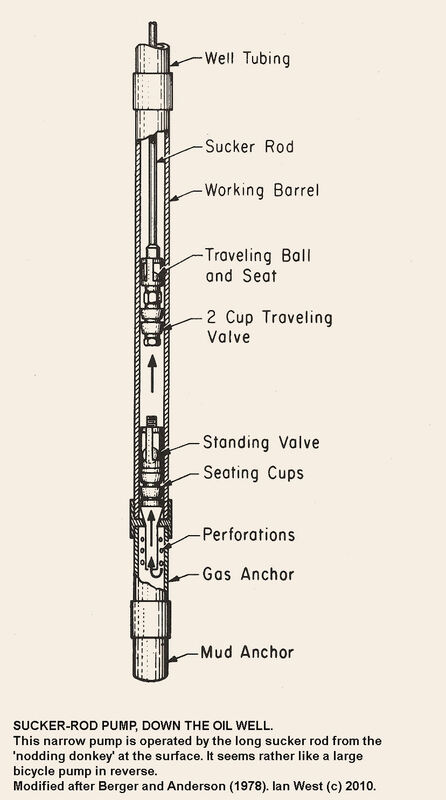 The diagram shows a pump in a vertical well, but similar pumps are used in the several Extended Reach Drilling, horizontal wells beneath Poole Bay. It is not surprising that NORM, Naturally Occurring Radioactive Material is present within the produced fluids, the oil and water of the Wytch Farm Oilfield. This happens in many oilfields, as in the North Sea. In any sample of oil, water or rock the quantity of radioactivity may be very small. However, because large quantities of fluid pass through the pumps and pipes and they can concentrate certain substances which are present in very low proportions in the fluids. This topic has been much discussed in relation to North Sea drilling rigs. The report of Sniffer (2004) provides much detail regarding the topic and is available online. It discusses the disposal of these oilfield radioactive wastes. 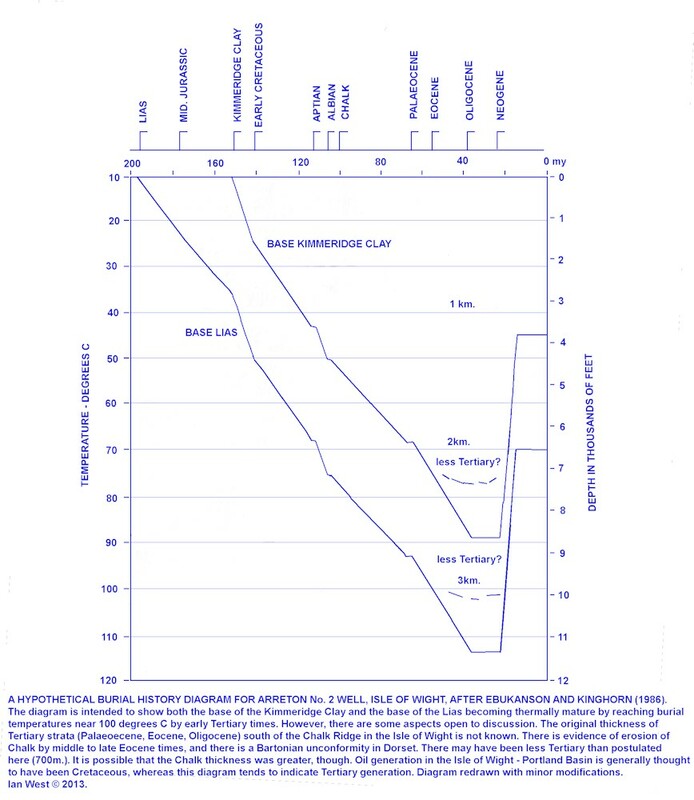 For more information see also the website: NORM Scale: Source of Emissions for further understanding of NORM and the development of radioactive scales on equipment. Reference is made to the Radioactive Substances Act 1993. NORM is mainly a technical problem for engineers within the oil industry. The NORM at the Wytch Farm Oilfield is in the Triassic Sherwood Sandstone Reservoir and not in the Bridport Reservoir. It is unusual (Worden et al. 2000). It consists of thin metallic coating of 210Pb (lead 210, part of the uranium 238 radioactive decay series) and of 210Po (polonium 210 which decays rapidly to lead 206). There is very little radium in the metallic scale. The lack of radium is explained by the fact that the brines have very high sulphate, and thus radium will precipitate out with barite as radium sulphate before it reaches the oil wells. However, undersaturation of the reservoir brines for lead sulphide, means that lead can remain in solution. Thus the 210Pb (lead 210) can be carried in solution into the downhole pumps and processing pipes. (Worden et al. 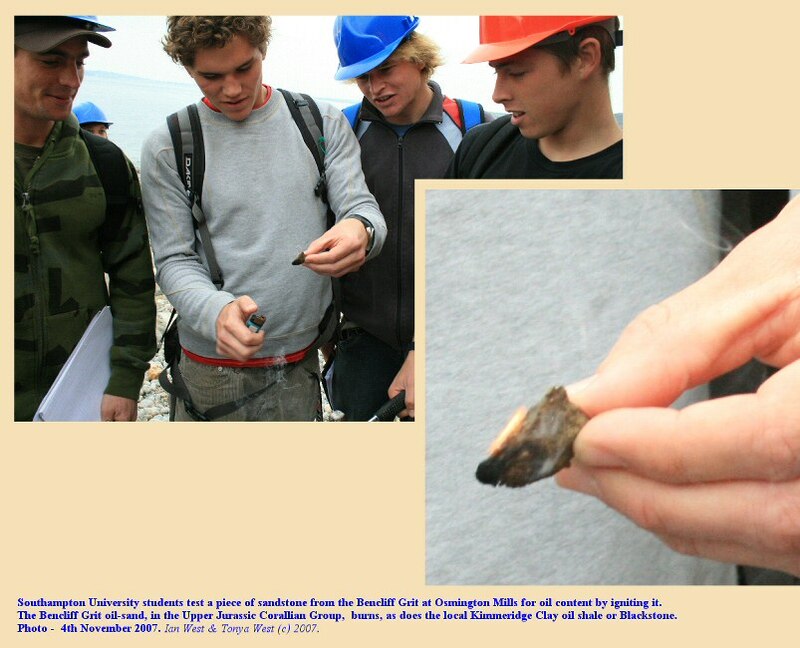 2000) reported the occurrence of some local high radioactivity of thousands of becquerels. However, according to Sniffer (2004) because lead 210 is weak gamma emitter and polonium 210 is an alpha emitter and these sources of radiation would not be detected outside a steel vessel wall with standard NORM monitoring equipment. Thus it would seem that the radioactivity is confined within steel boreholes, pumps and pipes is not exposed. It is, thus, not generally any hazard to the public because it is shielded in pipes and in most cases it is also deep underground in distant, extended-reach boreholes. Nevertheless it is an expensive matter for the oil industry which has to deal with it by removing components and decontaminating them elsewhere. Decontamination work would have to take place during the final stage of the oil the tear-down (dismantling). Wytch Farm radiation probably has a special explanation associated with the Permo-Triassic red-bed facies. It is of significance that the Sherwood Sandstone lies above the Aylesbeare Mudstone [see note above about water-injection beneath the Sherwood Reservoir] which has the well-known uranium-thorium nodules at Littleham Cove near Budleigh Salterton. 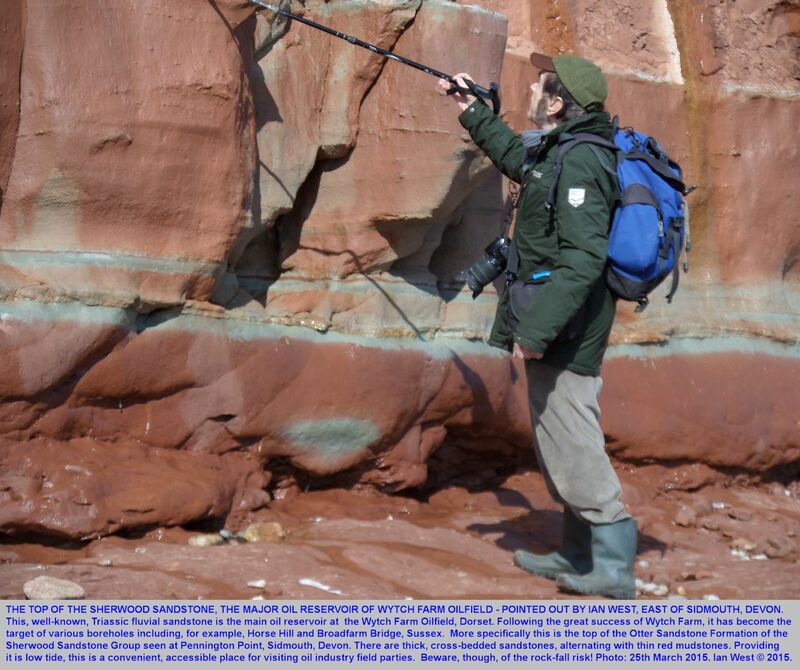 It is not known whether any such nodules occur in the area of the Wytch Farm Sherwood Sandstone reservoir. However, the Sherwood Sandstone is in part playa origin, like the Aylesbeare Mudstone. The conditions were broadly similar at times and the sediments are mostly reddish and oxidised. Worden et al. (2000) pointed out that uranium may have been sourced from weathered material from the Hercynian granites (e.g. Dartmoor Granite), mobilised by oxidation and groundwater flow and then precipitated where oxidised U-bearing fluids met deeper reduced water (Durrance, 1984). There are variations on this theory involving local reduction, but the presence of granites and oxidised water are key factors. An arid environment, proximity to playa lakes and a regional aquifer able to import uranium are also important. The similarity in source to the radioactive nodules of Devon seems almost certain, but the details are not necessarily understood. For further details on the radioactivity of the Sherwood Reservoir at Wytch Farm read the paper by (Worden et al. 2000). It is available online. The diagram above is just a simple cartoon for educational purposes, and does not show the numerous faults or other details. See accurate and technical cross-sections for details. The key work on this subject is the impressive seismic study of Underhill and Paterson (1998) - Genesis of tectonic inversion structures: seismic evidence for the development of key structures along the Purbeck - Isle of Wight Disturbance, Journal of the Geological Society, London, vol. 155. This paper provides various accurate sections through the Purbeck Disturbance, and is essential reading. This new evidence is consistent with the better of the older views, but eliminates some unsatisfactory hypotheses. The many diagrams cannot be reproduced here, so the paper must be obtained by anyone studying the area seriously. See also the related work of Underhill and Stoneley (1998). Underhill and Paterson Paper - Lyell Collection, Geological Society of London. OIL LEAK (of 2010 to 2011). A small oil leak was reported from a pipeline at Wytch Farm on the 27th January. See Rowena Masson - BP shuts UK Field after Oil Leak, The Telegraph Newspaper. See also other newspaper reports of this date, including that of Durkin (2011) in the Bournemouth Daily Echo. The oil field was closed down for two months. The Dorset leak occurred just before warnings from the Health and Safety Executive about corrosion risk in the oil industry, specifically in relation to North Sea Oil platforms. A BP spokesman reported that a small amount of oil from a pipeline, encased in concrete and sand, had risen to the surface. The section of pipeline has been replaced and all key pipelines were being inspected, with the aid of robots. The leak was reported to have occurred at one of the wellsites, but it is not known which one. Dr. Susie Baverstock, Wytch Farm's communications and land management leader, assured the (Bournemouth) Daily Echo newspaper that the leak was small and there was no contamination to the surrounding water or countryside. It was contained and dealt with very promptly. No oil left the site whatsoever. It would seem that a small oil leak, that caused no contamination or environmental problem, resulted in the safeguard of substantial checking and maintenance work that shut down the oilfield for two months. It does not seem to have been a major threat to the environment and the oilfield is probably all the safer now because of the maintenance work. OIL LEAK of 2010 to 2011 - Further Notes. It is not know where oil leak occurred. Was it at an oil well such as the Goathorn Extended Reach Drilling Site or was it in the vicinity of the Gathering Station? The reports state that the pipeline was encased in concrete and sand. A small amount of oil had risen to the surface of the sand. Thus it seems to have been a near-surface event. The report reference and some details are given in the Petroleum South of England, Bibliography: DECC (2009). There was an Extended Reach Borehole from Wellsite M, in 2000, to a prospect to the east of Old Harry and Harry Rocks, between Studland and Swanage (near Ballard Down and Ballard Point). It seems not to have been successful in economic terms but is of interest in showing some structural and stratigraphic features beneath the sea floor east of Harry Rocks. The well was drilled by the Operator of Wytch Farm at the time, BP (since sold by BP to Perenco UK). The objective was a prospect of limited size in the the northern, downthrow side of the Purbeck faulted Monocline or Purbeck - Isle of Wight Disturbance. In relation to the cliff section, it was effectively north of the Ballard Down Fault. A brief technical report is available as a pdf file on the internet: DECC, Department of Energy and Climate Change, Government of UK. Relinquishment Document of DECC, Government of UK, Licence Block P1022 (Block 98/11). The general comments here are based on this report, but written in non-technical language. The illustration above is based on, with modification, on part only of the map: Fig. 4, Map displaying Block 98/11 Discoveries, Leads and Prospects. The well, entering obliquely from the direction of Goathorn Peninsula, drilled through 60 metres, vertical thickness, of Sherwood Sandstone. This is he lower and major reservoir of the Wytch Farm Oilfield. It entered the Triassic sandstone from a subsea depth of 1738 metres, that is quite deep, deeper than at Wytch Farm. The highest 9 metres of the Sherwood Sandstone was shaley, not suprising since it is just beneath the argillaceous Mercia Mudstone. A good porous sand was encountered not far down in the sandstone at 1748-1754 metres depth. There may be gas or oil, but there no oil shows were found. Because of a technical point with the seismic interpretation, the borehole seems not to have entered the Sherwood Sandstone at the level intended. This problem arose because the seismic velocity in the Chalk in the Harry Rocks area was higher than expected. Perhaps this was because of the hard, well-cemented Chalk, known to be present beneath the Ballard Down Fault, but I do not know the details. The result of this problem is the top of the Sherwood Sandstone proved to be 40 metres deeper than expected. Presumably the borehole was not, therefore, in the best and intended position. With regard to reservoir potential, the Sherwood Sandstone did not have the good fluvial (river) channel sands, as are present at Wytch Farm. These have particularly good porosity and permeability features. The authors of the report thought that the area is off the main Sherwood sand channel axis. Thus the well was plugged and abandoned. With regard to details, there was a good quality, 6 metre, hydrocarbon-bearing sand at the top of Zone 30, the top production zone of the Sherwood Sandstone at Wytch Farm. Below this there are a series of thin, individual hydrocarbon-bearing sands. This sequence, with natural gas, extends to the total depth of the borehole. This depth was at 44 metres below the mapped spill point, the theoretical base of the oil. The thin sand bodies are probably individually stratigraphically trapped or effectively closed off. However, if they are linked together and part of a connected reservoir body there is a question of how the structure would be sealed (from leakage of oil). A linkage or connection of faults would apparently be needed to seal the structure down to at least 1800 metres subsea. This is below the oil-water level in Licence Block 98/11-1 to the east. Watts, G. 2000. 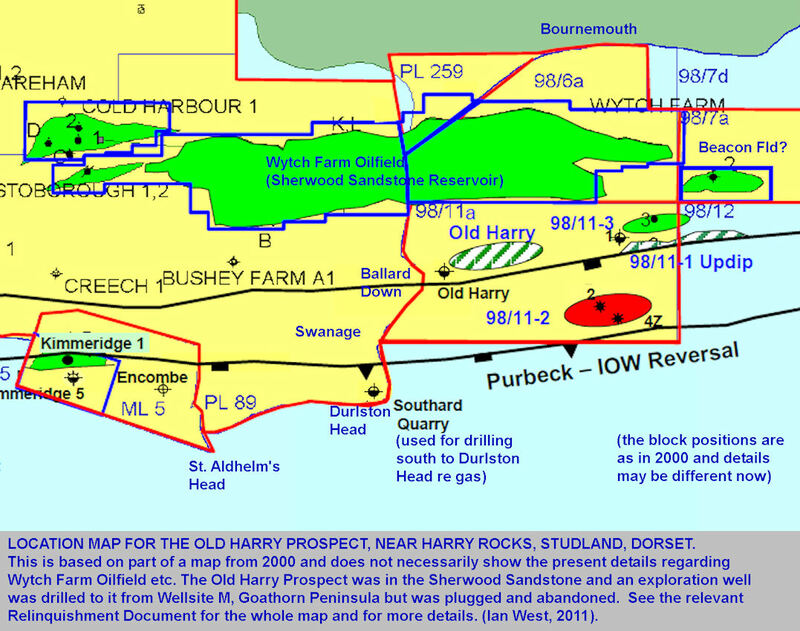 Old Harry Review: Review of results from Exploration Well L98/06-M18 and L98/06-M18Z in 98/11. By Giles Watts, June 2000. Internal Report of BP? 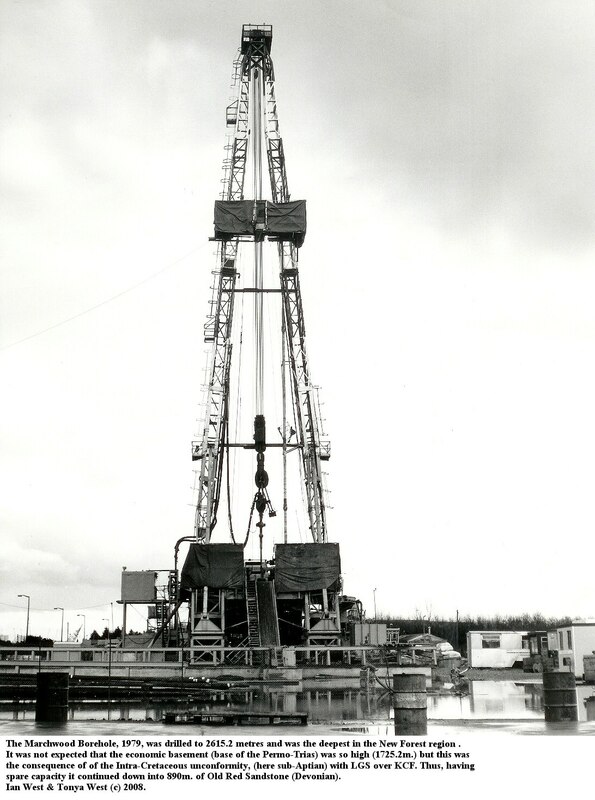 In 1964 Wareham was drilled, following the Kimmeridge No.1 discovery in 1959. This Wareham well produced 23 barrels per day of oil (with much water) from thin, 4.9 metres, of Inferior Oolite and the top 2.9 metres of Bridport Sands. Wareham No.2 produced oil at a rate of approximately 14.5 brl per day from the Cornbrash after fracturing and acidizing. It was later abandoned (Colter and Havard, 1981). Thus initial production from the Wareham Field was very poor. 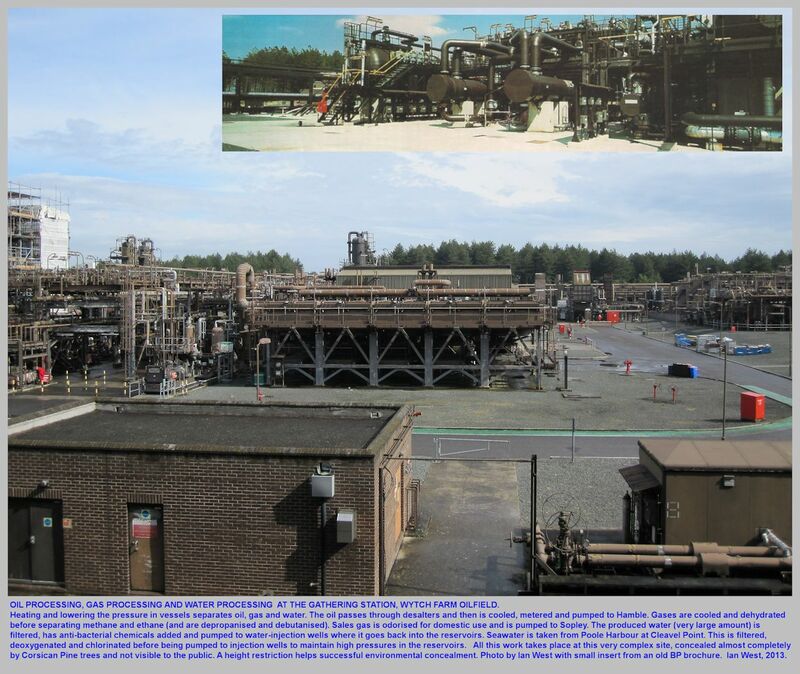 Later, however, in 1991, BP brought the Wareham Oil Field into production and it became very successful. It currently produces about 300-400 barrels of oil a day. The reservoir now in use is the Bridport Sand and there are reserves of about six million barrels. It is not connected to the Wytch Farm oil field. 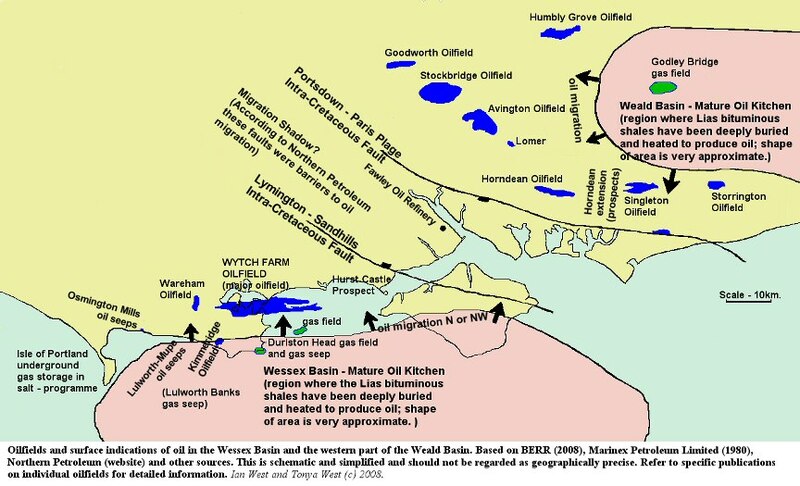 There are two wellsites (WC and WD) are located to the west of Wareham at Worget. WC has 5 producing wells and 2 water-injection wells; WD has 2 producers and 2 water-injectors (information from a BP webpage). The oil export pipeline from the Gathering Station in the Isle of Purbeck to the BP marine terminal at Hamble on the east bank of Southampton Water was laid down in 1988. It is 400 mm diameter and 90 kilometres long. From the Gathering Station it swings round to the west of Wareham and then goes north of Wimborne Minster. From there it proceeds southeast to Sopley (near Christchurch). Up to this point there is a parallel methane gas pipeline but this terminates at an installation at Sopley (where the gas joints the national gas supply grid). The oil pipeline then continues eastward in the southern part of the New Forest or just south of the New Forest. It does not cross the open heathland. It crosses the Beaulieu River estuary south of Exbury and then heads for Fawley. However, it does not terminate in the Fawley Oil Refinery but proceeds beneath Southampton Water to the BP Hamble Terminal. Maps of the pipeline are available in BP publications. The pipeline is buried and would difficult to find at the surface. There are four valve stations along the pipeline and automatic processes that will shut down the flow in case of a sudden drop of pressure (safety measures against leaks). 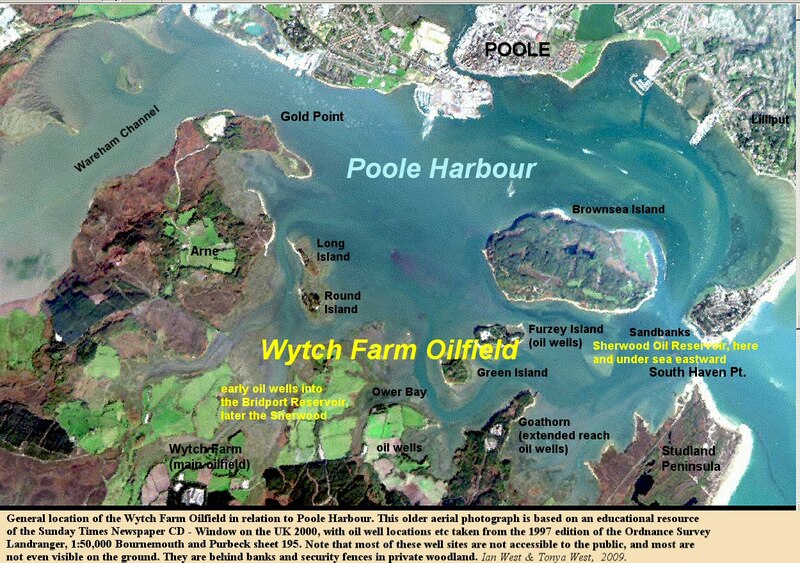 The oil takes 25 hours to travel from Wytch Farm to the Hamble Terminal. LPG is separated at the Gathering Station and is transported by rail. "BP has agreed to sell its interests in the Wytch Farm, Wareham, Beacon and Kimmeridge fields to Perenco UK for up to $610m in cash. The price includes $55m contingent on Perenco's future development of the Beacon field and on oil prices in 2011-13. The sale of these interests is part of BP's plan, announced in July 2010, to divest up to $30 billion of assets by the end of 2011. Before today's agreement, BP had already announced sales agreements totalling around $25 billion." "Energy giant BP has announced the sale of its Wytch Farm oilfield in a deal worth a staggering $610 million. The Purbeck plant, the largest onshore oilfield in Western Europe, has been sold to Perenco UK Ltd, the British arm of an Anglo-French independent oil and gas company with interests in 16 countries. It is expected that all employees based at the Wytch Farm plant will continue to work for the new company. An immediate $500m payment has already been made, with a further $55m to be paid on completion, expected at the end of 2011. The remaining $55m is contingent on submission of Perenco�s future development of the Beacon field and on oil prices in 2011-13." "Wytch Farm, which is sited in one of the most environmentally-sensitive areas of the UK, produces around 15,000 barrels of oil a day. However, at its peak production was closer to 110,000 barrels." Poxwell Anticline a potential oil field that failed. In the late 1930s the importance to the country of making major oil discoveries on the south coast of England was obvious. Second World War ships ran on oil in accordance with Winston Churchill's policy. the D'Arcy Exploration Company was very successful in Iran (Persia) and was leading to the development of the British Persian (BP) Oil Company or Anglo-Iranian Oil Company. However, almost all oil was imported to Llandarcy in South Wales (partly named after the D'Arcy Exploration Co, but with a Welsh-sounding prefix). The famous anticlines in the Iranian fold belt are long and narrow and closed at both ends and in Tertiary and Cretaceous strata. They are usually faulted. 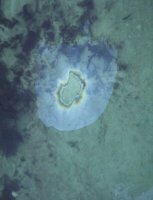 In the 1930s D'Arcy Exploration Company geologists on leave in Dorset found an oil seep in the Corallian (Bencliff Grit) east of Osmington Mills. This is now very well-known to any student passing, but it was an exciting discovery then. They quickly realised that just inland from Osmington Mills is a small closed and narrow anticline, the Poxwell Pericline, and it is faulted. It looks rather like a small model of the Majid y Sulieman anticline, the most famous of the Iranian oil-bearing structures. However, the Poxwell Pericline was a failure. 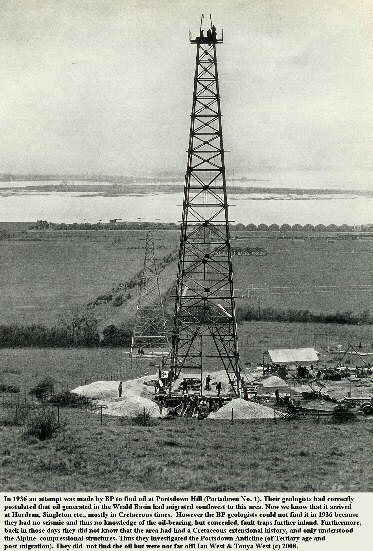 It produced no oil (the Portsdown Antcline, drilled in 1936 was also a failure). Thus Weymouth or Portland Harbour did not receive an oil refinery and major oil port. For more details and a summary of the borehole log, please go to: Poxwell Quarry webpage. One of the first boreholes for oil in the region, Portsdown No. 1 in 1936 was located at what was thought to be a very promising locality. However the well was dry. It was on the Portsdown Anticline between the Wessex Basin and the Weald Basin. It was thought at the time that oil was likely to be trapped in Tertiary anticlines (as in Iran) but in fact most of the recent oil discoveries have been in fault traps beneath the sub-Albian or sub-Aptian unconformity. 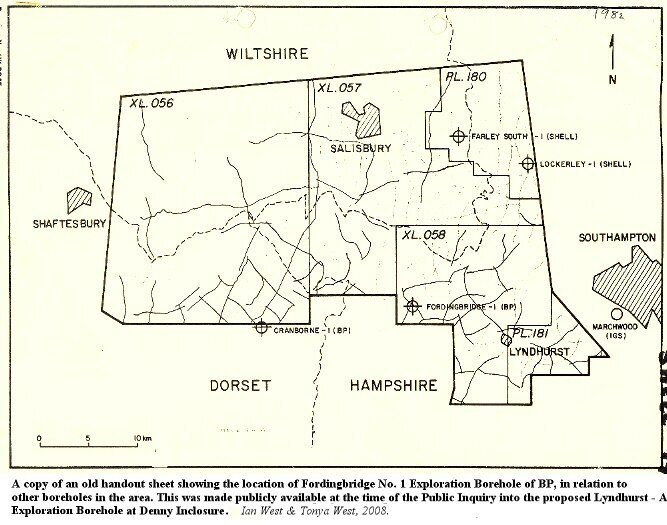 An exploratory borehole for oil, Fordingbridge No.1, was put down by BP (The British Petroleum Company Limiited) at the western end of Hasley Hill (map reference near SU192118), near Ogdens, in 1959. The location is at 229 feet or 69.7 metres above OD. It was a major borehole, especially for that time, extending down to 1368 metres, and penetrating the Mercia Mudstone. There must have been a large drilling rig on Hasley Hill. Fordingbridge No.1 is the only borehole for petroleum exploration within the New Forest and was drilled at a time when planning and environmental regulations were less strict. However, there was an application for a borehole at Denny Lodge by Shell in 1982. That application was rejected. 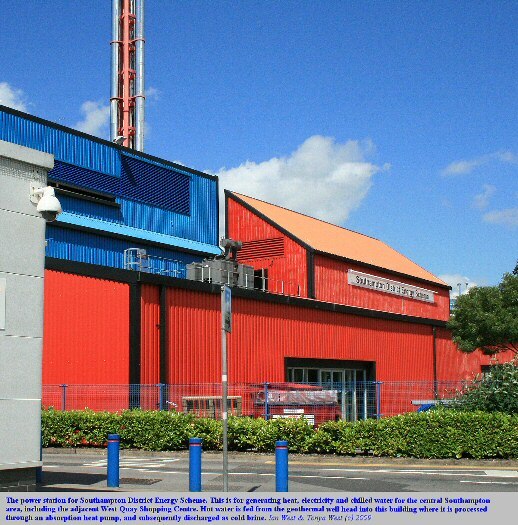 An important deep borehole for geothermal exploration at Marchwood was drilled at the former Marchwood Power Station. This also provided useful information to the oil industry. There follows an extract from Falcon and Kent (1960), pp. 48-49, giving summary information on the well at Hasley Hill. Norman Leslie Falcon was the Chief Geologist of BP. and Dr. Percy Edward Kent (well-known as Peter Kent, F.R.S. ), Geological Advisor of BP Exploration (Canada). The section of Fordingbridge No 1, drilled on a gravity and seismic high at Ogdens (Hasley Hill), near Fordingbridge, is still being worked out, but the following brief account may be given. Drilling began in the Tertiary beds of the Hampshire basin; the Chalk was reached at 678 feet and. 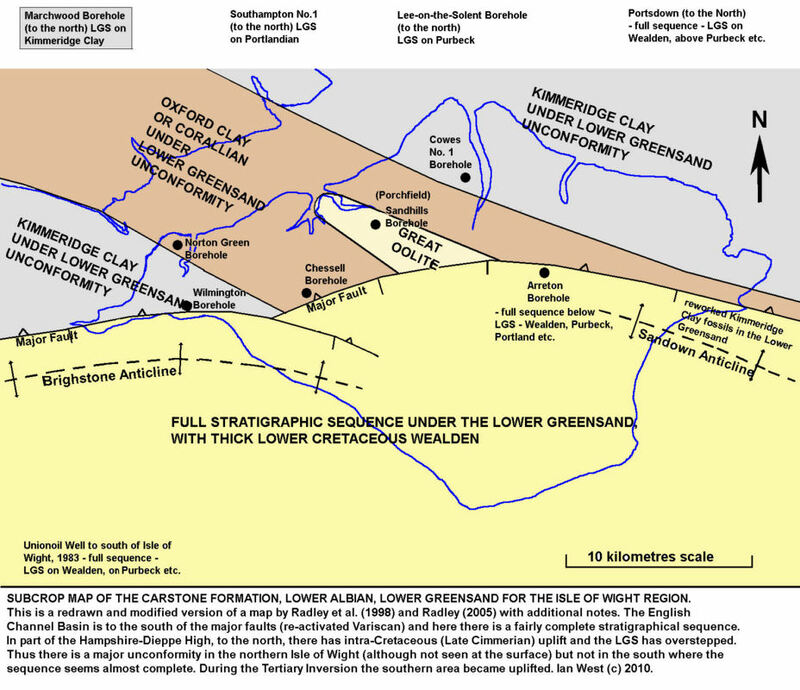 the Upper Greensand and Gault penetrated from 1997 to 2251 feet. Beneath the Gault the well passed directly into Kimmeridge Clay, shown by a core 20 feet below the top to be Lower Kimmeridge (with Aulacostephanus, etc.). Only 210 feet of Kimmeridge Clay remained beneath the Gault. The unconformity eliminates the Lower Greensand, Wealden, Purbeck, Portland and Upper Kimmeridge, measuring approximately 4000 feet in eastern Dorset (the nearest outcrops) and some 2700 feet at Portsdown on the other side of the same Tertiary basin. This represents a very considerable pre-Albian uplift. Beneath the Kimmeridge the boring proved a normal sequence of Corallian (about 170 feet), Oxford Clay (about 430 feet), Cornbrash (35 feet) and Great Oolite Series (404 feet). The last-named was mainly limestone, with only a minor development of argillaceous beds which could be ascribed to the Fuller's Earth, in marked contrast to recent borings nearer the Dorset coast (see the account of the Radipole borings). Below, 118 feet of sandy and ferruginous limestones and ironstones are ascribed to the Inferior Oolite, and beneath this the well proved an Upper Lias development of Bridport Sands type, 250 feet thick. The remainder of the Lias was normal, except that the Middle and Lower subdivisions totalled only about 450 feet and rested upon 60 feet of beds ascribed on fossil evidence to the Rhaetic. The well was completed at 4487 feet, 106 feet into the Keuper [Mercia Mudstone]." Rotary Table (?) - 229ft. - 69.8m. ht. above O.D. Base of Tertiary and top of Chalk - 678ft. - 206.7m. depth. Base of Chalk and top of UGS - 1997ft. - 608.6m. depth. Unconformity - 2251ft. - 686m. depth. Base of KC and top of Corallian - 2461ft. - 750m depth. depth. Base of Corallian and top of Oxford Clay - 2631ft. - 801.9m. depth. Base of Oxford Clay and top of Cornbrash - 3061ft. - -932.9m. depth. Base of Cornbrash and top of Great Oolite - 3096ft. - 943.7m. depth. Base of Great Oolite and top of Inferior Oolite - 3500ft. - 1066.8m. depth. Base of Inferior Oolite and top of Bridport Sands 3618ft - 1102m. depth. 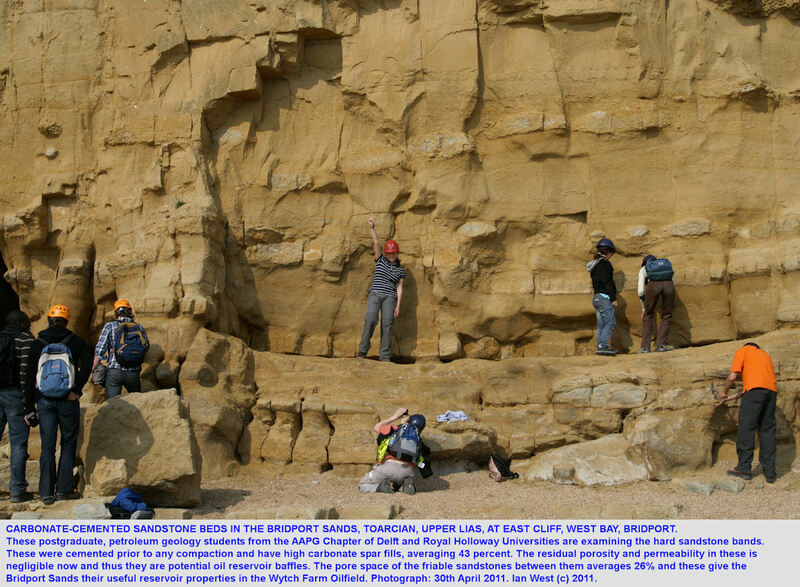 Base of Bridport Sands and top of Liassic Clays - 3868ft. - 1179m. depth. Base of Middle & Lower Liassic Clays and top of Penarth Group (Rhaetic) - 4318ft. - 1316m. depth. Base of Penarth Group and top of Mercia Mudstone (Keuper) - 4378ft. - 1334.4m. depth. TD = actual - 4487ft - 1367.6m. (4438ft. - 1352.7m. - calculated on above figures). The Marchwood No. 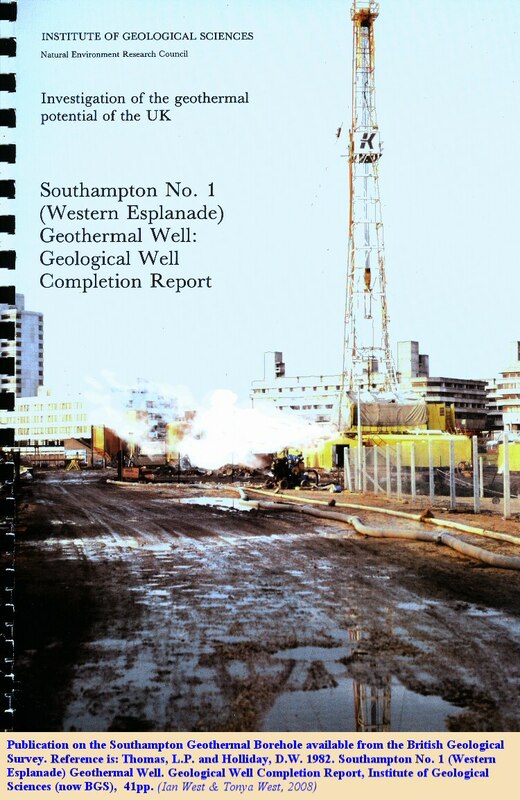 1 Geothermal Borehole was commenced on the 8th November 1979 and completed on the 27th February 1980. It preceded the other geothermal well of the area, which was Southampton No.1 Borehole. That was started on the 26th September 1981, and the well head is located in central Southampton north of the West Quay centre and is in now in the car park of the children toy store - Toys-R-Us. 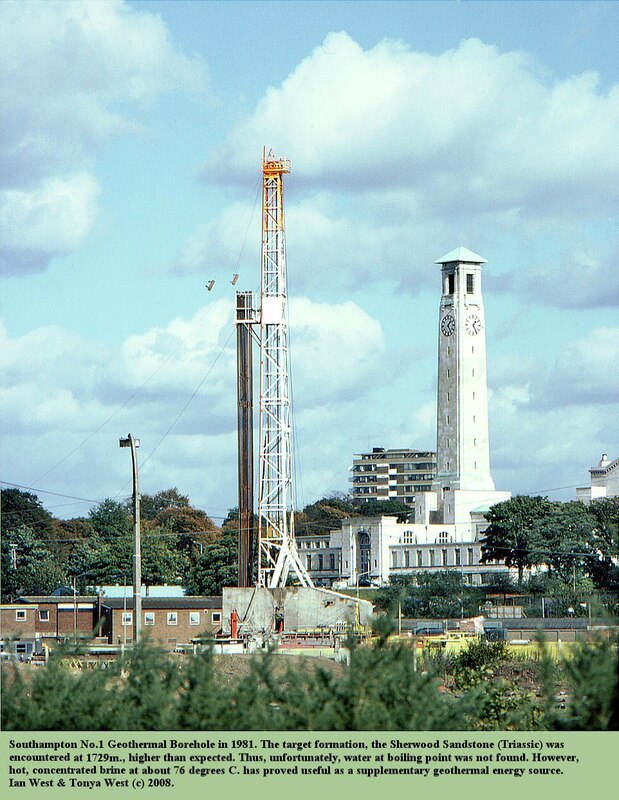 Thus the Marchwood well was the first geothermal experiment in the region and a drilling rig was put in place so as to be capable of drilling to the Total Depth (T.D.) of 8580 feet (2615m.). The Marchwood and Southampton area is part of a region of high heat flow through the underlying strata. At Southampton the rate is 59 milliwatts per square metre compared to 40mW/m 2 for more northerly parts of Hampshire (Edwards and Freshney (1987). This is almost a 50% increase, and seemed worth exploiting. I was at the Geology Department of Southampton University at the time and followed, to some extent, the progress of both wells. 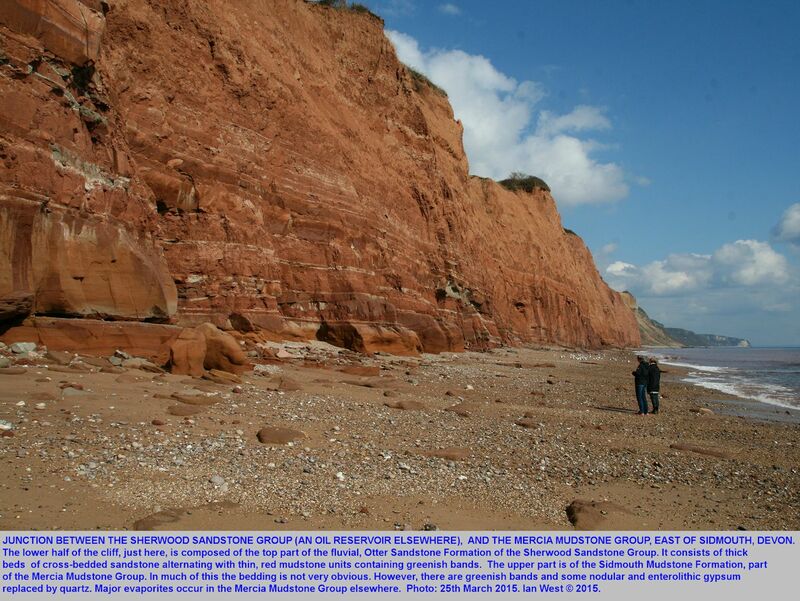 The initial hope was that the Sherwood Sandstone reservoir, a porous red, Triassic sandstone exposed in the Sidmouth to Budleigh Salterton area, would contain hot water at about 100 degrees Centigrade. The usual geothermal gradient is about 30 degrees per kilometre, so that without considering the details, a temperature like this would be expected at round about 3 kilometres. Thus, if the Sherwood Sandstone had been near the total depth of the well, about 2600m, water with a temperature near that of boiling water might have been obtained, and this could have been useful. It was intended to use the heat produced to supplement the energy supply for the Marchwood, coal-fired Power Station, to which the well was adjacent. However, the Marchwood Borehole, did not produce hot water at this temperature. We shall consider, below, why the temperature was lower than expected. A further complication was that a year or so after the drilling, and for other reasons, the Marchwood Power Station was demolished. Thus, there was no real use nearby for the warm water. However, in spite of the lack of commercial success with regard to geothermal energy, the borehole was certainly a successful research venture. 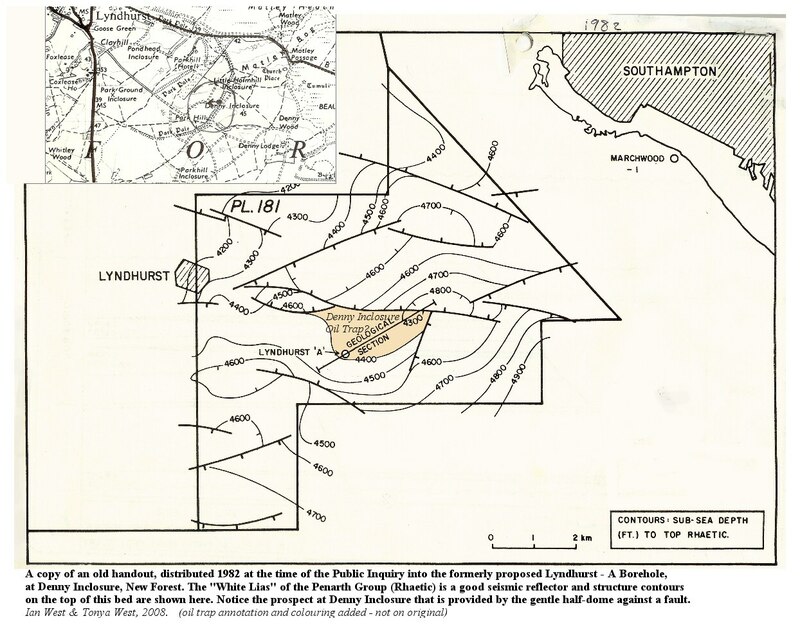 It provided much information on potential oil reservoirs in the area, and particularly helped the understanding of the Bridport Sands, the Upper Reservoir of the Wytch Farm Oil Field. The Sherwood Sandstone of the Trias was the selected target for hot water. This is because it was the deepest formation in the area that was expected to be sufficiently porous and permeable. This was proved to be the case. An older sandstone, the Devonian Old Red Sandstone lies lower in the borehole sequence, but it is tight, that is, non-porous and non-permeable from a practical point of view. The Sherwood Sandstone can transmit water from a considerable distance and is recharged up-dip in Devon. It should be appreciated, though, that the water is saturated brine. This is because the Trias contains substantial salt deposits in places and some evaporites were proven in the Marchwood Borehole. Even if hot water is pumped from a well it cannot be used directly but has to be directed through stainless steel heat exchangers with the aid of downhole, stainless steel pumps. The brine may also contain heavy metals in solution, and has to be discharged somewhere. The ideal is to have two adjacent boreholes, a production borehole for producing hot water and an injection borehole for disposing of used brine. There was no second borehole at Marchwood. 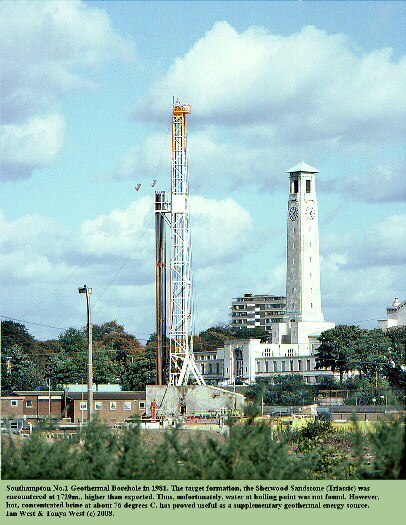 At Southampton Geothermal Well there is only one borehole but the used brine and any associated trace element content is discharged into Southampton Water (already a polluted estuary). Thus the matter is not necessarily simple. 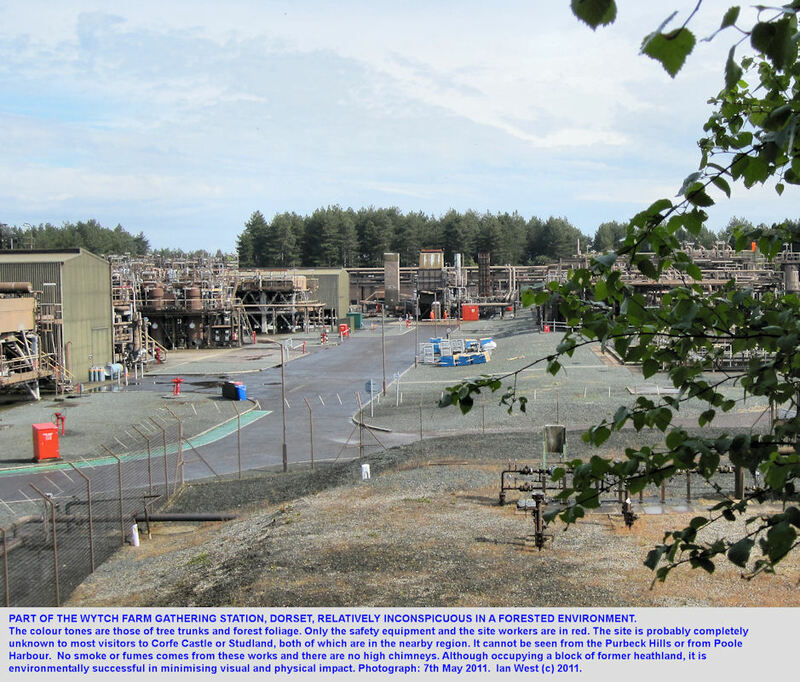 Note that the Sherwood Sandstone Reservoir in the Wytch Farm oilfield contains very saline water with NORM, naturally occurring radioactive material. See the section of this webpage on Sherwood Sandstone NORM at Wytch Farm. There is not necessarily a likelyhood that NORM is present so far to the east of the Wytch Farm oilfield, and, in any case, the pumping at Southampton is on a much smaller scale than at Wytch Farm. For technical information on the monitoring and modelling of the Southampton reservoir see the four BGS reports by Barker et al. (1988; 1989a; 1989b and 1991, final report). These may not be easily obtained, but copies are present in Southampton University, Hartley Library, Cope Collection. The British Government department, BERR, have commented that the geothermal aquifer resource within the Wessex Basin, under the Bournemouth area, appears to be the most attractive for possible future exploitation, but the commercial risks of speculative drilling remain high. At 3.5p/kWh or more, the cost of heat from the aquifer resource is still significantly higher than that from conventional industrial boilers (approximately 1.44p/kWh). See also Rollin, for more information on low temperature geothermal energy in the UK, including the Wessex Basin. Returning to specific matters regarding the Marchwood No. 1 borehole, there was, as mentioned above, a problem regarding depth of the geothermal aquifer. The part of interest is the succession from the Lower Greensand downward. It is well-known that there is usually, in this region, a Pre-Albian unconformity at the base of the Gault, and the Basal Gault Pebble Bed is an indication of this. At the base of the Gault in the Marchwood Borehole (depth - 2240ft. - 682.8m.) , the pebble bed does not seem to have been identified (there was coring in the Gault but without recovery). 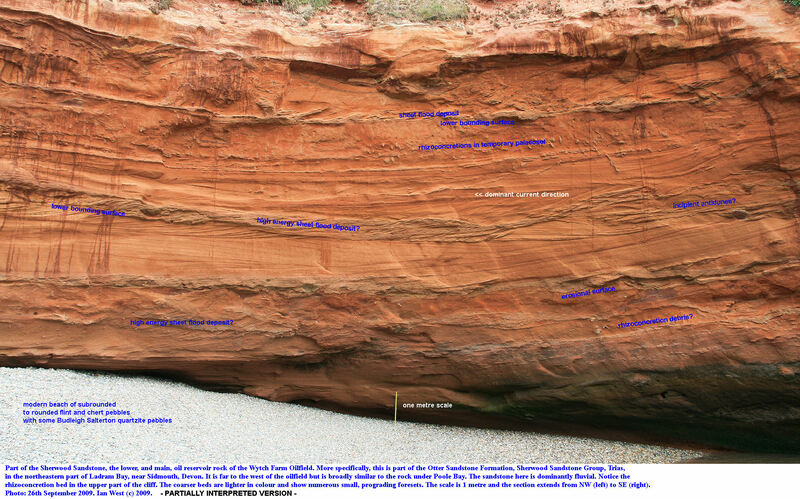 Under the Gault is a very thin sequence of Lower Greensand. It is from 2240ft. to 2267ft.,only 27ft. or 8.2m (compare to the southwestern Isle of Wight where it is, at Atherfield, about 800ft. or 243m.). 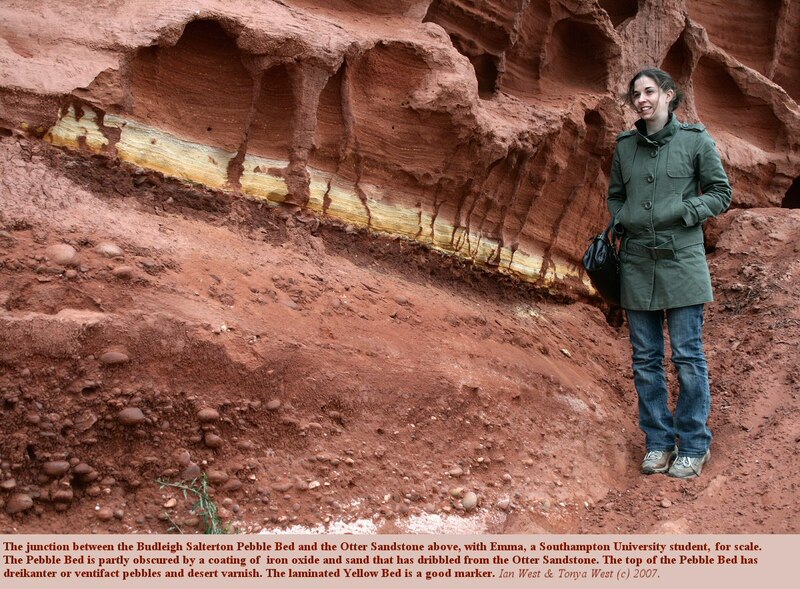 There is an unconformity, as is common, at the base of the Lower Greensand. It is lying directly on top of Kimmeridge Clay. The Wealden, which can reach more than 600m in the subsurface, is missing. So too is the Purbeck Formation which reaches about 120m. in Durlston Bay. The Portland Stone and Portland Sand is missing. These units can reach about 70m in total thickness. Thus if about the greatest thicknesses could have present, then the Sherwood Sandstone would have been about 790m. lower, although this would have been the extreme. If you add this to the base of the Sherwood Sandstone in Marchwood No. 1 then you obtain 2515m, just a little less than the total depth of the well. Of course the unconformity present means that some of the Kimmeridge Clay is probably missing, and in any case, the Lower Greensand is abnormally thin. 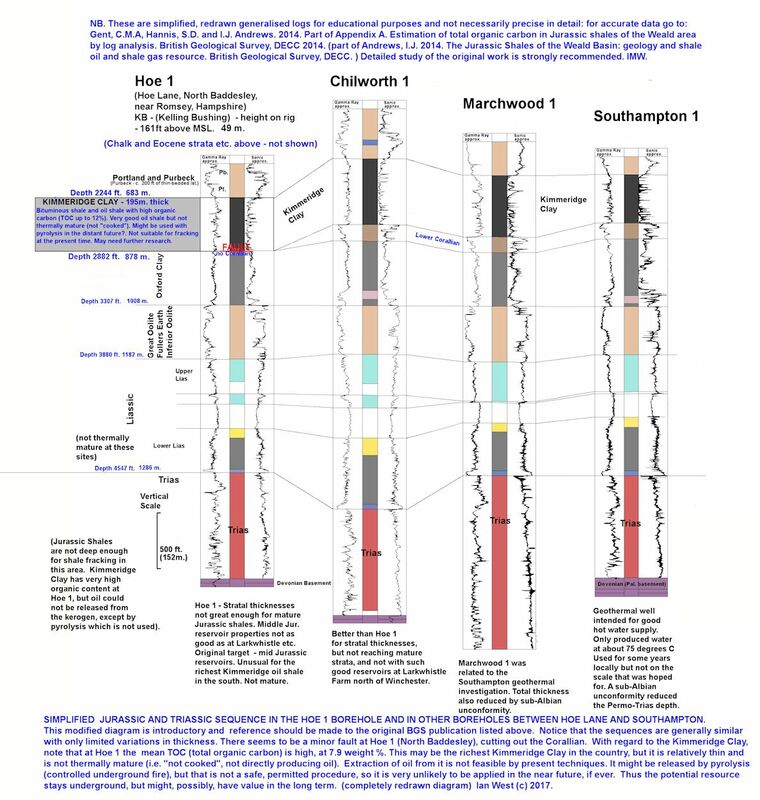 A large drilling rig, shown above, was chosen and the plan for drilling the Marchwood Geothermal Borehole was appropriate to deal, if necessary, with a thick Jurassic-Cretaceous sequence including Wealden, Purbeck and Portland. This was a sensible plan, and a reasonably thick sequence was expected so that the Sherwood Sandstone would prove to be deep and hot. It was therefore a disappointment when the unconformity at the base of the LGS was discovered. It was thus possible to use the spare capacity of the drilling rig to penetrate the Devonian and to gain an understanding of the strata below the economic basement (i.e. below the base of the Permo-Trias). So that is why so much Devonian has been drilled. Southampton No.1 (Western Esplanade) Geothermal Well, 1981. Drilling Contractor: Kenting Drilling Services Ltd.
26 inch to 165 ft.
17.5 inch to 3005 ft.
12.5 inch to 5994 ft.
20 inch casing to 158 ft.
13 and 3/8 inch casing to 2995 ft.
9 and 5/8 inch liner was hung from 2826 ft. to 5635 ft.
Cores - six cores were taken with total core length of 226 ft. See Thomas and Holliday (1982) for further details of coring. 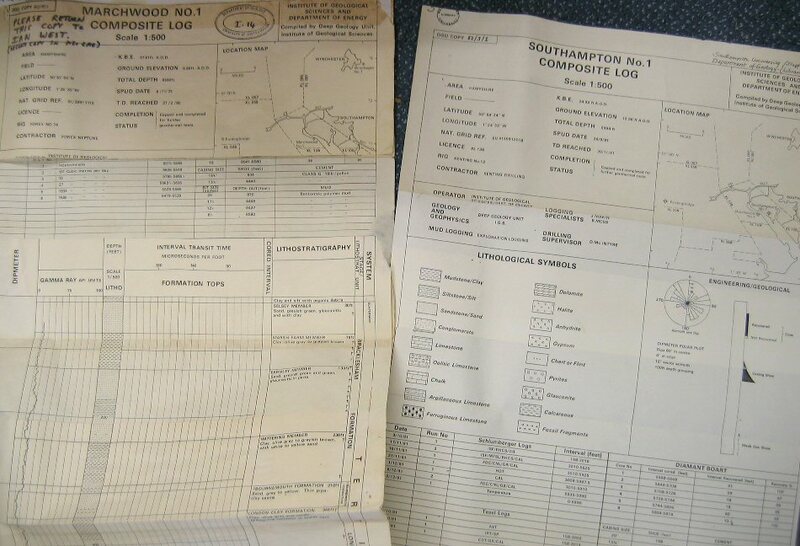 Wireline logging: Schlumberger Inland Services Inc., Tessel Well Services Ltd.
Mud Logging: Exploration Logging (UK) Ltd.
Drilling Superintendent: Mr. D. McIntyre, Drilcon Ltd. 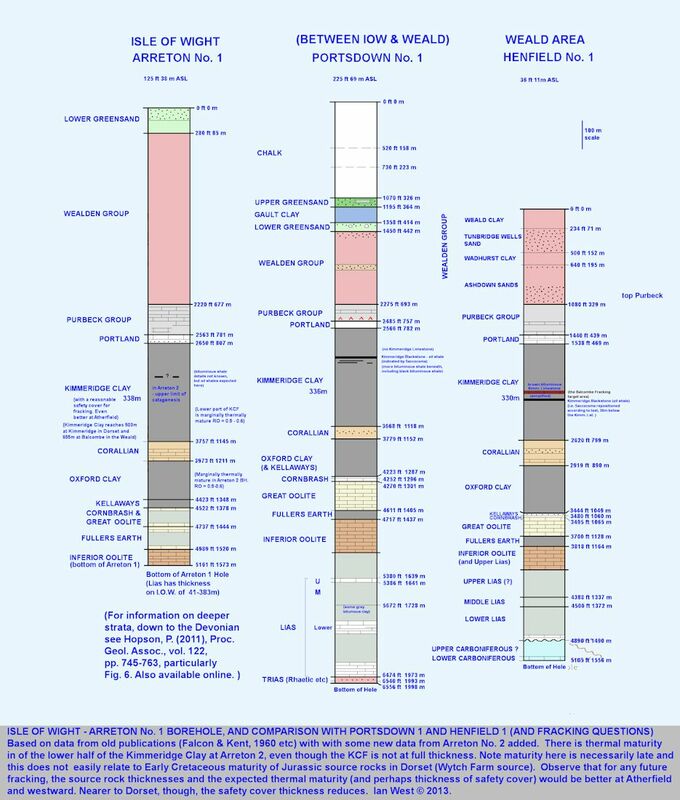 In addition to the Marchwood Borehole, there is another deep borehole nearby which provides useful information on the geological succession and lithologies. It has provided information relevant to petroleum exploration in addition to its primary purpose in providing geothermal energy and data on geothermal prospects. This well is the Southampton No.1 Geothermal Borehole. 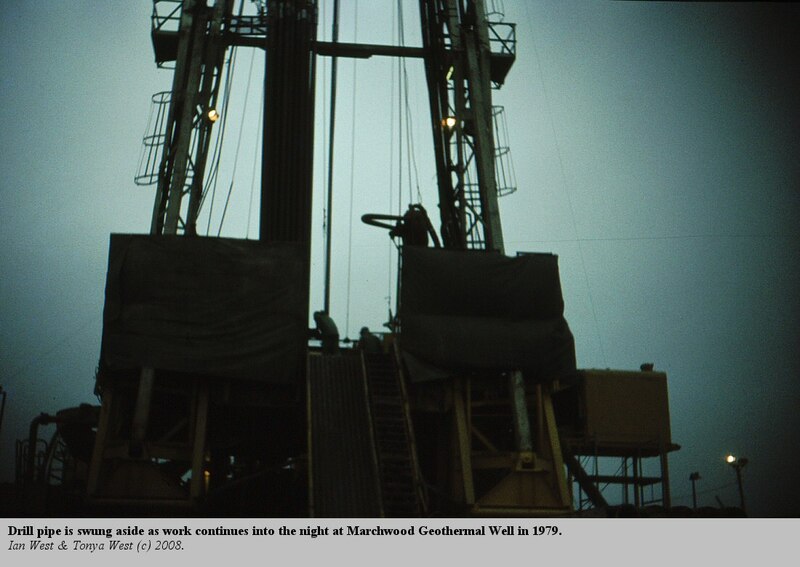 It was drilled the year after the Marchwood No.1 Geothermal Well so that this was the second borehole in the area for geothermal energy. 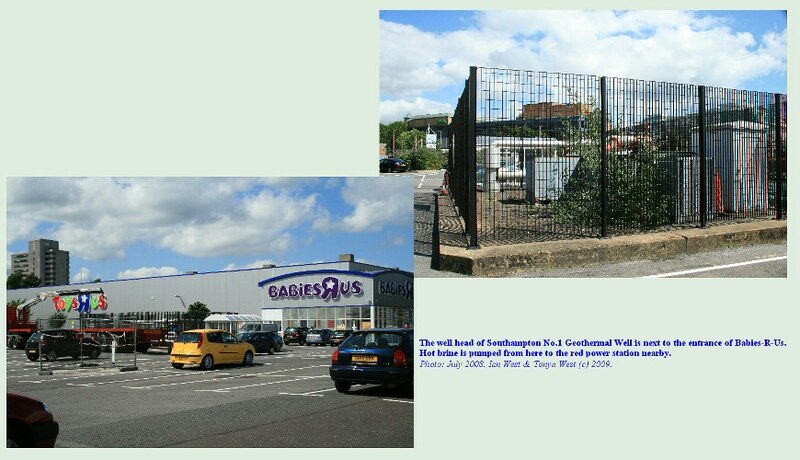 The location is Western Esplanade and the well-head is easily seen by parking in the car park of Toys-R-Us and Babies-R-Us, northwest of the West Quay Centre, Southampton. 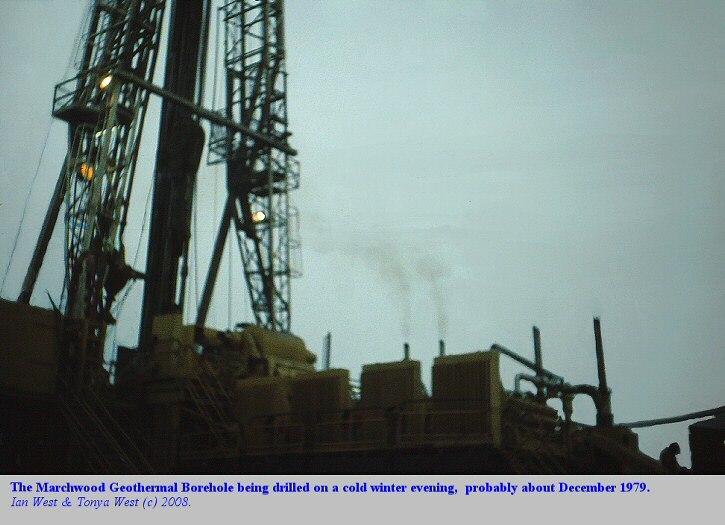 As a geothermal well it is unusual in that there is only one well, a producing or extraction well, and no well to re-inject the brine from the Sherwood Sandstone, with its limited content of undesirable trace elements. The output fluid is discharged into Southampton Water. 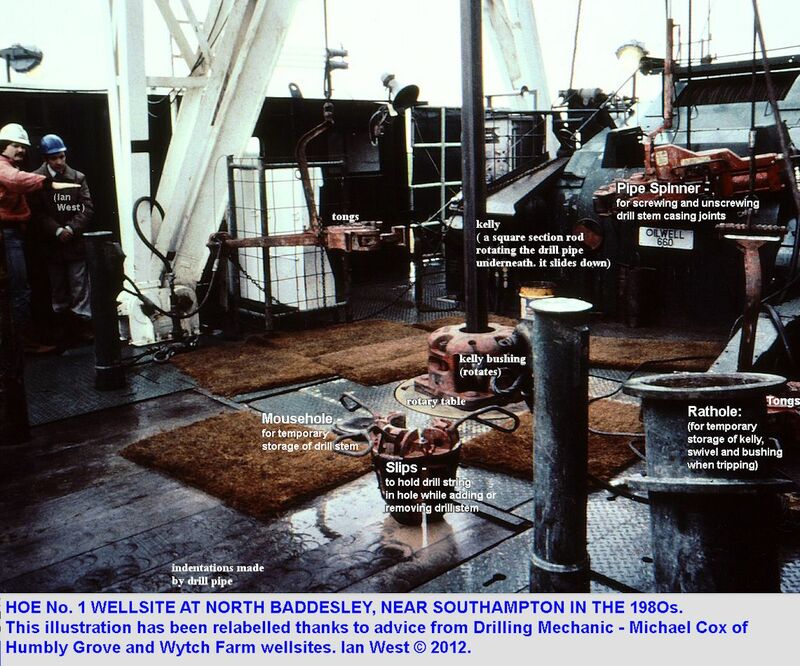 At the time when the well was drilled it was not thought that any possible polution involved was important in an estuary already much affected by sewage and industrial pollution. A more modern procedure is to re-inject the output fluid into another well, an injection well and return it to the deep natural reservoir. 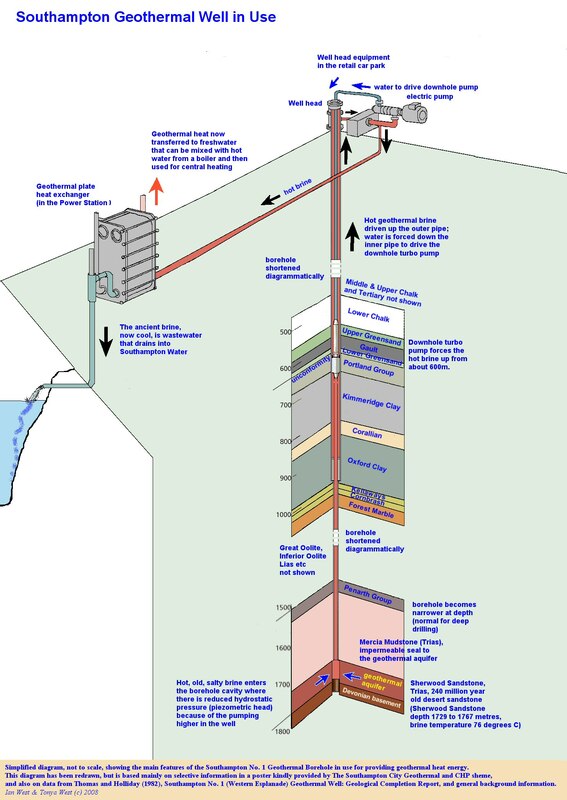 This is the normal procedure in the case of the geothermal wells of the Paris region. Sherwood Sandstone fluids are well-known from the Wytch Farm Oilfield, and contain various trace elements. These are not normally allowed to enter Poole Harbour (see also Wytch Farm section regarding NORM). In many respects Southampton No.1 proved to be similar to Marchwood No.1 and most of the formations are similar and at similar depths. A slight difference is the occurrence of Portland Group beneath the sub-Lower Greensand unconformity. 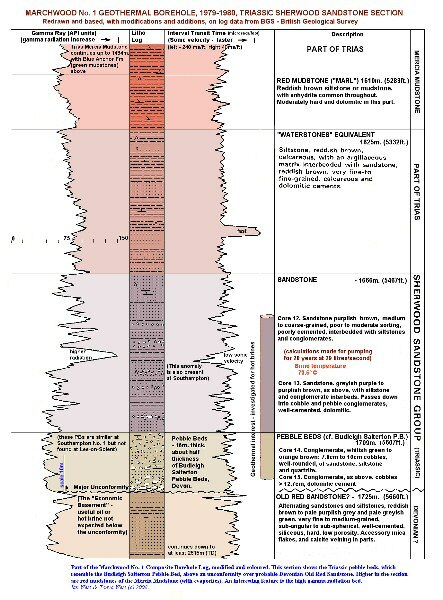 At the time it was hoped that, a sub-Albian fault occurring between the two sites might have led to a significantly deeper level for the Sherwood Sandstone at Southampton, and, consequently, higher temperatures. 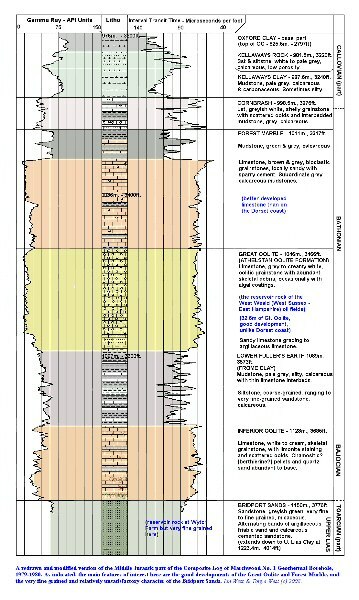 However, in fact, the situation proved to be similar to that at Marchwood and the downhole brine temperature was at about 76 degrees C. A better figure near 100 degrees might have been obtained had the Cretaceous sequence been without major unconformity and was as thick as on the southern Isle of Wight and at Swanage Bay, Dorset (i.e. if, therefore, the Sherwood Sandstone was about another half kilometre or one kilometre lower). The hot rather than boiling temperature was accepted as satisfactory, and this time, unlike Marchwood, the wellbore was not continued deep into the Devonian (Old Red Sandstone) and merely went into the top part of it before TD'ing. 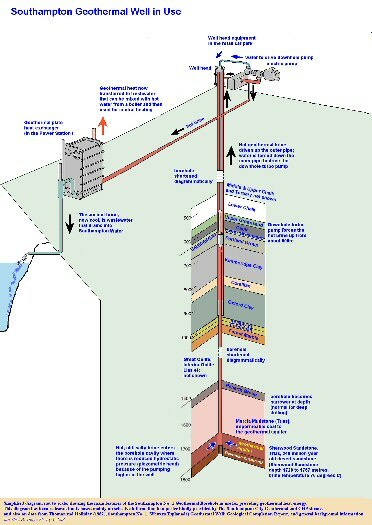 In spite of the moderate, rather than high temperature, the hot brine could be used at Southampton to provide geothermal energery for central heating. The heat has been used to some extent for local buildings, such as Southampton Civic Centre, West Quay Centre and the Royal South Hants Hospital. The brine is brought to the surface by stainless steel, downhole electric pumps. It is not only saturated for sodium chloride and therefore corrosive, but it also contains very small quantities of undesirable trace elements, heavy metals. The brine is thus not usable directly for central heating but is processed through stainless-steel heat-exchangers before being discharged into Southampton Water (ideally there should be another borehole into which the used brine is discharged downwards, but there is not another borehole at Southampton). Thus, the hot brine can usefully provide geothermal energy, but it is a complex matter and is not cheap or easily. In practice the geothermal energy is used in combination with heat from fossil fuel sources at the power station near the West Quay Centre (note the conspicuously red building). Pumping is from a downhole turbo pump at about 600m., and at about the level of the Gault and the Lower Greensand. The geothermal aquifer is the Sherwood Sandstone which is much deeper ranging from 1729m. to 1767m. Thus the brine is rising under hydrostatic pressure for about two/thirds of the height, and is pumped up for the last part. The pumping scheme is explained in basic form in a large colour poster, kindly provided by Utilicom and Southampton Corporation. 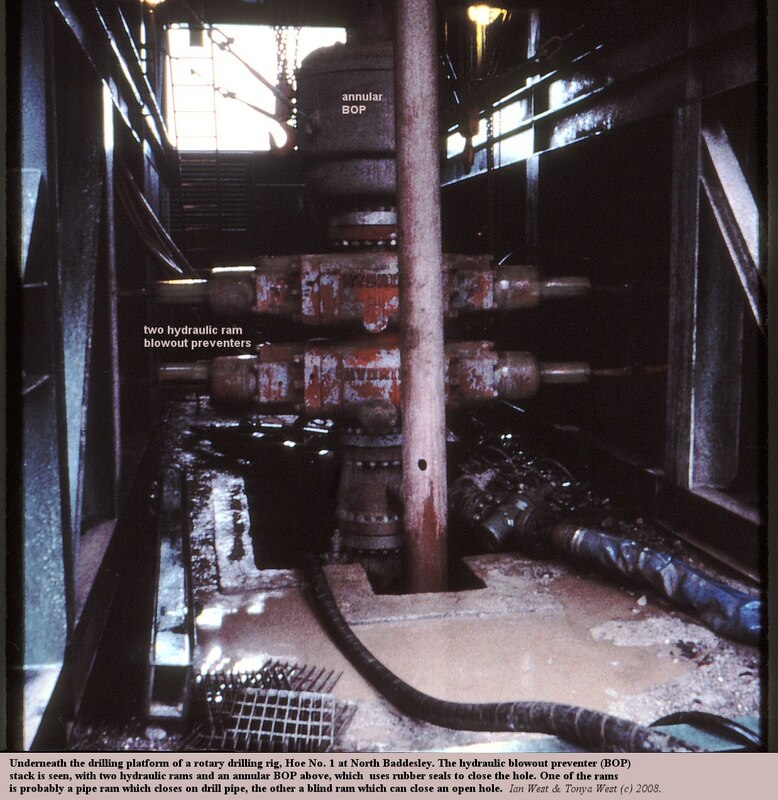 At the well head, shown above, there is an electrical pump which forces a certain proportion of the brine back down a central pipe so as to provide motive power for the downhole turbo pump. This long, narrow, fluid-driven turbine is fairly deep in the borehole and it pumps the hot brine up an outer concentric pipe to the surface (together with the recycled brine used for the power to drive it). All the equipment has to be stainless steel to avoid corrosion from the brine. A borehole at Lee-on-the-Solent was drilled in 1984 by the North Sea Sun Oil Company, to a TD of 6091 feet (1857 metres). It ended in Devonian Sandstone under rather thin Sherwood Sandstone. 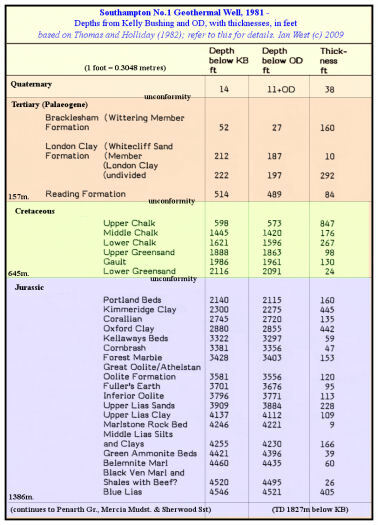 The Tertiary sequence, the Chalk and the Upper Greensand and Gault are of usual characteristics and not remarkable. An interesting aspect is that the main unconformity is not just beneath the Gault but beneath the Carstone of the Lower Greensand. The unconformity is as 2191 feet (668 metres). The Carstone is directly on an almost complete Purbeck sequence but, unexpectly, with no Wealden. The Purbeck is 166 ft. thick (51 metres), in other words rather thin. It seems of "basinal" (Durlston Bay) type with regard to the Lower Purbeck and with anhydrite well-developed. The Caps are not conspicuous but there is some slightly dolomitic limestone in the basal anhydrite strata. The Middle Purbecks contain small ("juvenile") gastropods. There is no well-developed Portland Stone. The Portland Sand is glauconitic to some extent, as is usual, but has some limestone in the upper part. The Kimmeridge Clay is from 2819 ft down to 3608 (789 feet or 240 metres, a moderate thickness for this formation). The Corallian is of normal type with some ooids. The Oxford Clay is of normal facies. There is some thin Cornbrash Limestone. The Forest Marble includes mudstone. The Great Oolite is a fairly thick (4809-4990 ft.) well-developed fossiliferous limestone with some ooids. It is in the facies characteristic of the Western Weald oilfields (and unlike Dorset). The Fullers Earth (s.l.) is calcareous in the upper part, but is the usual mudstone in the lower part. The Inferior Oolite is finely crystalline, micro-sucrosic with some vuggy porosity in parts. Unusually it has some chert. There is no mention of berthierine but some yellow staining is referred to with regard to the lower part. 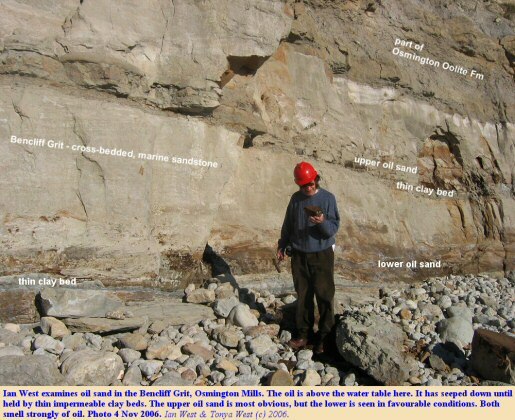 The Bridport Sands are fine-grained with some subordinate claystone in part. The Lias, in general, has much limestone alternating with mudstones. It seems to be more calcareous than in Dorset. 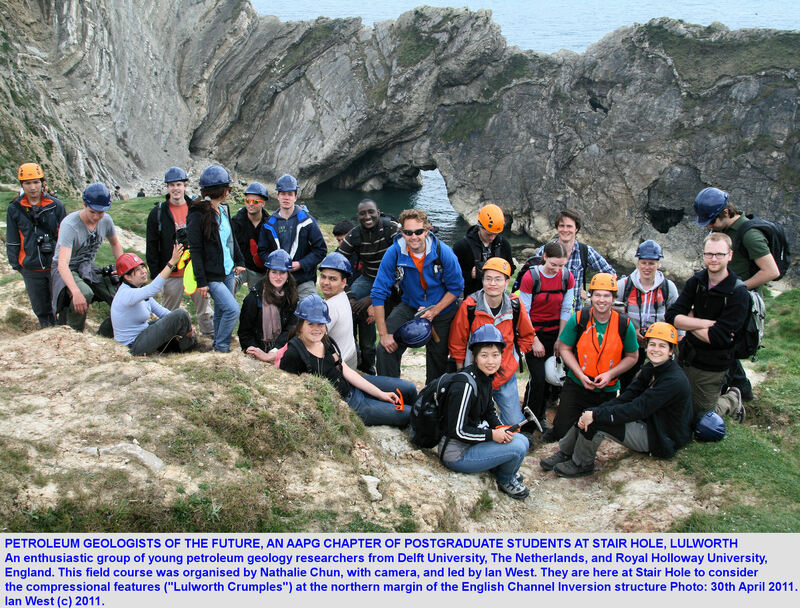 The Penarth Group is in normal Dorset facies with limestones above mudstones. "Sand/Sandstone, mottled, off white/red-brown, friable, poorly sorted, generally medium to coarse-grained (though locally fine-grained), translucent/ smokey, angular and sub-angular quartz, with a ferruginous/argillaceous matrix and/or calcite/silica cements; and interbedded with minor argillaceous and micaceous siltstone." "Recovered fluid indicative of formation water with no evidence of hydrocarbons. Zone abandoned." There seem to be no mentions of oil shows or gas shows in the well. Oil exploration has taken place in the New Forest and, as noted above, BP has drilled a well at Hasley Hill in 1959 (Fordingbridge No. 1). It proved to be dry, however, and the interest in oil exploration moved to Dorset, particularly Wytch Farm in the 1970s. 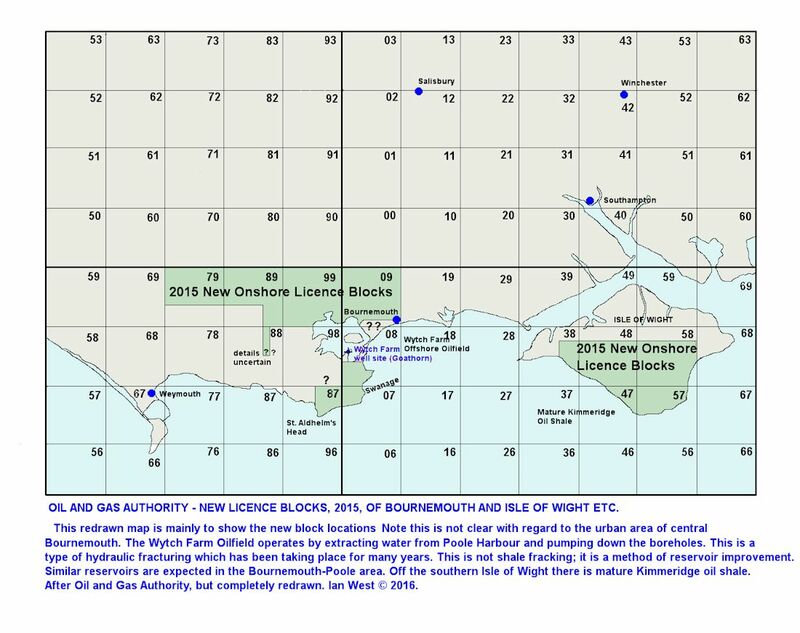 Shell UK Ltd. acquired the licence blocks for much of the New Forest. Block PL.181 from Lyndhurst eastward was surveyed seismically using the White Lias, the top of the Penarth Group (Rhaetic) as a good reflector. Look at the map above and you will see that the best high area that seems to have closure (no lateral escape) is where the 4400 and 4300ft contours loop round adjacent to south of a fault. This type of half-dome is very promising for trapping upward-moving oil and gas. It is situated exactly where it would not be welcomed - under the Denny Wood Nature Reserve! Of course, there was controversy regarding an application to drill in Denny Inclosure, even though the Hasley Hill well seems to have gone through without much argument. There was a Public Inquiry and no permission for drilling was granted. A result of the Public Inquiry is that some interesting information of the subsurface became available at the meeting (see above). Shown above are maps and a cross-section through the strata beneath Denny Inclosure. The proposed trajectory of the Lyndhurst - A Borehole is shown, on the basis of a diagram on a handout sheet provided by Shell UK Ltd at the time of the Public Inquiry. The diagram has been redrawn in colour and labelled with the probable stratal units that are present. 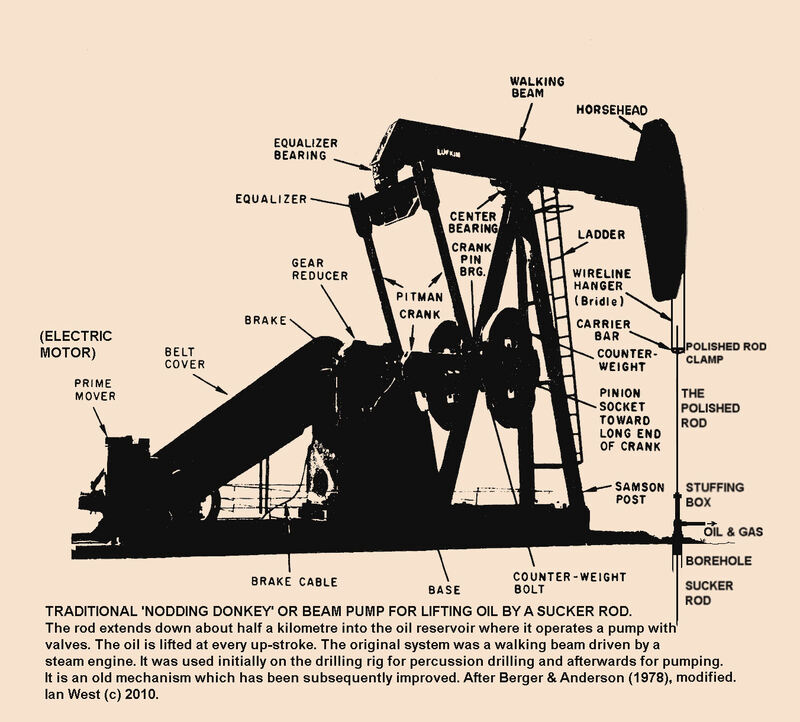 The drawing shows the possibility of oil (and gas?) in all the three main reservoirs of the area. However, it is not know whether anything worthwhile is actually present in any or all of the reservoirs, and the matter remains an interesting open question. Of the reservoirs, the Sherwood Sandstone Reservoir (Trias) is the important reservoir at Wytch Farm and it the reason that the field is one of the largest onshore oil fields in NW Europe (with nearly 500 million barrels reserves). The Sherwood Reservoir, however, requires that special migrations conditions have enabled hydrocarbons to reach the sandstone, and this may or may not have happened in the New Forest area. The Bridport Sands reservoir is the original reservoir of Wytch Farm and is largely operated by water injection to increase the reservoir pressure. The Great Oolite and possibly adjacent Cornbrash reservoirs are those that have proved successful in the eastern Weald area, as at Humbley Grove, Horndean, Singleton etc. 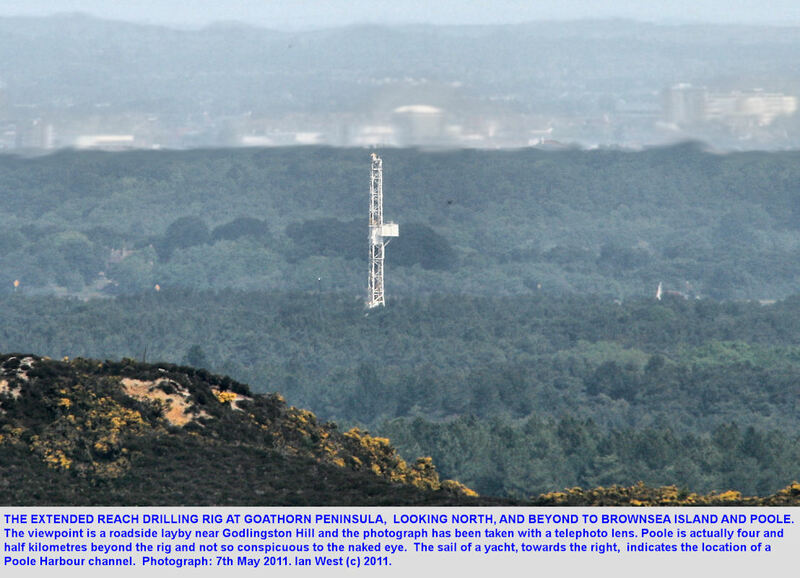 It is not known, of course, whether there is any oil or gas in these potential reservoirs at Denny Inclosure. Conditions might have been unfavourable for migration into the area in Cretaceous time (the general migration date for the region was Cretaceous). The extensional fault which provides closure on the north side might not necessarily be sealing (i.e. oil could have escaped upwards in the Cretaceous). The oil industry probably knows much more now about the likelyhood of oil reserves in this New Forest area, although different companies and different geologists may have varying views. Porosity and permeablility of the reservoirs are interesting aspects that students might wish to consider. Fortunately there is much detailed information on Marchwood No.1, the important borehole at Marchwood Power Station. The log of this should be examined in detail, and any information of Fordingbridge No. 1 and Lockerly No. 1 would be useful. Particular aspects to consider would be the marginal facies changes in the Trias towards the southeast, where it thins out, and the improvement in the reservoir characteristics of the Great Oolite in the same direction. At the time when Lyndhurst - A was planned deviated wells could be drilled but not laterally from any great distance. 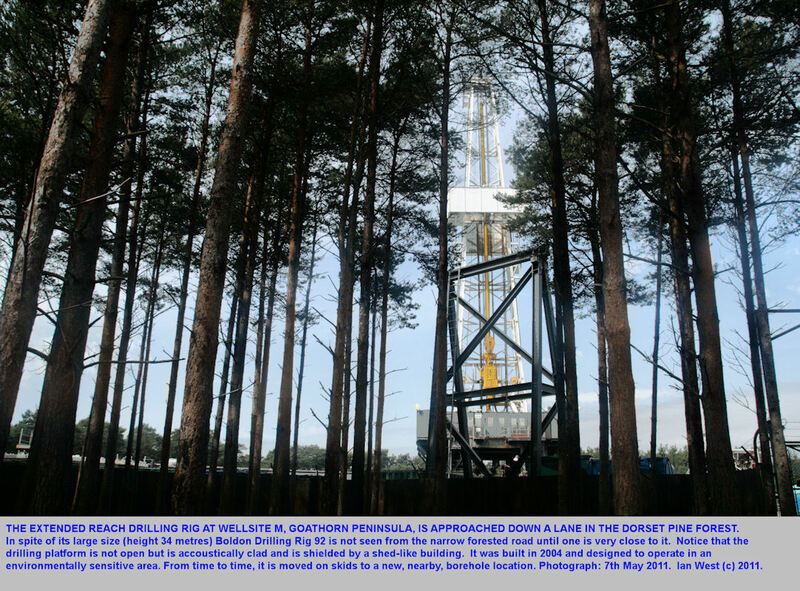 Now the new Extended Reach Technology, used so successfully at Wytch Farm to obtain oil at the Goathorn Well from the vicinity of Bournemouth Pier means that most of the New Forest can now be drilled from drilling rigs situated beyond its official limits, or from urban areas within the forest region. If it was thought worth-while and cost-effective the Denny Inclosure prospect could now be drilled by extended reach (i.e. obliquely) from a large rig at Lyndhurst, Ashurst or Marchwood. 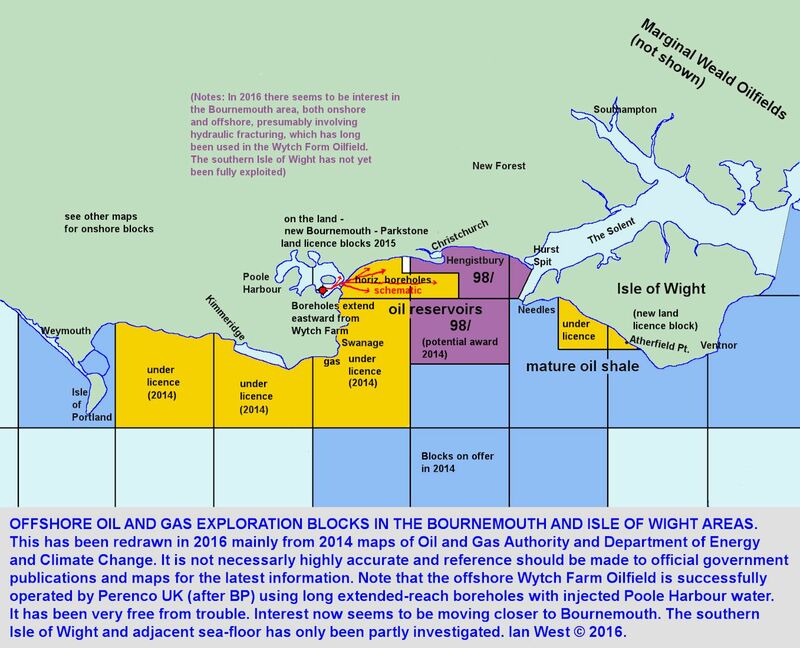 Part of the New Forest region near Lymington has been under investigation for petroleum resources by Wessex Exploration Ltd. Details will be found by going to their website at: Wessex Exploration Limited (not necessarily available now). Here is a small extract from the start of the webpage to draw attention to their work. Particularly see the good maps. Note the information on the Hurst Castle Prospect. 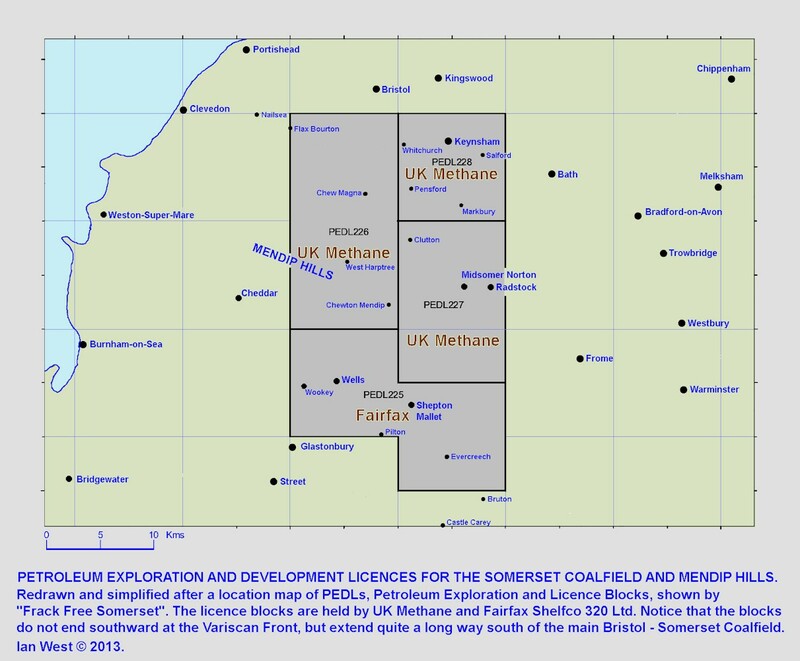 "Wessex Exploration Limited, bidding on its own in the 9th Landward Bid Round was awarded Petroleum Exploration and Development License (PEDL) 089 on 4 September, 2000. PEDL 089 is located in southern Hampshire near the towns of Lymington and New Milton, on the mainland opposite the western end of the Isle of Wight. The work obligation for the initial term of the PEDL was met when Northern Petroleum drilled the Bouldnor Copse 1 well, and fifty percent of the PEDL was relinquished in September, 2006. The PEDL is now in its second exploration period. 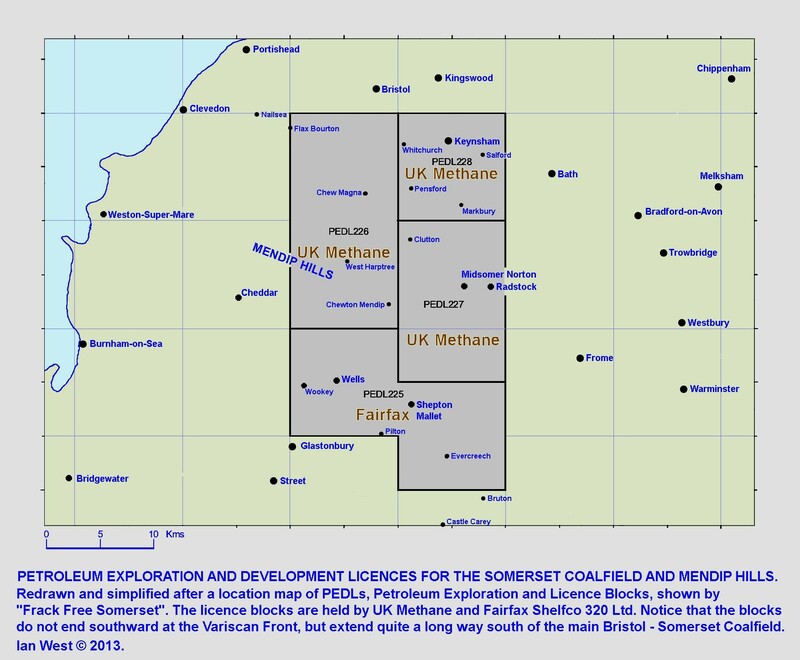 Wessex on 11 September, 2002 made an "Out of Round" application for a Petroleum Production License over the area immediately offshore from and adjacent to PEDL 089. Wessex was awarded License P1153 over this offshore area, effective 3 October, 2003. The primary term of this license expired in October, 2007, but was renewed by DBERR into a second exploration period. See further details of the Hurst Castle Prospect. 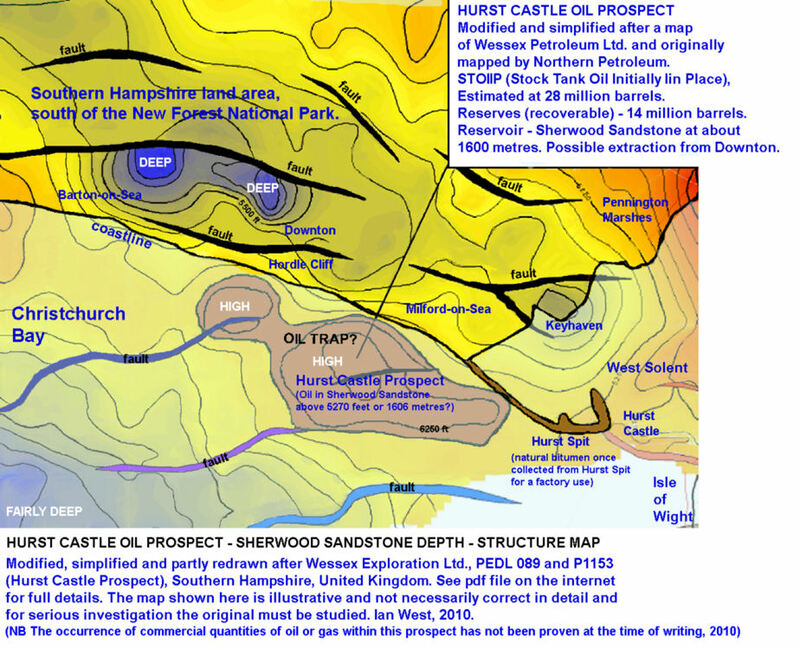 They report that the Hurst Castle Prospect has potential recoverable reserves of the order of 36 million barrels from the Sherwood reservoir, in a Wytch Farm type fault-block feature. The primary reservoir is the Triassic Sherwood Sandstone. The Bridport Sands is a secondary objective as is the Frome Limestone (Great Oolite). 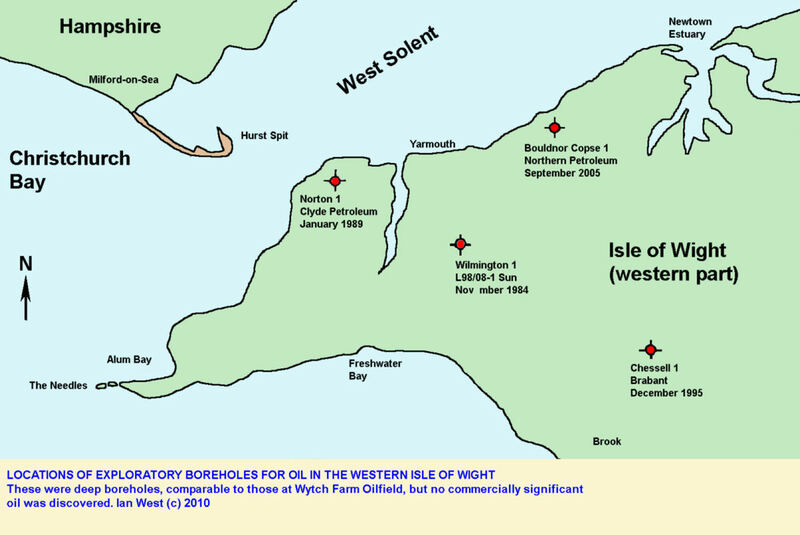 In the same region an exploratory well was drilled at Boulder Copse across the West Solent on the Isle of Wight. The results were negative but Wessex Petroleum did not consider that this impacts on the prospectivity of the Hurst Castle objective. Note that it is of interest regarding the New Forest National Park that the reservoir objectives are the same as those of Shell at Denny Inclosure (Lyndhurst - A). Note that a Sherwood Sandstone Reservoir complication regarding NORM, naturally occurring radioactive material, exists and is successful dealt with at Wytch Farm. This does not mean that it necessarily exists in the Hurst Prospect, but its relative proximity to Wytch Farm would probably require it to be investigated. See the section, above, on NORM in the Sherwood Sandstone of the Wytch Farm Oilfield. Because the NORM precipitates are shielded by steel pipes they are not generally any risk to the public. Another comparison can be made with Wytch Farm regarding water pumping. Water injection, if needed, could require a large source of water (fortunately the sea is not far away). With regard to pumping, in the later stages of oil production from the Sherwood Sandstone at Wytch Farm there has been a 95% water-cut (in other words almost 20 times as much water as oil is pumped). Thus disposal methods for surplus water might also have to be considered. However, these are later issues, only of any relevance if substantial oil is discovered. HOE LANE BOREHOLE, North Baddesley, Romsey, Hampshire. - High quality Kimmeridge Oil Shale and bituminous shale at about 730 metres depth. The Hoe Lane No. 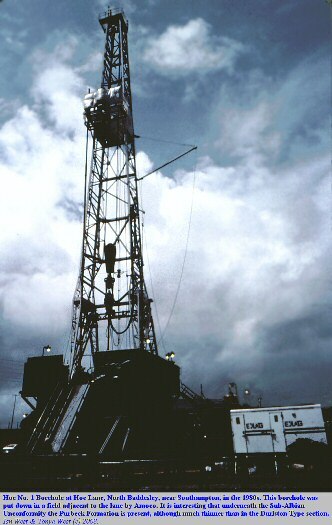 1 Borehole by Amoco in about 1983 was a conventional borehole, intended to investigate the possible southern limits of the Stockbridge Oilfield. That is the very successful and second largest oilfield in southern England and it is mainly produced from the Larkwhistle Farm wellsite of Igas, north of Winchester. The well at Hoe Lane was not commercially successful in terms of oil. 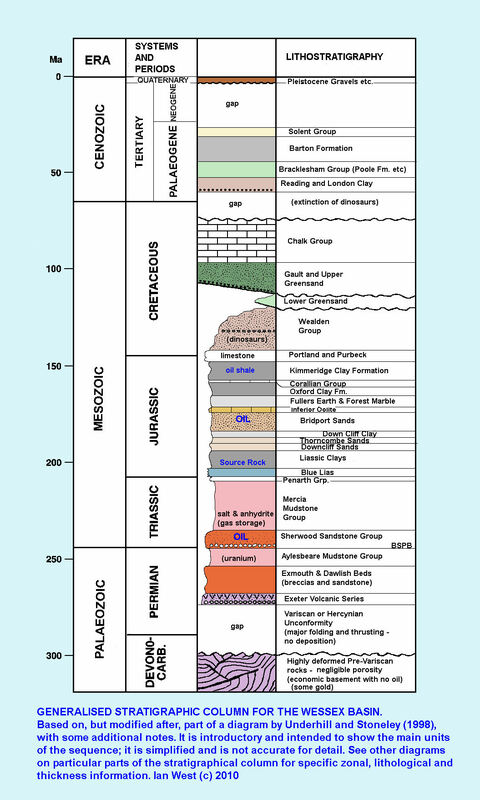 The oil shales of the Jurassic were not then the main target, but, of course, are now known to be important. The local Planning Applications have been listed as follows. TVS.3459/1 Exploratory work in search of hydrocarbons, involving drilling of a borehole and subsequent testing of any discovery at - Hoe Farm, Hoe Lane, North Baddesley. Temporary Permission subject to conditions valid until - 31/01/83, Granted - 22/03/82. The well was presumably to investigate the Middle Jurassic (Great Oolite - Inferior Oolite etc) reservoirs that are important at the Stockbridge Oil Field. It was intended for conventional oil exploration. General position - eastern end of Hoe Lane, near Sylvan Drive, North Baddesley, east of Romsey, Hampshire. Coming from North Baddesley and driving westward down Hoe Lane, it is near the very first bend, on the left of the road. It is near to Hoe Cottage. It is on the south side of the road, not far from Hoe Farm. There is nothing conspicuous now, just some hard tarmac and concrete surfaces and a blocked gate. The general area is peaceful countryside, north of Toot Hill, Rownhams. I have visited in 1983 and 2015 (and driven past, down the lane many times, living at Romsey, not far away). The well was spudded into the very base of the Eocene, Bracklesham Group, the Wittering Formation. It shortly penetrated the Whitecliff Sand Formation, a subdivision of the London Clay Group. The location is on the south side of the Eastleigh Anticline. It would have penetrated the Reading Formation and then gone into the Chalk. Details of the borehole in the Upper Greensand, Gault, Lower Greensand and Wealden are not known (the full local Chalk succession would be expected, but the Wealden, being beneath the Late-Cimmerian Unconformity may or may not be present). The Purbeck Group, in usual facies for the area, is present in a thinned succession, perhaps something like 50 or 60m. but details have not been published. With regard to the deeper succession, the well log details are, according to BGS, confidential and restricted. The full log, with the uppermost part, is not publicly available. However, a substantial part of the borehole record of Hoe 1, has been published, with additional technical detail. It is given on p. 27 in Gent, C.M.A, Hannis, S.D. and Andrews, I.J., Appendix D, Estimation of total organic carbon in the Jurassic shales of the Weald area by log analysis. See particularly the associated Appendix D1. This important paper is within the Appendix to the BGS report on: Jurassic Shales of the Weald Basin; Geology and Shale Oil and Shale Gas Resource Estimation. It is publicly available online. The reader may wish to go to: Andrews et al. (2014), DECC 2014. and then obtain the appropriate Appendix. An illustration of the type of very useful data available in shown in the image below (purposely partly-obscured). A gamma ray log (with interpretation)for the London Clay and down to the top of the Chalk for Hoe 1 Borehole (SU38451915) [6 GR 70] is given in fig. 7 of Newell (2011). The Chalk is about 308m. thick at Hoe 1, the expected and normal full thickness for the area. 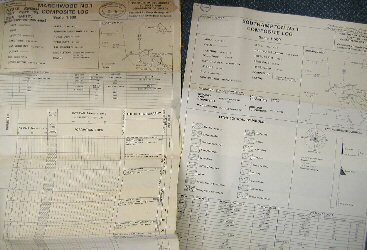 A simplified log for the uppermost part of the borehole can be drawn, based on these data. The log shown in the Appendix to Andrews et al. starts, at the top at 2298 feet or 700.5 metres at the top Kimmeridge Clay; it is shown down to 4899 feet or 1493.2 metres in the Penarth Group (i.e. below the base of the Jurassic). The Jurassic succession is fairly complete with a thin Purbeck Group. The Kimmeridge Clay at Hoe 1 is about 146 metres thick. This compares to about 503 metres in the basinal section at the type locality, Kimmeridge. So it is a condensed sequence at Hoe 1, but with an over-riding preservation of the bituminous beds. It is tempting to speculate that this is because the bituminous beds are products of higher sea-levels and the North Baddesley area was not a deep basin. It is situated in a relatively shallow region (but not very shallow) between the Weald Basin and the Portland - Isle of Wight [i.e. south Dorset etc.] basin. However, it was probably distant from locations of high clastic input. This is probably the basis for the unusual purity of a sequence of bituminous shales. A location of thin sequences is, of course, a place to expect lower rather than higher thermal maturity. This is probably the case; the sequence is probably not mature. 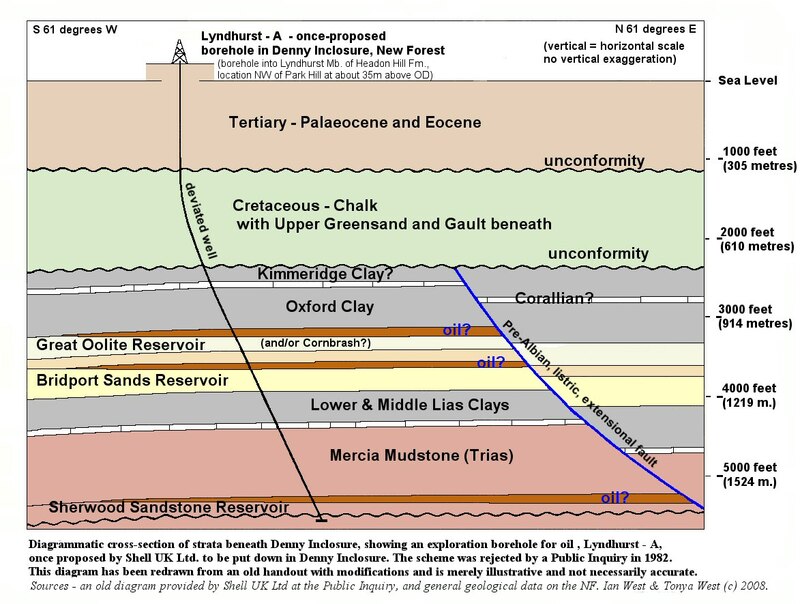 Thus if any large scale production was to take place from the bituminous shales of the Kimmeridge Clay (and Oxford Clay) at Hoe 1 then pyrolysis would be needed [although not necessarily welcomed!]. The general story is probably fairly clear. 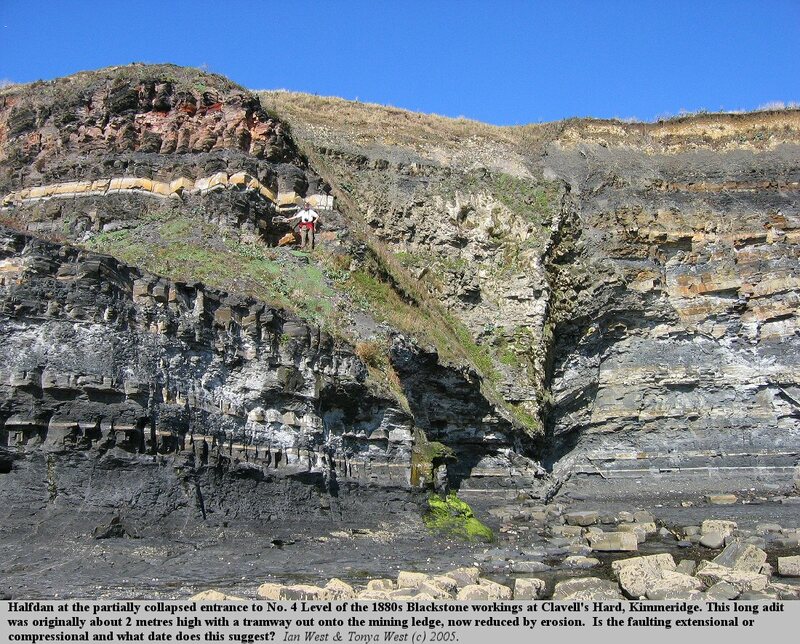 Technical details of the Kimmeridge Clay bituminous shales at Hoe 1 are given in the Andrews et al. Appendix. They include Gamma Ray, Caliper, volume of clay, scaled sonic, calculated TOC and core TOC at intervals. Thus there is much useful and clear information given on p. 27 but only from Lower Lias to top Kimmeridge Clay. Hoe Lane - N/G - Net oil shale to Gross oil shale for the Kimmeridge Clay Formation = 0.96 (highest known in the Kimmeridge Clay onshore UK). Hoe Lane - Mean TOC (total organic carbon) for the Kimmeridge Clay Formation = 7.9wt% (highest known in the Kimmeridge Clay onshore UK). Andrews et al. (2014), Appendix G. (Gent, Harris and Andrews, 2014. 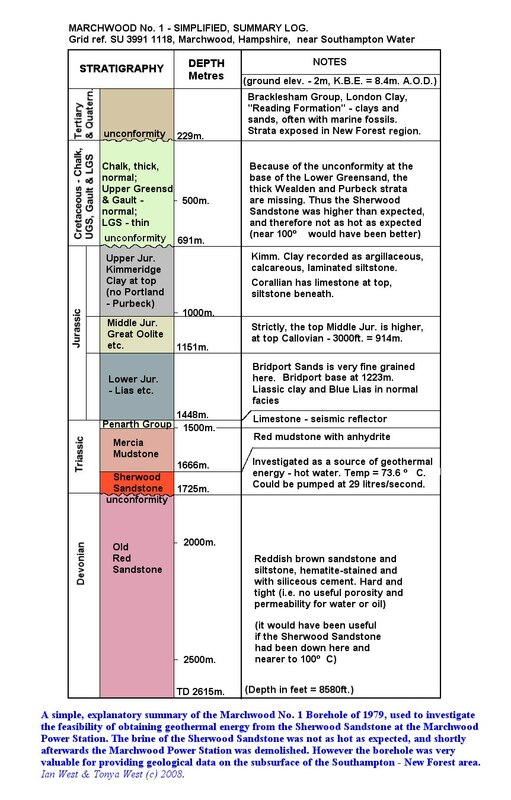 Estimation of total organic carbon in the Jurassic Shales of the Weald by log analysis (Kimmeridge Clay, Table 2 etc.). Some more information from the BGS reports is now summarised. 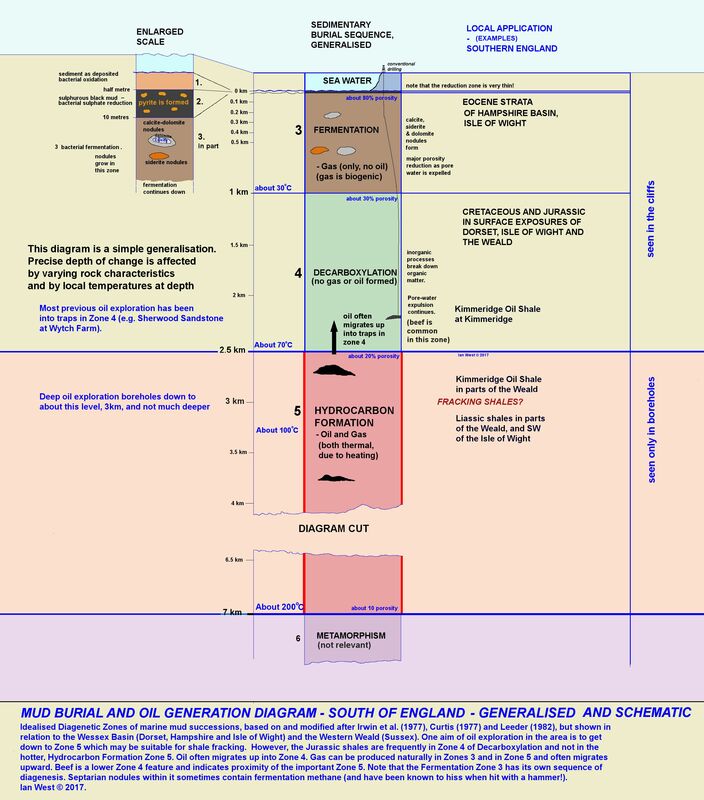 The Hoe Lane oil shale deposit is at 2400 metre depth to 3,300 metres. The organic-rich deposits are mainly Kimmeridge Clay but also include Oxford Clay (both Jurassic). The TOC (total organic carbon) ranges up to 12%. The mean for the Kimmeridge of Hoe 1 is just over 7%. For a thickness of near half a kilometre that is very good for southern England. The Hoe Lane site has been drilled to a depth of 4,900 metres, at least reaching the Penarth Group. 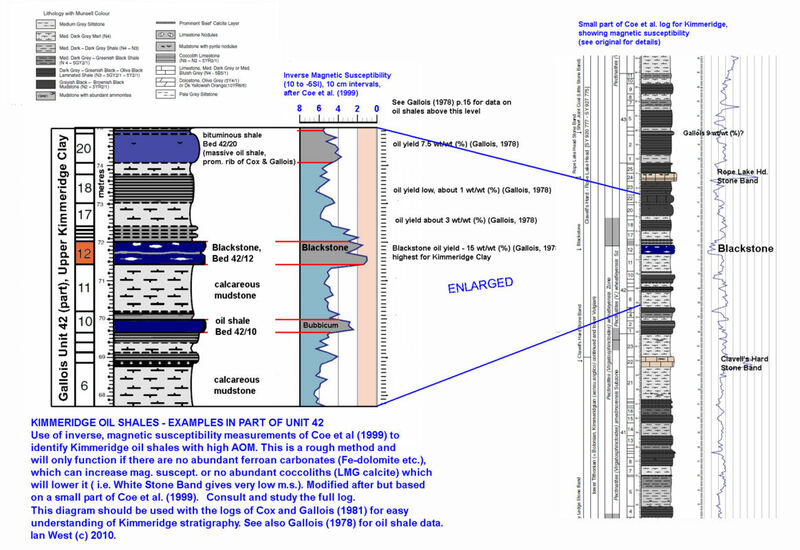 The BGS publication mentioned above gives details regarding oil shales, but does not give the full well log. The present situation with the oil shales seems to be that they are not thermally mature here at Hoe Lane, North Baddesley (although I do not have full details). You would not expect them to be so, because they are not within an Inversion Structure (they are on a very slight high of the Jurassic) and not under very deep burial. Thus for production of oil from the oil shale, pyrolysis [heating] would seem to be needed. This generally does not take place in southern England. However new techniques are being reported in the literature, and, of course, oil exploration is always advancing. Thus it may take place at some time in the future, probably in conjunction with hydraulic fracturing. It is very unlikely that there are any immediate plans for this - it is simply a resource to keep for the future. (However, although the details are not known to the writer, it would seem that extensive house building is planned (2015? )over the top of this thermally immature, but potentially, rich deposit of oil shales). Pyrolysis is a thermochemical decomposition of organic material at elevated temperatures in the absence of oxygen (or any halogen). It involves the simultaneous change of chemical composition and physical phase, and is irreversible. The word is coined from the Greek-derived elements pyro "fire" and lysis "separating". After Wikipedia. You-Hong Sun, Feng-Tian Bai, Xiao-Shu Lu, Qiang Li, Yu-Min Liu, Ming-Yi Guo, Wei Guo and Bao-Chang Liu. 2015. A Novel Energy-Efficient Pyrolysis Process: Self-pyrolysis of Oil Shale Triggered by Topochemical Heat in a Horizontal Fixed Bed. This paper proposes a novel energy-efficient oil shale pyrolysis process triggered by a topochemical reaction that can be applied in horizontal oil shale formations. The process starts by feeding preheated air to oil shale to initiate a topochemical reaction and the onset of self-pyrolysis. 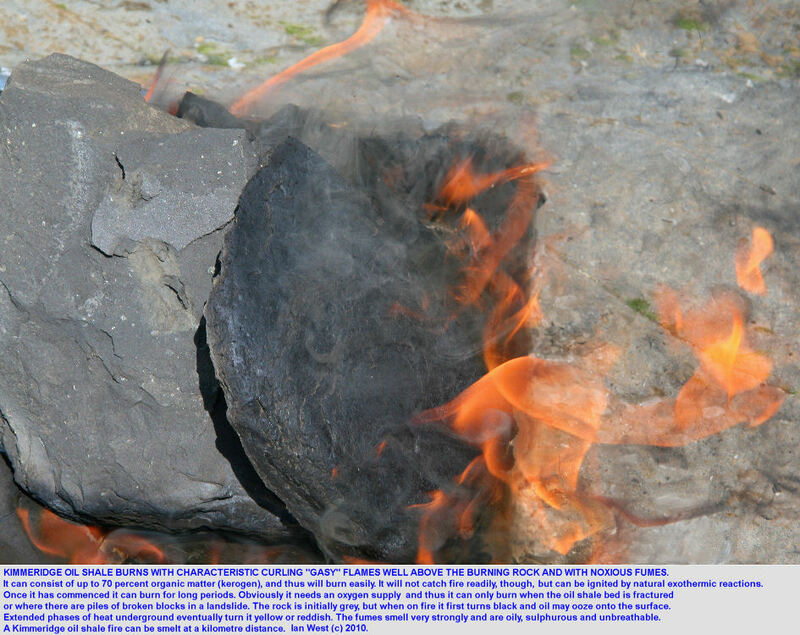 As the temperature in the virgin oil shale increases (to 250 - 300 degrees C), the hot air can be replaced by ambient-temperature air, allowing heat to be released by internal topochemical reactions to complete the pyrolysis. The propagation of fronts formed in this process, the temperature evolution, and the reaction mechanism of oil shale pyrolysis in porous media are discussed and compared with those in a traditional oxygen-free process. The results show that the self-pyrolysis of oil shale can be achieved with the proposed method without any need for external heat. The results also verify that fractured oil shale may be more suitable for underground retorting. Moreover, the gas and liquid products from this method were characterised, and a highly instrumented experimental device designed specifically for this process is described. This study can serve as a reference for new ideas on oil shale in situ pyrolysis processes. The Romsey Advertiser, Friday, Aug. 12th, 2016. Article - Front Page and p.4. Payout idea 'blackmail' say critics. A fresh row has erupted over plans for fracking in Test Valley. Several exploratory boreholes for oil have been drilled in the Isle of Wight. Before 1960 the exploration commenced at Arreton (Falcon and Kent, 1960). The structure was a closed, east-west elongate dome south of the Chalk Ridge. 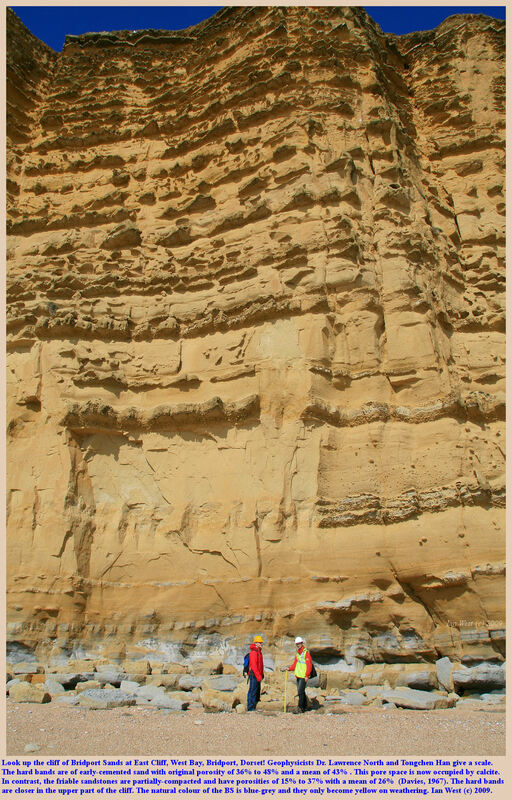 The strata at the surface is Lower Greensand and the borehole extended down to the Inferior Oolite at 5161 feet (1573 metres). This is not as deep as most modern petroleum boreholes in the region, and therefore did not test Bridport Sands or Sherwood Sandstone (the reservoirs at Wytch Farm). 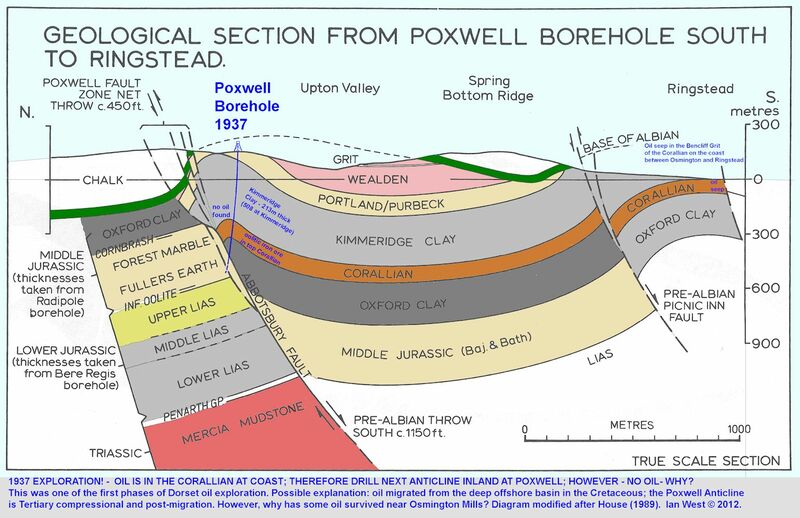 The first exploratory wells in the Wessex region in 1936 in obvious anticlines at Portsdown and Poxwell were disappointing and proved dry. Unlike Iran, where the geologists had been exploring, there was no significant oil in these anticlines. None was found in other similar folds in the area. Already, in 1960, Falcon and Kent (1960), both very notable petroleum geologists, realised that most of the Tertiary structures investigated (Poxwell Pericline, Portsdown Anticline, Chaldon Anticline etc) had developed too late to act as traps for oil migrating towards the edge of the Wessex Basin. 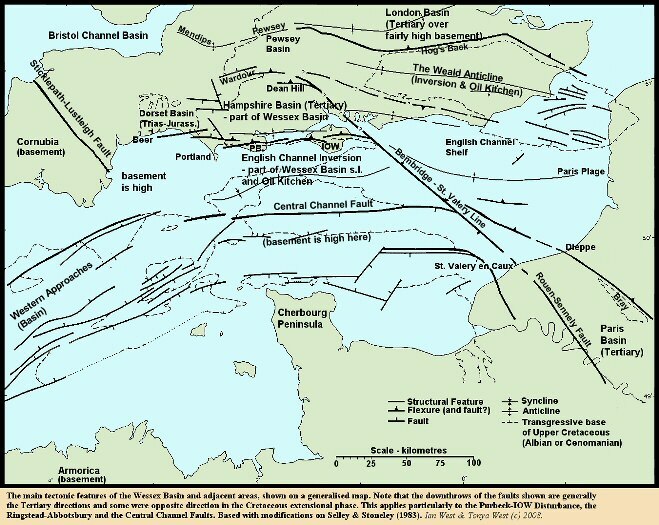 Without enormous quantity of seismic data that exists today they did not have a good knowledge of the Cretaceous structure at depth, and the English Channel Inversion theory so familiar now, was not well-understood at the time (although intra-Cretaceous tectonism had been recognised since well before the 1930s). 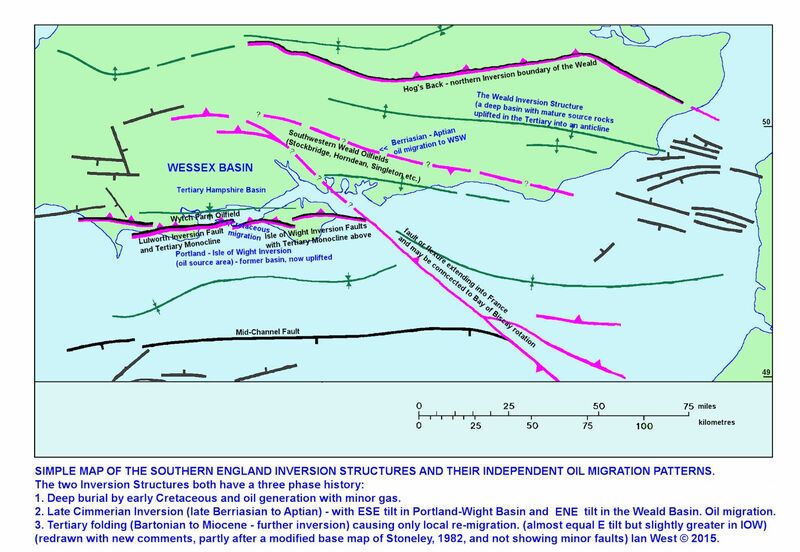 Of course, it well-known now that oil did migrate towards the margin of the English Channel (Wessex in part) Basin. The Wytch Farm Oilfield is proof of this. Similarly oil migrated towards the margins in the Weald Basin (or Inversion). The Middle Jurassic oilfields of West Sussex and East Hampshire are proof of this. Now it is known that the migration was Cretaceous in age and was into Cretaceous fault traps (the intra-Cretaceous or Late Cimmerian structure are largely extensional faults, unlike the compressional folds of the Tertiary). Thus, although the Arreton Borehole was not targeted at Cretaceous traps, it was planned in the 1950s to find oil that had migrated to the edge of the basin. The general theory was correct but the exact location was not. 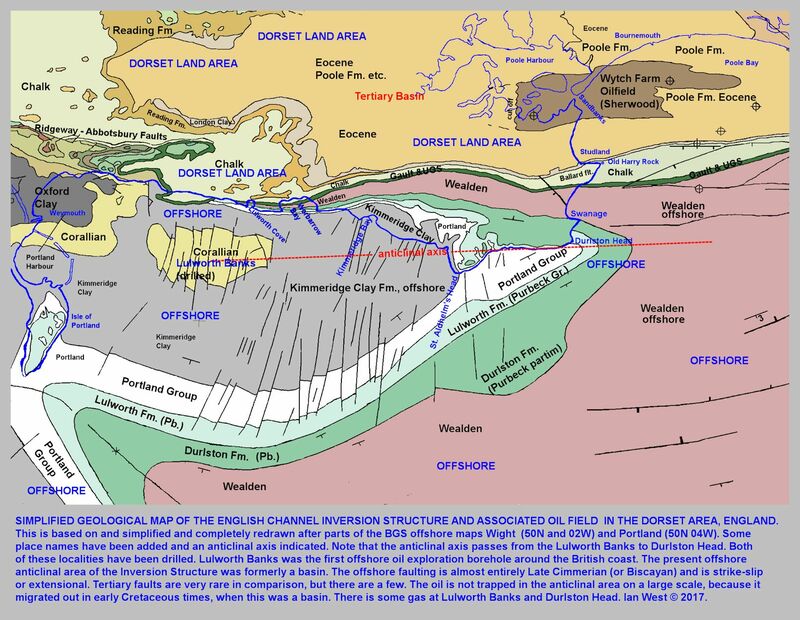 Oil had not accumulated in the Corallian (as seen in small quantities at Osmington Mills) or the Cornbrash (as at Kimmeridge), and nothing seems to have been found in Middle Jurassic limestones, the reservoirs of the West Sussex and East Hampshire fields. These Middle Jurassic limestones were found to be more muddy and less suitable as reservoirs than in Portsdown and Henfield (Weald Basin). Of general geological interest, it was noted that the Wealden had a thickness of 2010 feet (612 metres) and thus was like the thick succession at Swanage, Dorset. Only the upper part of the Wealden is exposed in the Isle of Wight cliff sections. The Purbeck was found to be 343 feet (104 metres), only a little thinner than in the type section at Durlston Bay. 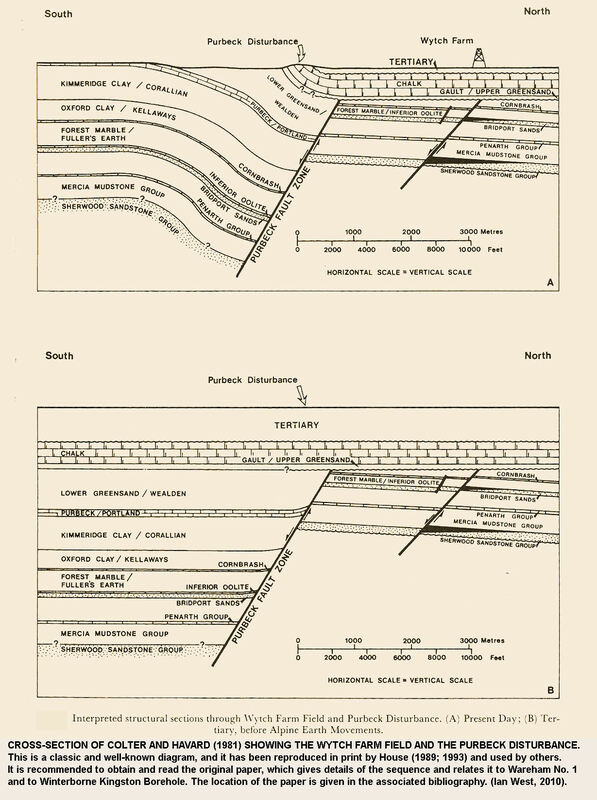 Data for depth of formation tops will found in Falcon and Kent (1960), Table 1. Most of the recent exploratory wells of the 1980s and 90s etc seem to have been targeted at fault structures north of the main Purbeck-Isle of Wight Disturbance (i.e. north of the line of the re-activated Variscan faults). There are major unconfomities beneath the Albian, as shown in a sub-Albian map above. The structural similarity with the Wytch Farm area is obvious, and the hope of finding another highly-successful Wytch Farm Oilfield has clearly been a driving force. Most boreholes seems to have been concentrated in the western part of the island, and thus closer to Wytch Farm. Theories of migration from an area with mature source rocks southwest of the Isle of Wight is a factor. Surprisingly the wells have proved dry so far. The problem might be one of migration. Even in the area south or southeast of Wytch Farm there are problems about a migration fairway. Appropriate juxtaposition of permeable strata at the right time was essential. Another possible complication might be the regional easterly tilt during Aptian-Albian times. This is seen in the coast from Dorset to Devon as the westerly overstep of the Albian. If migration coincided with this movement, then there may have been not just a tilt up towards the high north of the basin, but also a tilt up westwards. In simple terms there could have been migration in the Cretaceous towards the northwest, rather than just northward. Undoubtedly though there is no simple pattern and the details have to be established. The state of the reservoirs or potential reservoirs is not considered in any detail here. The Isle of Wight is fairly close to the eastern margins of the Triassic Basin and thus Triassic reservoir facies may be different from Wytch Farm (i.e. more marginal in facies). The Bridport Sand facies is finer-grained and a less satisfactory potential reservoir at the Marchwood Borehole, compared to the Dorset area. The Middle Jurassic is "muddy" according to the records of the Arreton Borehole. There are only very general comments here though, without technical detail and without conclusions. Obviously those who have studied the Isle of Wight boreholes will have a much clearer knowledge not only of the reservoir aspect but also of the possible migration aspect. A exploratory borehole Sandhills No. 2 has been sited at Sandhills near Porchfield, in the northern part of the Isle of Wight, not far from Newport (A Sandhills No.1 Borehole had been drilled before 2001). The licences here had exploration targets for Sandhills No. 2 in both the Middle Jurassic Great Oolite (a major reservoir rock in the western Weald area such as Horndean and Singleton) and in the Triassic Sherwood Sandstone formations (the major and lower reservoir of the Wytch Farm oilfield). Before drilling the estimated potential recoverable reserves at Sandhills-2 were believed to be 10-15 million barrels in the Great Oolite and 20-80 millions barrels in the Sherwood Sandstone. Before the drilling the structure was well-established from seismic and the formations which could be oil-bearing were expected to be present. In 2005, Northern Petroleum began exploratory drilling for oil, with its Sandhills-2 borehole at Porchfield. However, there was no success in finding useful oil reserves, even though the prospect initially seemed very promising. Northern Petroleum ceased operations at Sandhills in October 2005. An interesting feature related to the Inversion Structure, partly explained in the diagram above, is the occurrence of reworked Jurassic (Kimmeridge Clay) ammonites in the Cretaceous strata of Redcliff, Sandown. 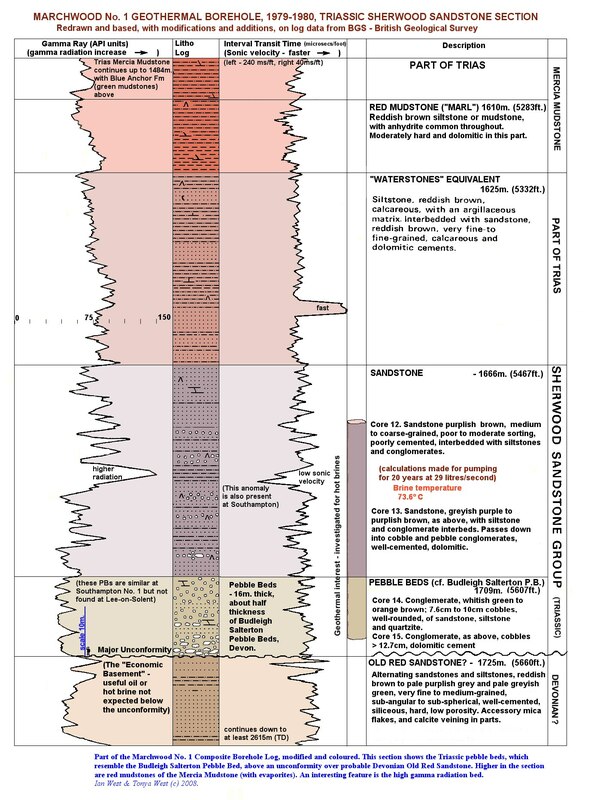 Beneath the southern Isle of Wight, concealed and known only from boreholes and seismic is a thick sequence of Lower Cretaceous and Jurassic strata; in the northern part of the island, however, about a kilometre of this is missing. This large gap is the result previous extensional movements on the same faults producing depression to the south and uplift to the north. The northern uplifted area, similar to the structure at Wytch Farm Oilfield, was eroded in Cretaceous times. The southern area is part of the English Channel Basin and this was uplifted, thus becoming an inversion structure during the Tertiary tectonism. "The Kimmeridge Clay Formation of onshore eastern and southern England (Fig. 21) is a potentially prospective shale (for oil and probably biogenic gas) because it contains ubiquitous oil-shale beds (Gallois 1979). Its background shale has TOC up to about 10%, its bituminous shale has TOC values up to 30% and its oil-shales have TOCs reaching 70% (e.g. the Blackstone Bed, Stocks and Lawrence 1990) [70% is actually the total organic matter, not the total organic carbon]. Five basins show thickening of the formation in response to syn-sedimentary faulting (Weald, Wessex, English Channel, Cleveland and Lincolnshire-Norfolk). The Kimmeridge Clay Formation is immature for thermogenic gas generation onshore (Scotchman 1991) and it is only marginally mature for oil generation in the Weald Basin depocentre. 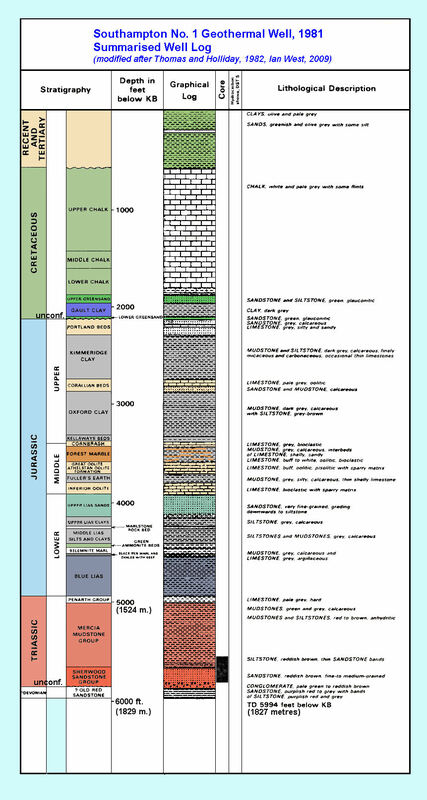 Its carbonate content varies from 12% (oil-shales) to 94% (limestones, Farrimond et al. 1984). Scotchman (1991) showed that high TOCs and sedimentation rate result in high phytane/TOC values. The low maturity is confirmed by TMAX 403-437 �C on pyrolysis. Samples confirmed kerogen of Type II or mixed Type II-III on the Van Krevelen diagram (Tissot et al 1974). Exploration for oil-shale deposits was conducted in Dorset at Corton after World War 1 (Strahan 1920). 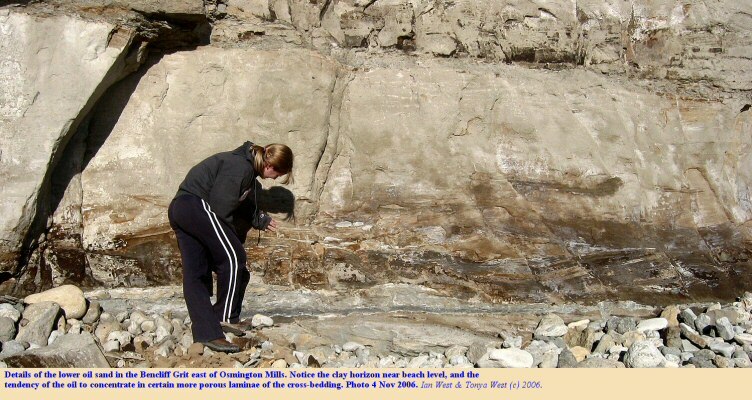 Exploitation of these Kimmeridge Clay oil-shale beds was uneconomic because of the thinness of the beds and high sulphur content. 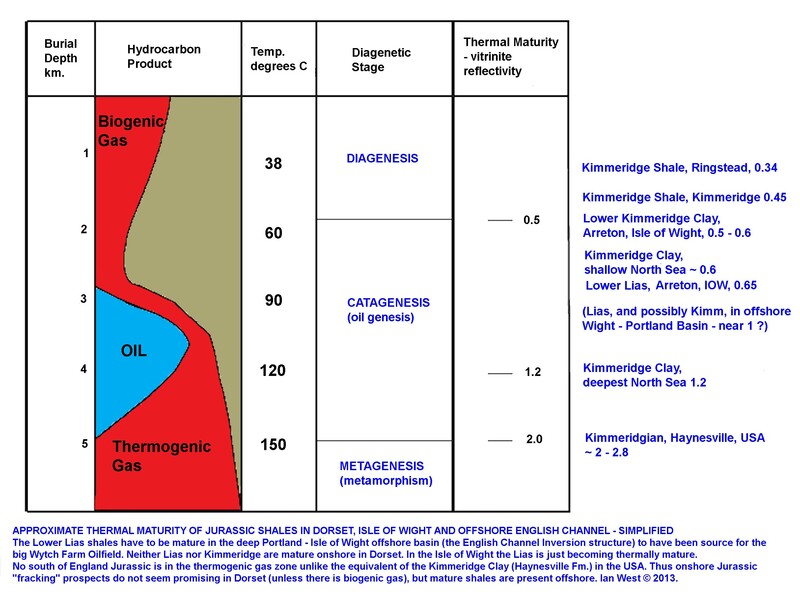 As mentioned above, however, the Kimmeridge oil shale is not generally thermally mature, whereas in places (offshore) the Liassic bituminous shales probably are. Shale Gas extraction in Dorset - not planned. The deep basin is not onshore in Dorset; it is the Portland-White Basin offshore. The first offshore drilling around Britain took place within it, south of Lulworth Cove, in the 1960s before the North Sea was developed. Whether or not any hydraulic fracturing ever takes place in the offshore basin is unknown. The Kimmeridge Clay is probably too near the surface south of Dorset (insufficient overburden as a seal) and the Lower Lias has not been shown to have the oil shale quality of the Kimmeridge Clay. 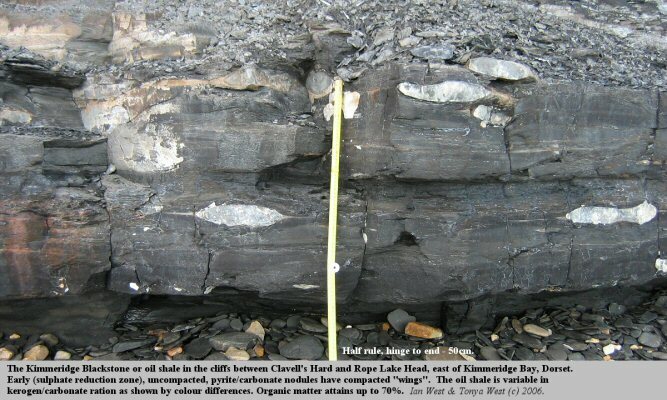 A good oil shale like the Kimmeridge Oil Shale would be needed. It must be deeply buried. It should have natural joint fractures, but not, as has the Kimmeridge Clay on the Dorset, numerous, rather open extensional faults. The obvious targets in Dorset, then, are the Kimmeridge Clay and Lower Lias. The Lower Lias is older and more deeply buried, but is less organic-rich than the Kimmeridge Clay. The units vary laterally in thickness and are better quality and thicker in the basins. The main Kimmeridge oil shale, the Blackstone, is about 60cm thick at Kimmeridge and probably much the same towards Durlston Head. This is part of the English Channel Inversion area. There is, as the maps show, a basin is in the English Channel south of the Isle of Purbeck to southeast of Swanage. The Isle of Portland is on a western extremity of this, but overburden is thin here. There is a sub-basin, not as deep as the offshore one north of Weymouth in the Upwey - Portesham area. The Kimmeridge Oil shale has been worked at Portesham, but is quite near the surface. Note that the present burial depth of an oil shale is not the key factor with regard to its thermal maturity. Within inversions the former burial depth may have been much greater. Thus the maturity of an oil shale may far exceed that expected from its present burial depth. The following paper by Davies, may suggest that perhaps there will be no shale gas hydraulic fracturing from the Kimmeridge Oil Shale or Blackstone in south Dorset, at the places where it is thickly developed. The Kimmeridge Blackstone or oil shale is too close to the surface in the southern Isle of Purbeck, and at Portesham and on the Isle of Portland. It is not at the necessary two to three kilometre depth in these area. Liassic oil shales are different, but generally have a much lower organic content. So there are no plans for hydraulic fracturing for gas in Dorset, and not good prospects onshore. Details of the offshore basins are not fully understood. Considering gas escape, the Dorset Jurassic is much faulted, though, and a series of roughly north-south extensional faults are present from Gad Cliff to Durlston Head. Many such faults can be conveniently seen in the Kimmeridge coastal section. They are present in the Portland Stone cliffs of the south of the Isle of Purbeck, but are less accessible except by boat or by rock climbing. It is not known whether these are sealed satisfactorily at depth. They may not always be so. The Kimmeridge Oil Shales are the most famous of the oil shales in Britain, and are important as the source rock for North Sea Oil. At present there is a general interest, about possible hydraulic fracturing of oil shales deep underground and extracting large quantities of gas. 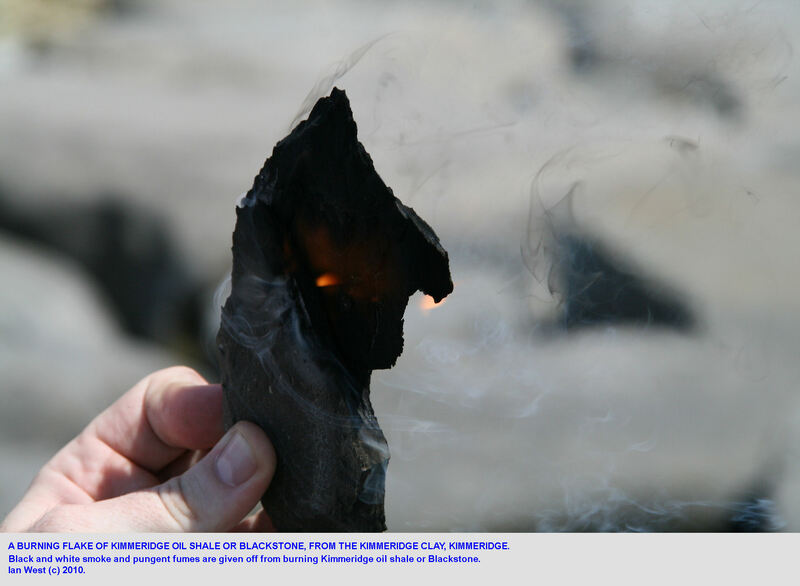 The Kimmeridge oil shale in the south of England might, at first, seem an obvious target. However, these oil shales are not deeply buried and not thermally mature at the coast. It is not proven that they are mature in the deepest part of the basin. However, they may be submature, or possibly almost becoming mature in places. In general they may not be buried deeply enough to be of direct use for gas production by hydraulic fracturing. The bituminous shales of the Lower Lias, however, are much deeper in east Dorset and the adjacent English Channel. They have become thermally mature and have resulted in the formation of oil. At the coastal exposures at Lyme Regis these are not so obviously rich in organic matters as is the Kimmeridge Clay with its well-defined oil shale. An anecdotal point is the Shales-with-Beef of the Lower Lias, though are sufficiently rich in TOC to have been involved in a natural cliff fire, the well-known "Lyme Volcano" of about 1908. 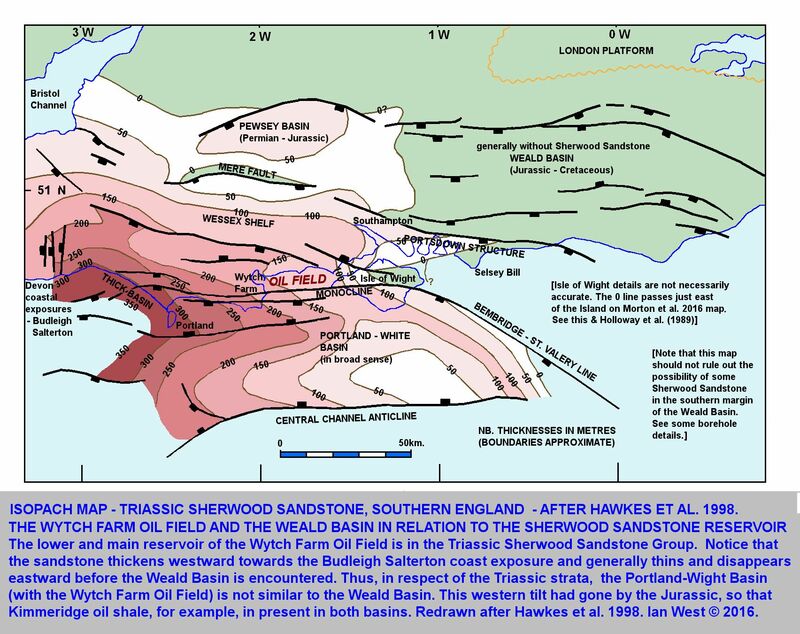 The Liassic shales are the source oil for oil of the Wytch Farm oilfield, and this oil has migrated northward, probably in the Cretaceous, into the Sherwood Sandstone reservoir south of Bournemouth. It is not known whether hydraulic fracturing of Liassic strata would be worthwhile. If undertaken it would presumably be in or near the deep parts of the English Channel Basin, as shown on maps here. A possible problem is that most of the Jurassic of the Dorset coast, and thus probably offshore, is fractured with many extensional faults. The most obvious of these are the approximately north-south trending faults seen in the cliff sections at Kimmeridge and elsewhere. 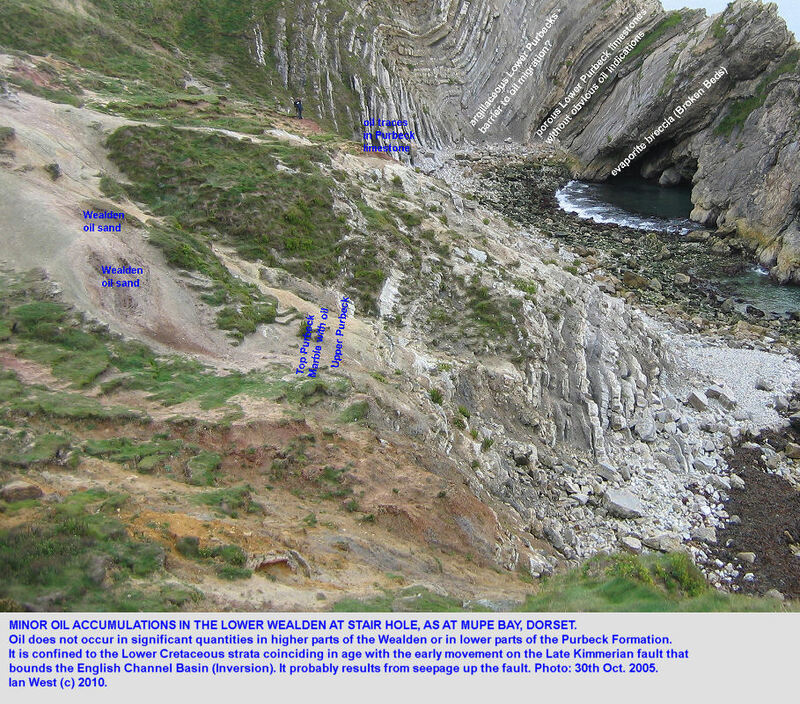 Some faults in the region are growth faults, the most well-known of which is the Eype Mouth Fault, which has been active since early Jurassic times. Obtaining commercial quantities of gas offshore by hydraulic fracturing may never happen. It is less likely on the land of Dorset. In Dorset the kerogens in the outcrop samples of the Kimmeridge Clay to the south of the Purbeck - Isle of Wight Disturbance, that is the Kimmeridge cliffs, are relatively more mature than those to the north of that line, for example the Ringstead Bay area ( Ebukanson and Kinghorn, 1986). The Kimmeridge Clay thickness in the cliff sections and boreholes at Kimmeridge was thought to be about 508m according to (Cox and Gallois (1981). Later work, taking into account seismic and borehole data suggested that the full thickness of the formation was between 535m and 585m (Gallois, 2000). 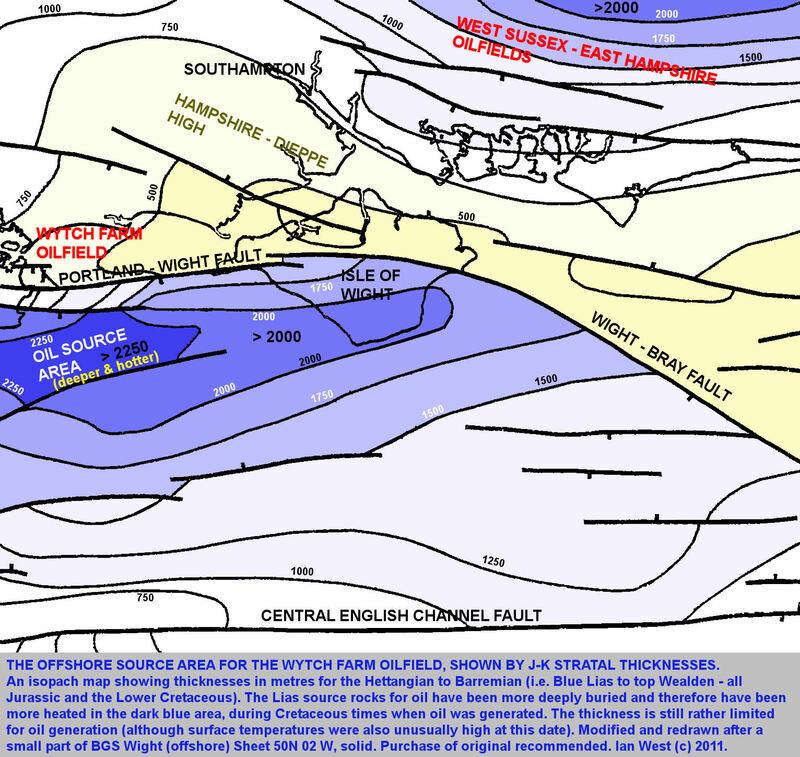 A single exact figure is unlikely to be obtained because the coast section is not far south of the Purbeck - Isle of Wight disturbance, and thus, in this not completely stable area, there are differences in detail in thicknesses east (further out towards the basin) and west (i.e. Brandy Bay, closer to the fault). The Kimmeridge Clay thickness is about 7% thinner at Swanworth Quarry (Gallois, 2000). Kerogen samples for the lower parts of the Kimmeridge Clay Formation and those from the whole of the Oxford Clay Formation in the Arreton No. 2 Borehole of the Isle of Wight are marginally mature (estimated R0: 0.50 to 0.60%) (Ebukanson and Kinghorn, 1986). Thus, the most mature contemporaneous organic matter in the Kimmeridge Clay and the Oxford Clay occur in two parts of southern England: the Isle of Wight area to the south of the line of disturbance and the central part of the Weald of Sussex and Kent (Ebukanson and Kinghorn, 1986). The Lower Lias is mature over a wider area. Kerogen in the lower part of the Lower Lias (Shales-with-Beef etc?) is in (at least just in)the catagenic stage in Arreton-2, Winteborne Kingston, Marchwood, Winchester-1, Henfield, Warlingham and Penshurst Wells. However, Lower Lias samples are in the main phase of oil generation only at Arreton-2, Henfield, Winchester-1 and Penshurst (Ebukanson and Kinghorn, 1986). The most mature Lower Lias sections occur in Arreton-2 (estimated R0: up to 0.90%) and Penshurst (estimated R0: up to 0.85). At Penshurst the total Jurassic thickness is 1.259m. 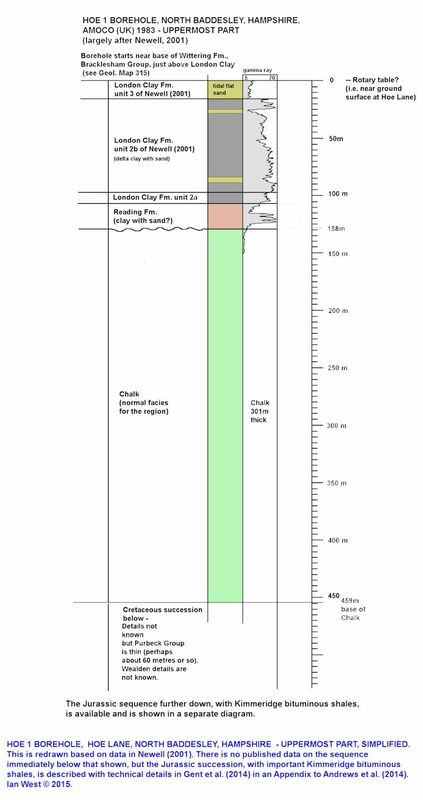 It is interesting to note that Ebukanson and Kinghorn, (1986) drew attention to the areas of the central Weald in the eastern part of West Sussex and southern Surrey where the total Jurassic attains thicknesses over 1.424m, according to Gallois (1965). Here they expected higher maturity values than reported for the Penshurst Borehole. Somerset Coalfield or Bristol - Somerset Basin. The Somerset Coalfield stretches from the Mendips north to Pensford and Timsbury, and is centered around the town of Radstock, near Midsomer Norton. The southernmost part of the coalfield extends south to the Mendip Hills. It is an area well-known as a Coal Measures inlier just north of the Variscan Front of the Mendips. It is north of major thrust faults. Help from various people is much appreciated. I would to thank the many people who have kindly provided guidance drilling activities etc. I am obliged to Michael Cox for assisting me by correcting the labelling on a photograph of the Hoe Lane Wellsite. I am very grateful to the staff of BP who have showed me various aspects of the Wytch Farm Oilfield at various times in the past 30 years or so and who have kindly provided brochures and maps etc. I appreciate meeting geological staff of Perenco UK Ltd, who now are the owners of this majr oilfield. I am very grateful to Dr. Ramues Gallois for providing information on his publications and for placing many of these online. These notes are independent and are for information and are not intended to represent any particular viewpoit. I much appreciate the advice and help of my daughter, Tonya Loades of Bartley West, Chartered Surveyors. at his private address, Benedict Close, Romsey, kindly supported by the School of Ocean and Earth Science, Southampton University,and web-hosted by courtesy of the iSolutions of Southampton University. Any views expressed here are those of the author and do not necessarily represent the views of Southampton University. The website is written privately from Romsey, unfunded and with no staff other than the author, but generously and freely published by Southampton University.